I had a great Christmas present last year. 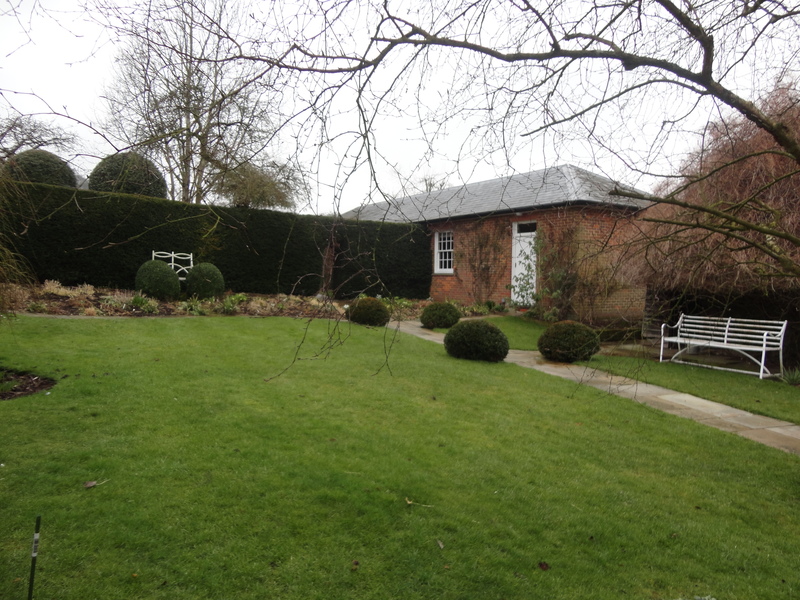 Mia and Millie had booked a Newberry Tours weekend away for me to visit Great Missenden in Buckinghamshire; I was even invited to take the lady of the house along with me. 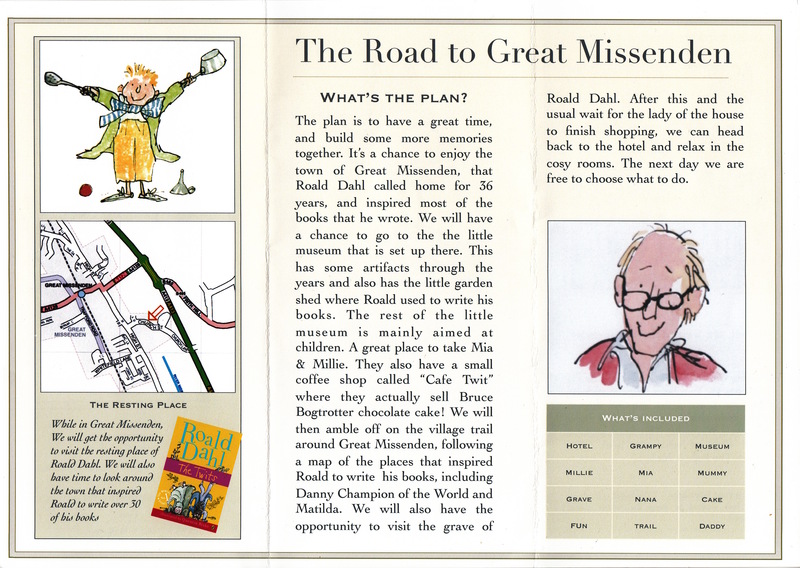 For those not in the know, Great Missenden was the home for over 30 years of Roald Dahl, without doubt, the greatest ever writer of children’s books. The date we had agreed on was 24th – 26th February 2013. 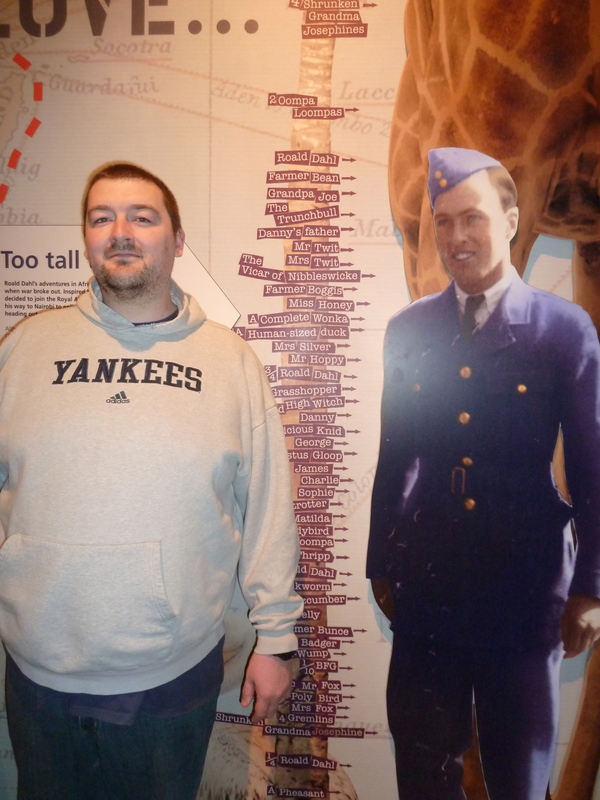 The founder member and director is Gaz Newberry, a travel guru who specialises in low cost, high interest travel. He is sitting on an offshore account (Sully Island) with funding to undertake his next major trip to his 50th country, a remarkable record. The sixty-one days since Christmas have been hard, keeping the excitement under control. 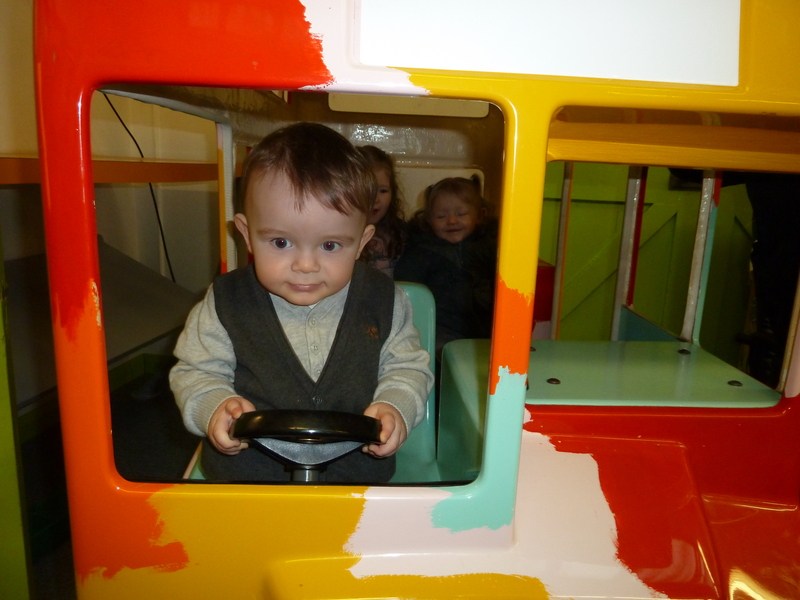 When the day arrived, we anticipated having a wonderful time and at the last minute, family circumstances meant that we were able to take Alfie, our grandson with us. The lady of the house was quite beside herself and I made a mental note to pick up some ‘Tena for ladies’, just in case she lost control completely. She is not Roald Dahl’s greatest fan, but a weekend away with her favourite son Gaz and daughter in law Keri and all three grandchildren, Princess Mia, little angel Millie and Alfie was almost too much to cope with. She was so very excited. When she saw me packing my case the night before she expressed surprise and admitted that she had quite forgotten I had been invited. 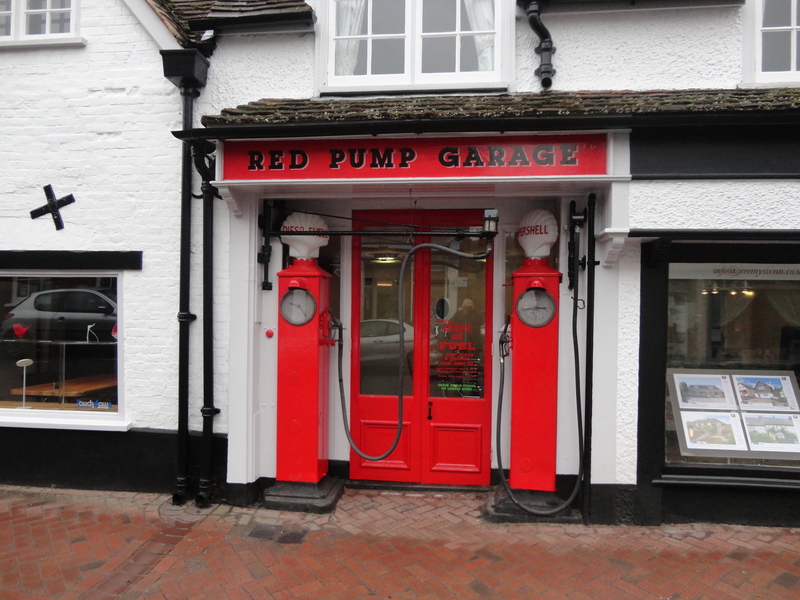 We left home on Sunday morning for the drive to Great Missenden. 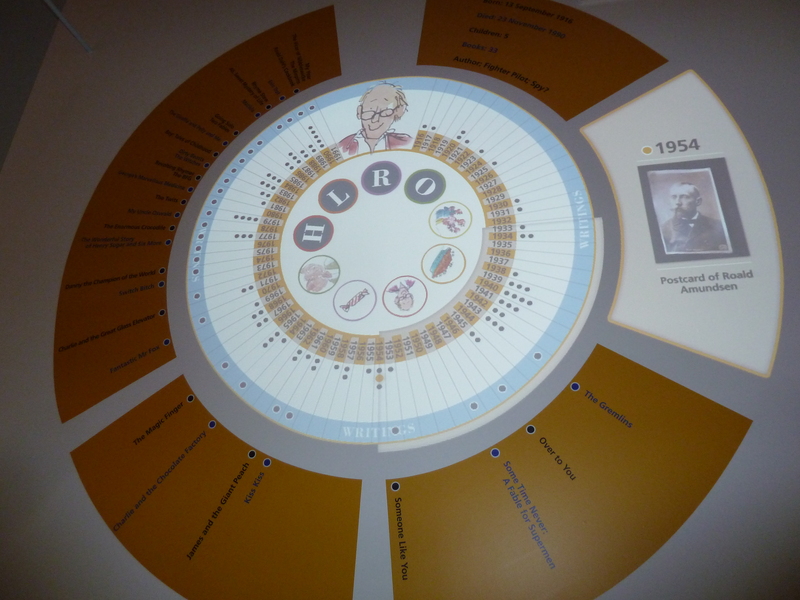 We had a Newberry Tours hotel booking – the de Vere Hotel in High Wycombe. It is set amidst beautiful Chiltern countryside and has beautiful landscaped gardens overlooking the Hughenden Valley; the hotel combines a classical mansion house with purpose-built contemporary buildings. It has 18 acres of grounds to explore; sadly for us it was far too cold and our itinerary was far too full to enjoy these properly. Uplands House is in a prime position for visiting attractions and places of interest in London, Buckinghamshire, Berkshire and Oxfordshire and Great Missenden of course! The journey was uneventful, although we had only just passed Newport, when the lady of the house announced that she needed to pass water! Great! I knew that it was too far to go back and drive around Roath Park Lake, but when I suggested that the Severn Bridge was coming up, she gave me a stern look and announced that it was a bathroom that she needed! We drove on and she began dozing off, so I managed to drive past a few before she woke up just before Leigh Delamere, so I had to pull in. As she made her way out of the car, she muttered … ‘You be good a good boy chubby chops and Alfie and I looked at each other not quite sure who she was talking to! We both smiled, before waving to Mia and Millie in the car next to us. They are such sweet girls and all three of them get on so well. The lady of the house returned, suitably refreshed and granted me permission to move on. We were really excited when we saw the hotel, we recognised it at once from the brochure Newberry Tours had provided. We booked in and were soon settled. We had decided to eat out and found The Blacksmith’s Arms, a little eating place, where all seven of us enjoyed a meal and each other’s company. We all slept well back in the hotel and looked forward to our time in Great Missenden the following day. Great Missenden is a large village in the Misbourne Valley in the Chiltern Hills in Buckinghamshire, England, situated between the towns of Amershan and Wendover. 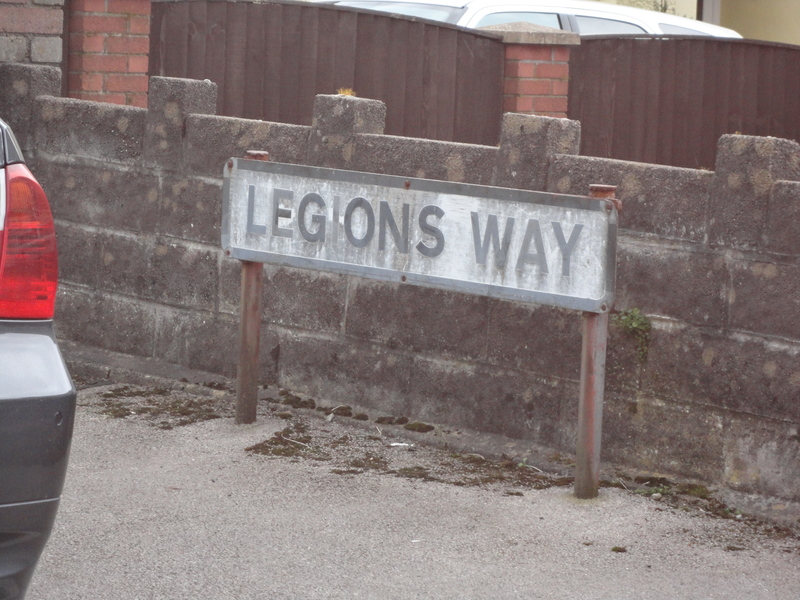 The narrow High Street is by-passed by the main A413 London to Aylesbury Road. 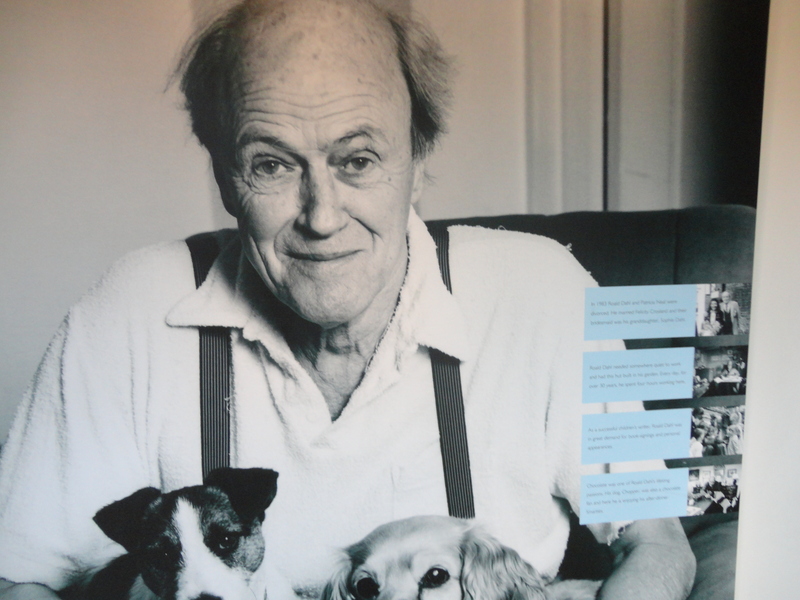 The village is now best known as home to the late Roald Dahl. the internationally famous children’s author. 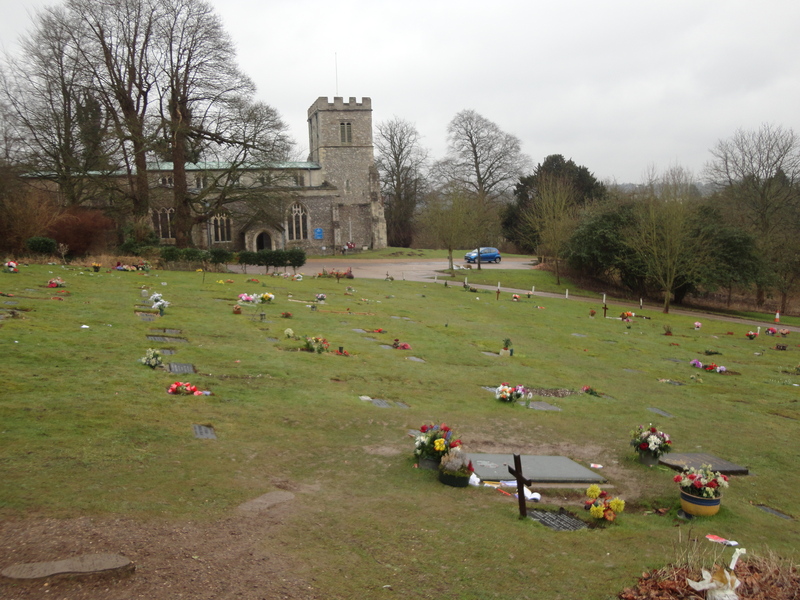 Great Missenden lay on a major route between the Midlands and London. Several coaching inns, particularly the Red Lion and The George, provided rest and refreshment for travellers and their horses. Once the coaches stopped running Great Missenden declined in importance and prosperity, becoming an agricultural village. 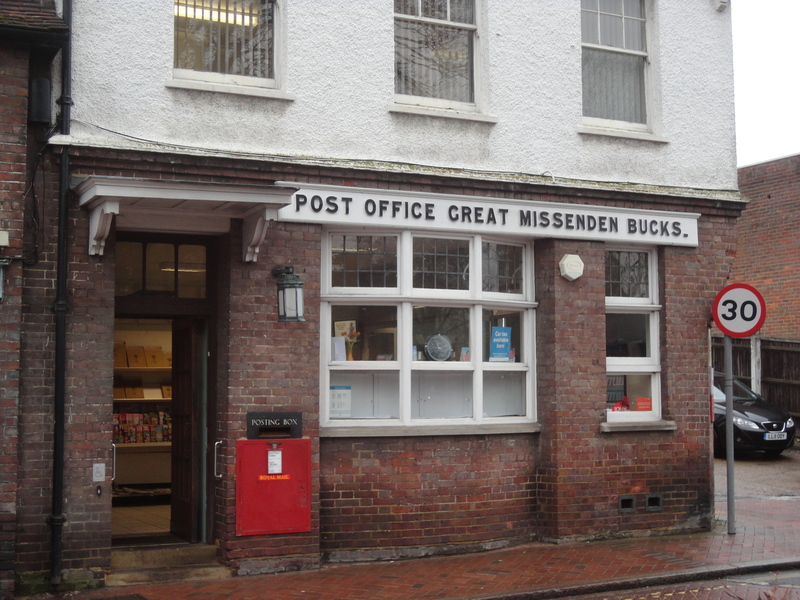 Over the years Great Missenden has become a commuter village for London with writers, entertainers and even Prime Ministers among the residents. The village is overlooked by the mediaeval parish church of St Peter and St Paul. Its position away from the village suggests an earlier settlement round the church with a move to its present location in the early Middle Ages. One special dwelling in the village, Gipsy House, was Dahl’s home from 1954 until his death in 1990 and many local scenes and characters are reflected in his work. 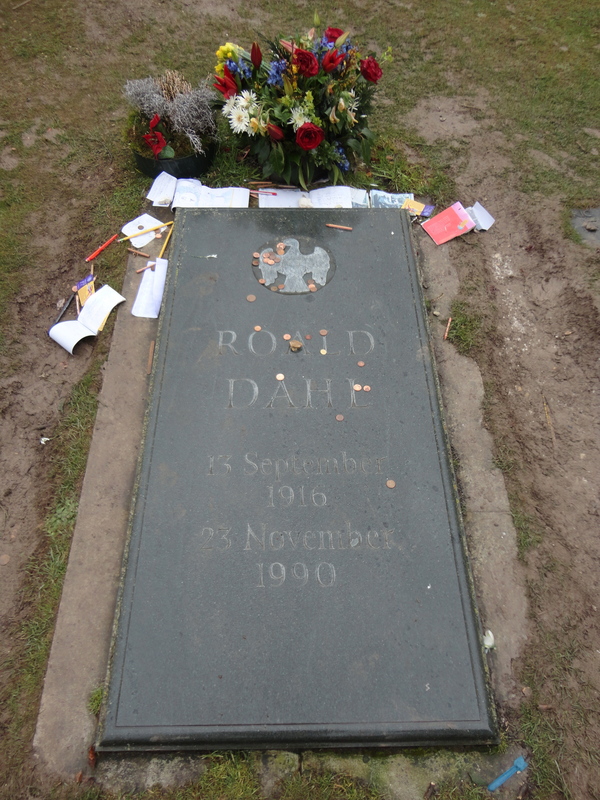 Dahl is buried in the church just outside the village and children still leave toys and flowers at his grave. 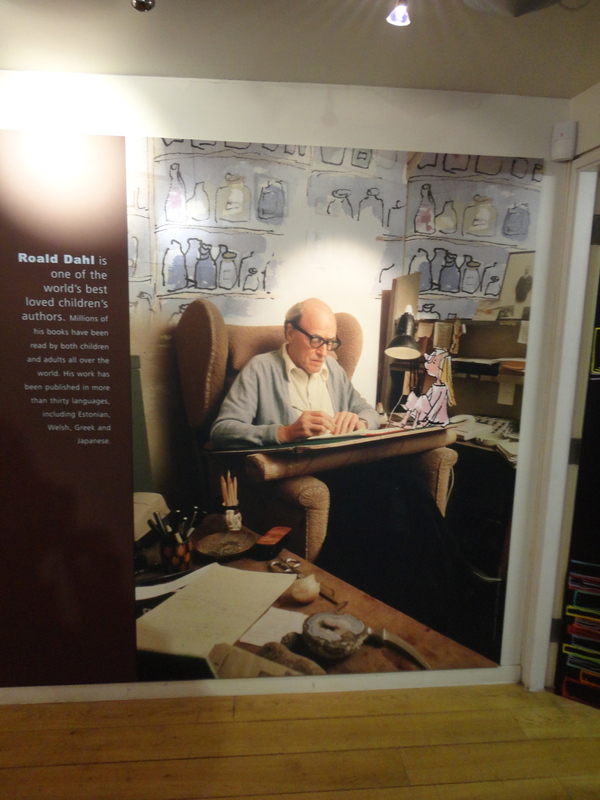 In June 2005 the Roald Dahl Museum and Story Centre opened in Great Missenden to honour the work of Dahl. 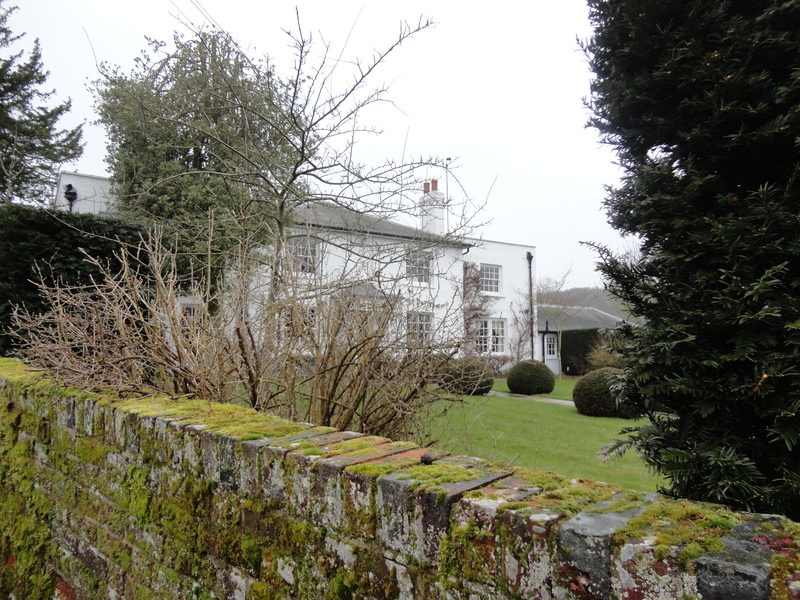 Great Missenden was also temporarily home to Robert Louis Stephenson, the writer of famous works such as Treasure Island and the Strange Case of Dr Jekyll and Mr. Hyde. 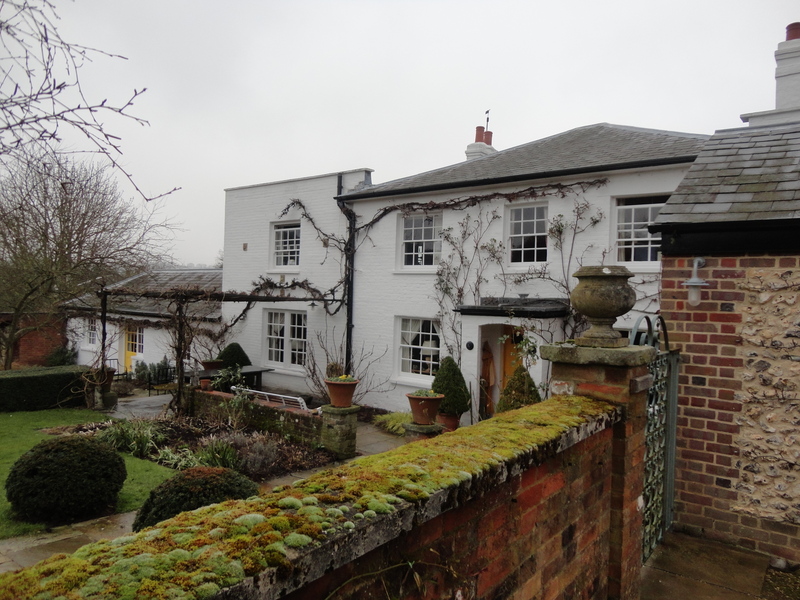 It is currently home to actor Geoffrey Palmernd his wife Sally. Model turned cookery show presenter Sophie Dahl (granddaughter of Roald Dahl) and her husband jazz musician Jamie Cullen aso live in the village. The drive from the hotel took little more than fifteen minutes. 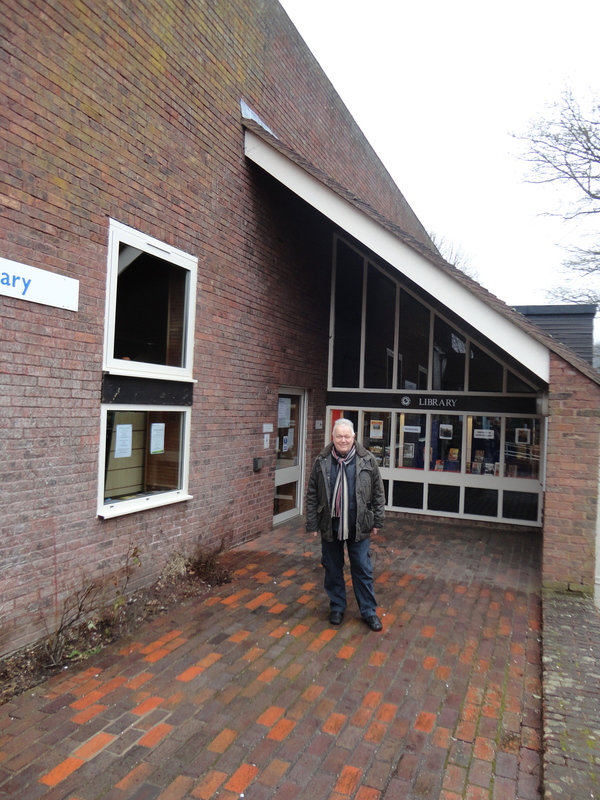 We first visited the little library in the village that inspired Dahl to write Matilda. It’s the story of a little girl, with terrible parents, who loves to read and strikes up a friendship with her teacher… the lovely Miss Honey. It’s a superb read. 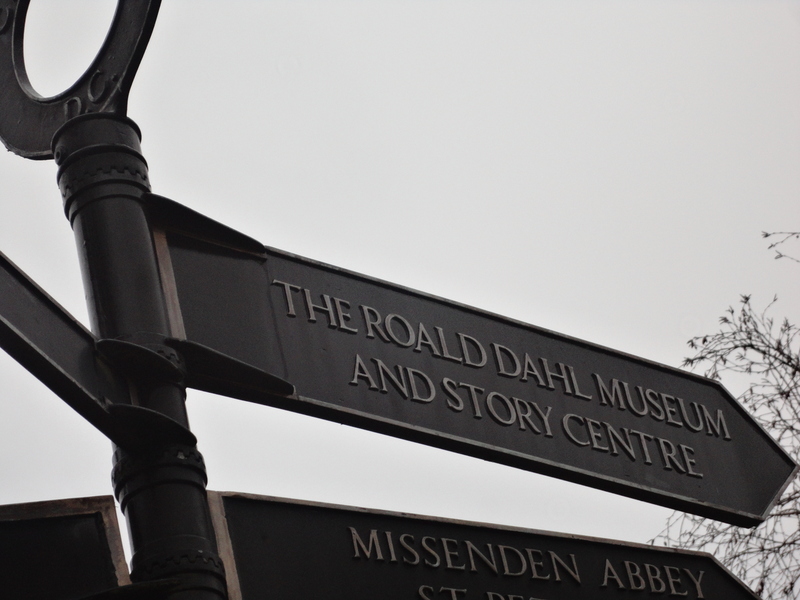 We knew the Roald Dahl museum was closed on a Monday, so it gave us a chance just to explore the village and visit the great man’s grave. 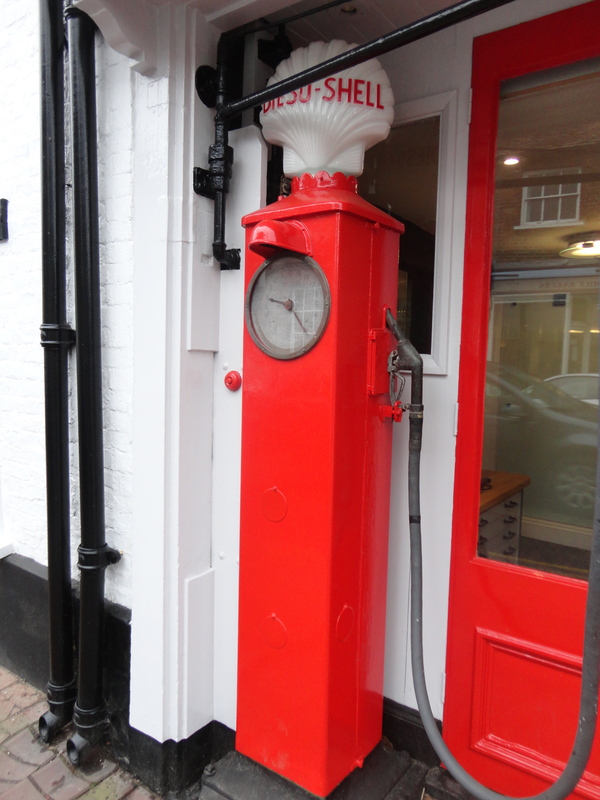 Walking along the High Street we noticed an old preserved garage with two petrol pumps. These were the inspiration for Danny Champion of the World, my second favourite book to read to kids. Danny the Champion of the World is the much-loved tale of how Danny and his father outwitted the mean Mr. Victor Hazell. Danny thinks his dad is the most marvellous and exciting father a boy could wish for, much like me I guess, my dad was wonderful too. Life is happy and peaceful in the little petrol filling station and their gipsy caravan, until one day Danny discovers his dad has been breaking the law. What’s more, soon Danny has to join his father as they attempt to pull off a daring and devilish plot against horrible, red-faced Mr. Victor Hazell. 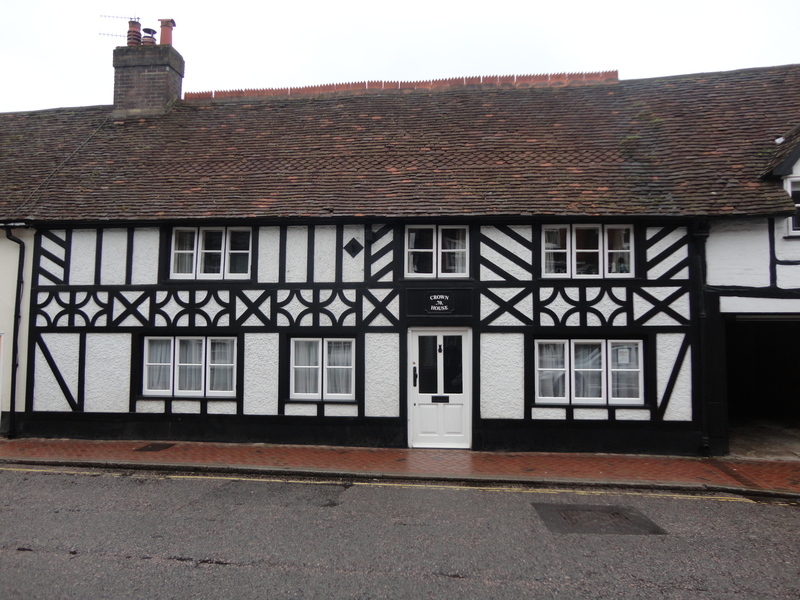 We admired the museum from the outside and then looked across the road at the timber-framed building called Crown House, 70 High Street. 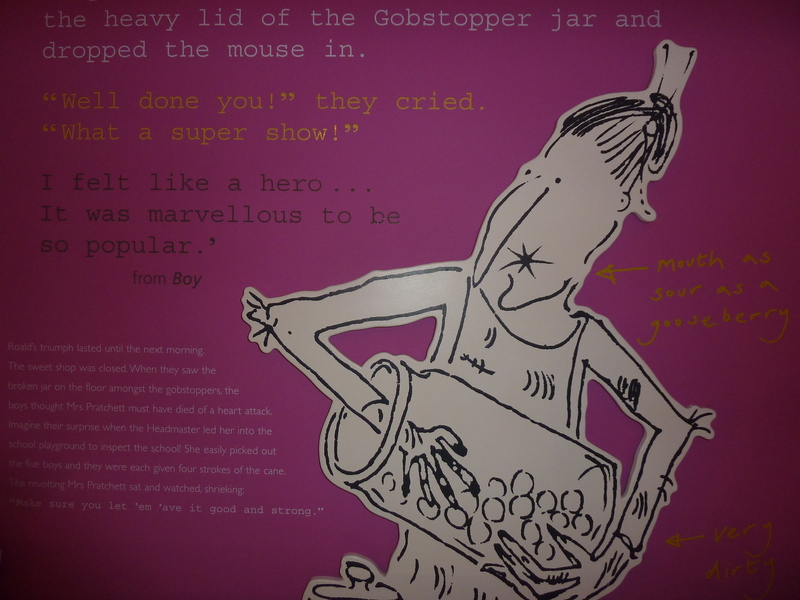 This was Roald Dahl’s inspiration for Sophie’s ‘norphanage’ in The BFG. 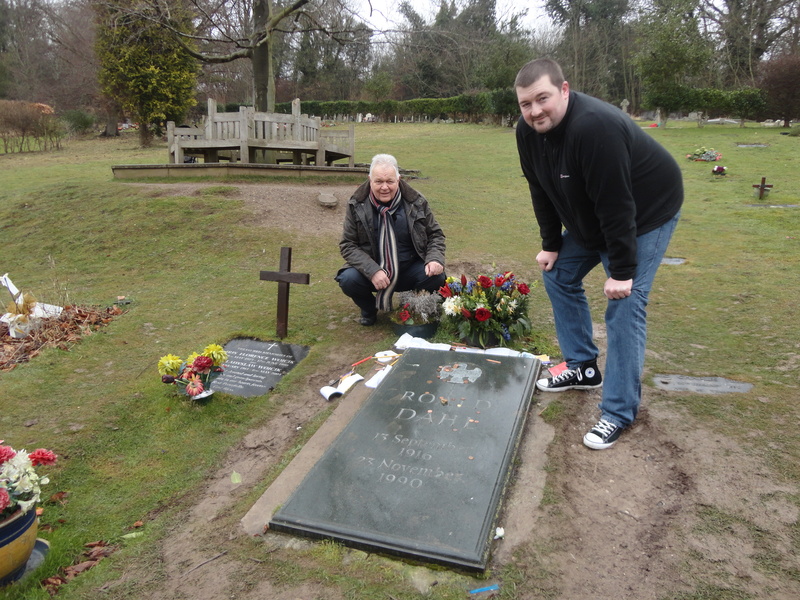 From here we strolled up to the church to visit the grave of Roald Dahl. 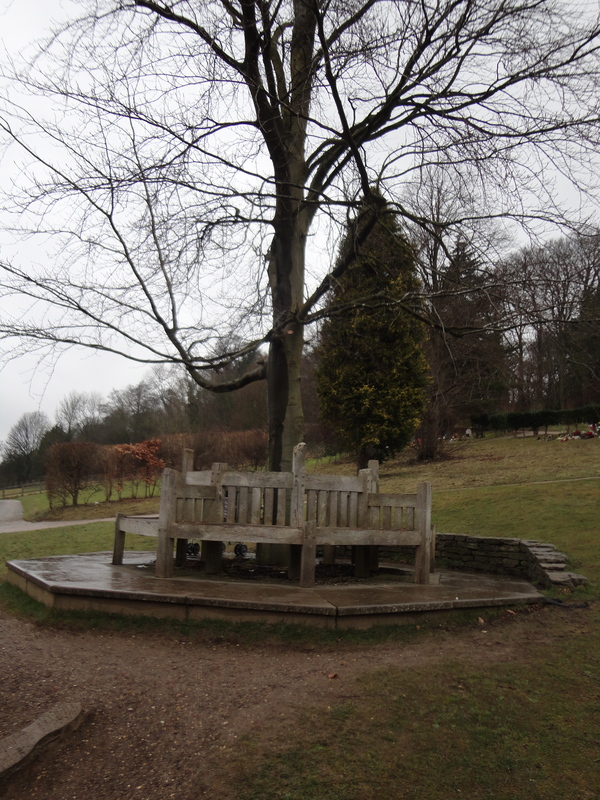 Near his final resting place there is a commemorative seat, which nestles under a tree and contains the names of all the author’s children, and there are some giant footprints leading from the seat to the actual grave… Some children had left pieces of writing and letters and there were a number of coins of the actual grave. We were not sure what they were about! 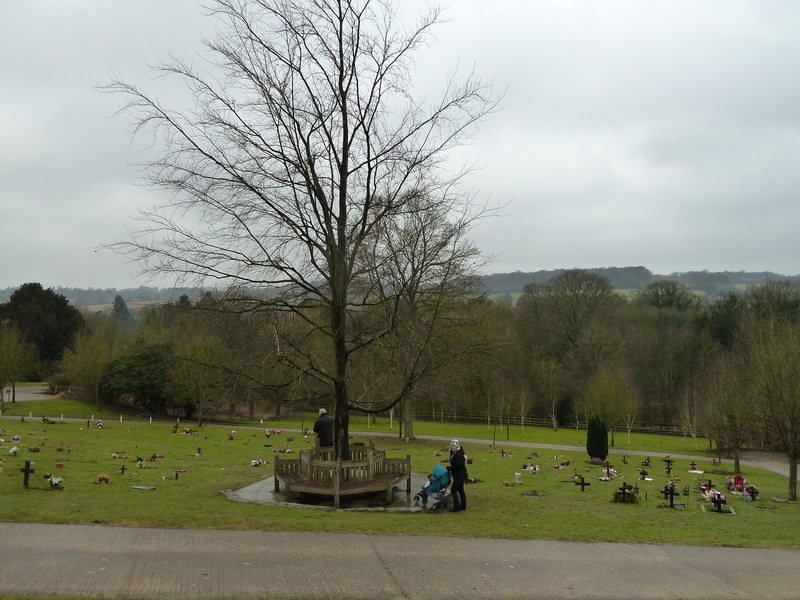 It was very cold, so sitting here, enjoying the peace of this small village graveyard and the spectacular view, was not really an option; so we made our way back to the village and enjoyed a nice cup of tea in the village bake house. Alfie and Millie were asleep for most of the time, but their chance will come as they grow older to discover more about the great man… and I hope I have many opportunities to share with them the magic of the stories. 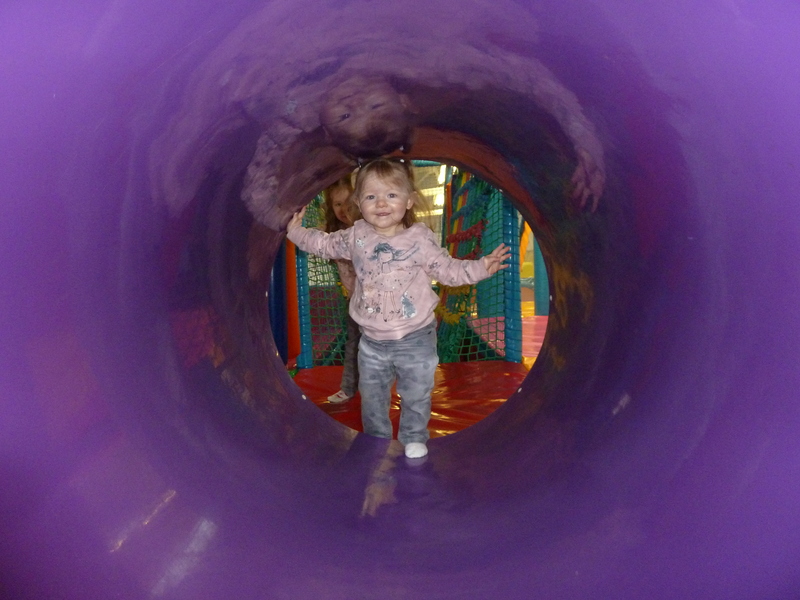 Over the last 3 years Playtrain has become High Wycombe and the surrounding area’s premier children’s activity centre. 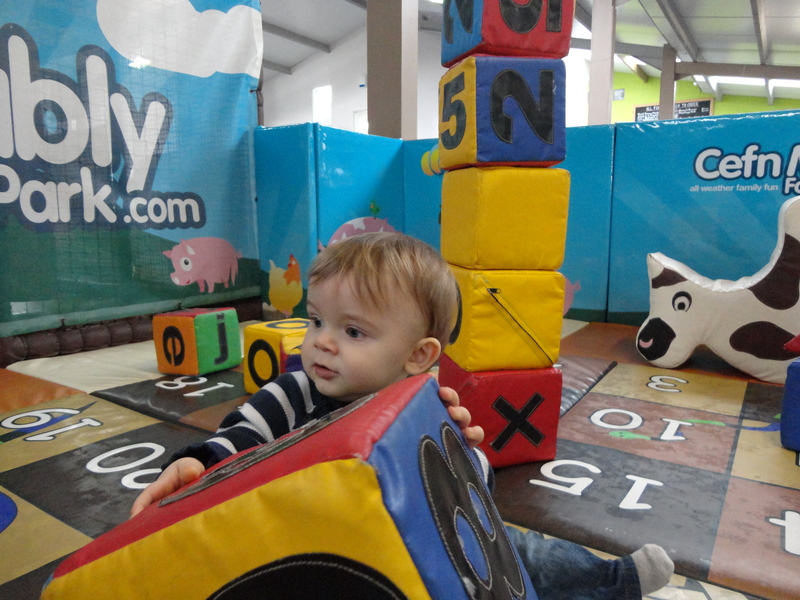 We have all that you and your under 8’s could need for a few hours of fun, food and entertainment. It seemed to good to be true and while in reality it was a great place for Mia, Mille and Alfie to enjoy, it did show signs of being very well used!! 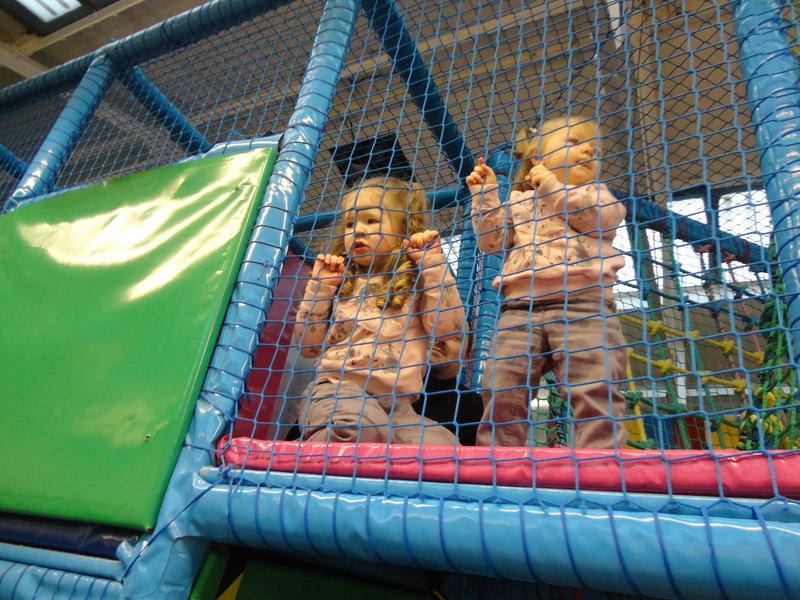 We had a lovely, lovely time and the three little ‘uns had a wonderful time playing and exploring together. 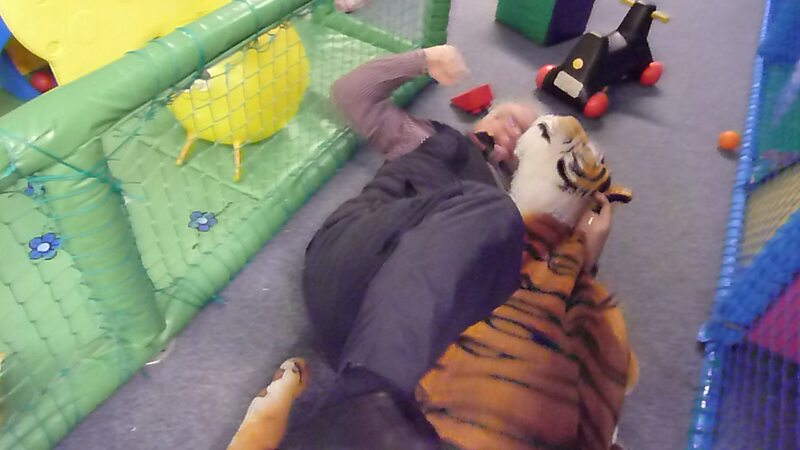 At one time one of the children’s toys became aggressive but fortunately I was able to tackle the angry animal and so protect my grandchildren. They were all tired when we eventually made our way back to the hotel. Once Mia, Millie and Alfie were ready for bed, the lady of the house graciously gave me permission to visit the hotel lounge and watch West Ham play Tottenham Hotspur in the Premier League. I enjoyed this time with Gaz. 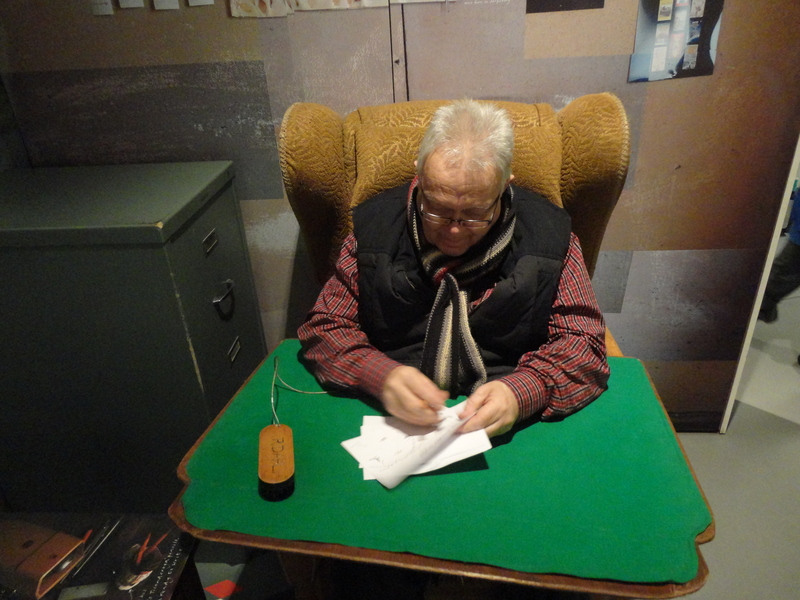 We had set aside Tuesday to visit the Roald Dahl Museum and Story Centre. 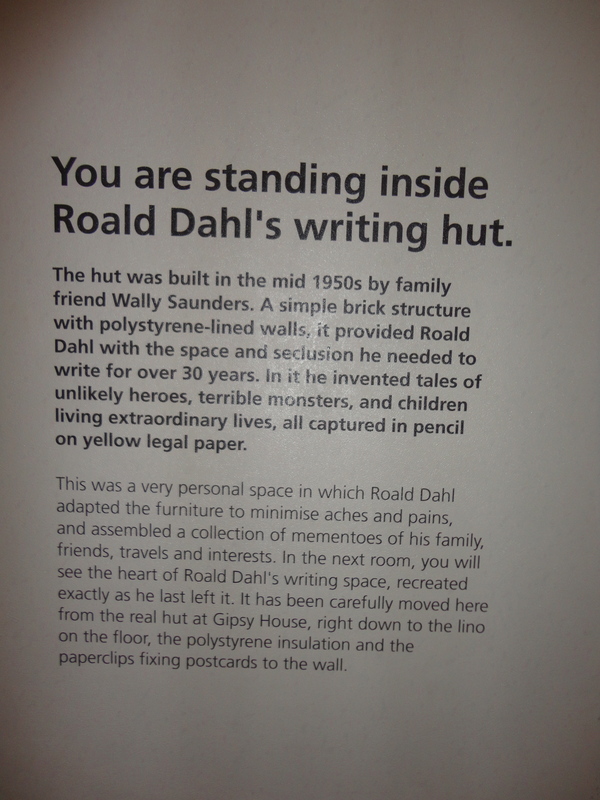 The museum claims it caters for 6 – 12 year olds, how strange when generations of kids who have grown up under Dahl’s spell would surely appreciate a visit to this wonderful little place. 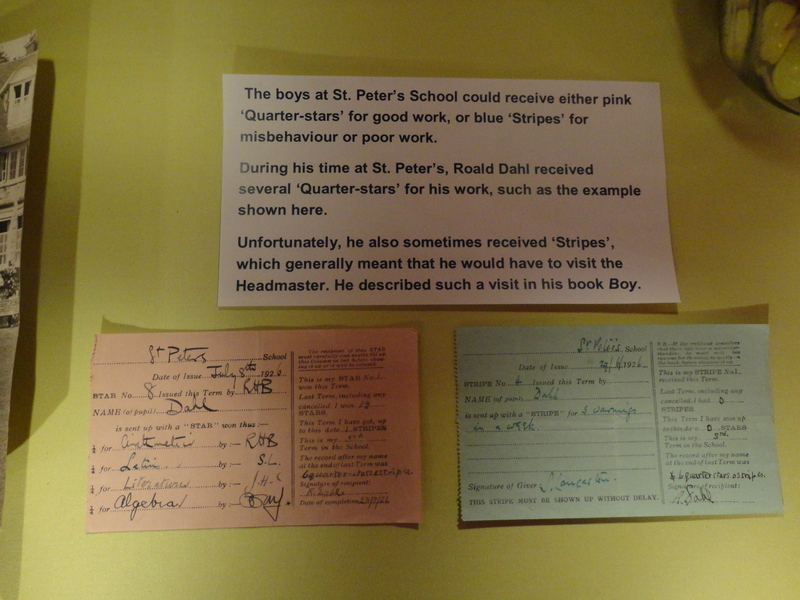 I noticed one little quote in the museum, which said that Roald Dahl never lost his childlike view of the world. I hope that people can think that the same applies to me. After working with children for forty years, I have tried to keep my outlook on life like that of a child – I have tried hard to put away childish things – not always successfully – but looking at the world in the way a child looks at the world can be a wonderful thing. ‘When we are young the world seems so new and there is nothing that can hold us down for long. When we grow old we forget how wonderful this world truly is. When we are children, we find delight in the simple things in life. When we are grown up we think money and possessions are what makes our life have worth. Seems to me we had more wisdom as children than as adults and we knew what life was really about back when we were young. We grew older and colder as time went on, we have forgotten how to be our true selves and lost the spirit of happiness. We easily get consumed by our work, bills and the daily fight to survive. We forget to stop and smell the roses, we forgot how to play and have fun. We worry too much about what other people may think or say if we let loose and be silly. Some of us have even become bitter from all the harshness we have faced in our adult years. That is exactly how I have tried to live my life. 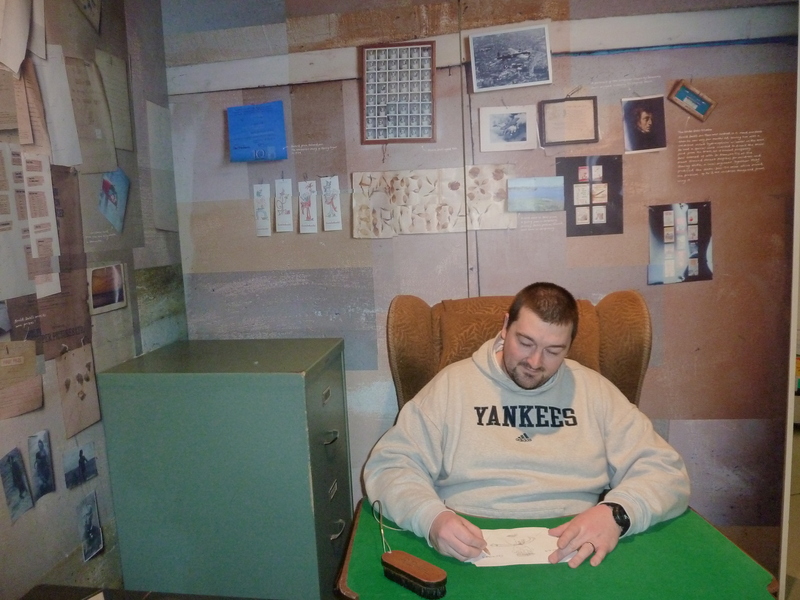 The museum did not let us down! 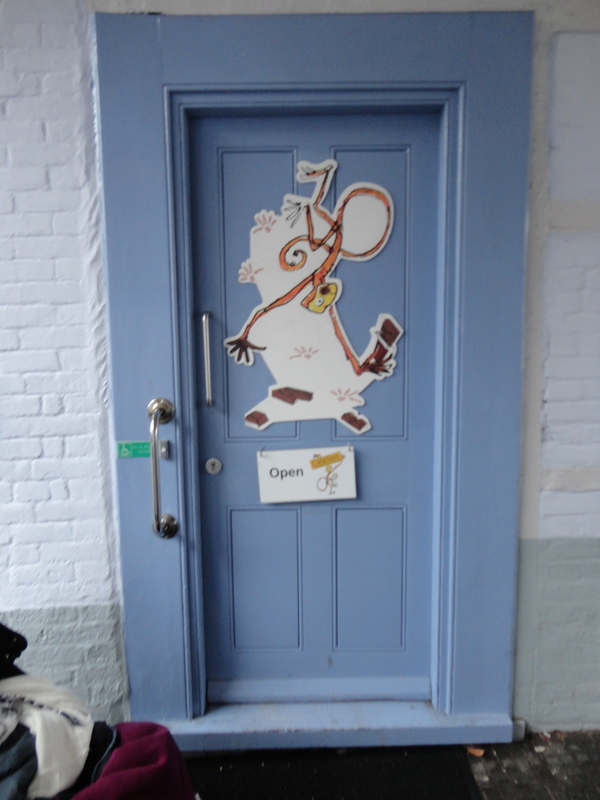 It had a fantastic bookshop, three main areas, one dedicated to BOY, my favourite book and another with an exact replica of the little garden building Dahl used to write in, with the genuine contents of the shed exactly as they were the last time he wrote in there… it was really interesting. Also interesting was the fact that Gaz is the same height as Miss Trunchbull and I am the same height as The Vicar of Nibbleswick!! 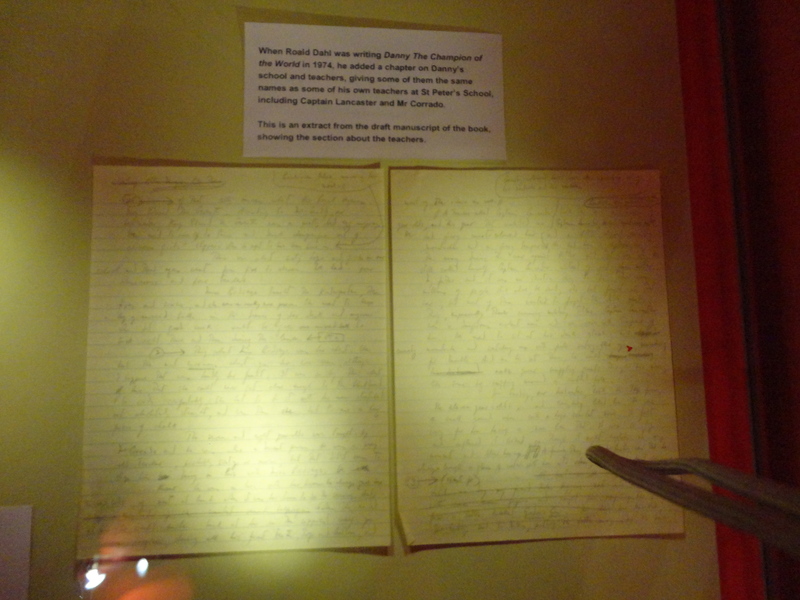 It was so good to see the original drafts, written in pencil, of books like Danny, Champion of the World and some of his Revolting Rhymes, including one that never got into print. There were stars and stripes, like the one he got when his nib broke in St Peter’s and he had the cane from Captain Hardcastle. 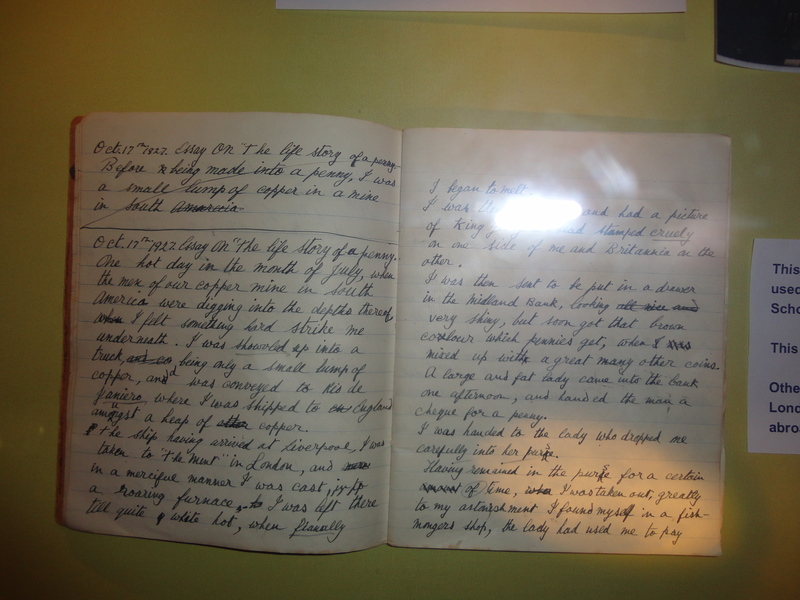 It even had the original copy of The Lost Penny a story he was writing when his nib broke!! 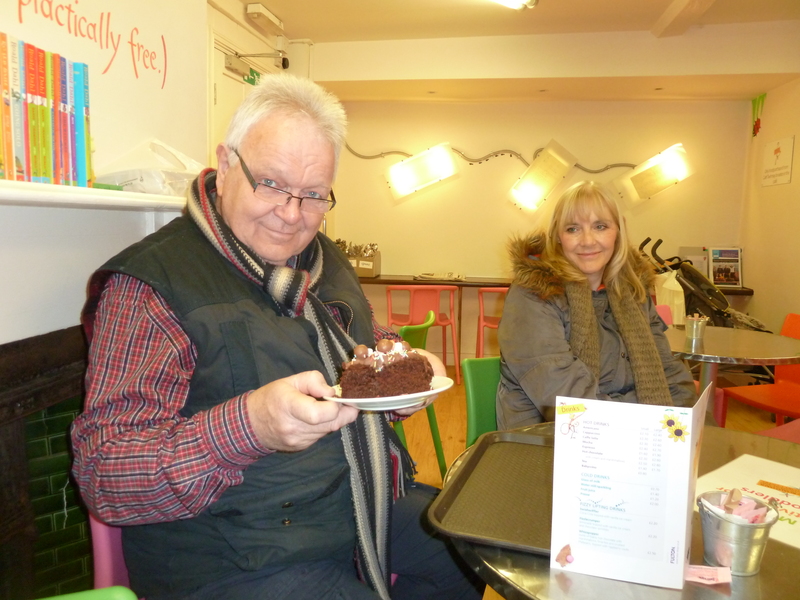 After the museum visit there was one last treat left…a visit to The Café Twit. 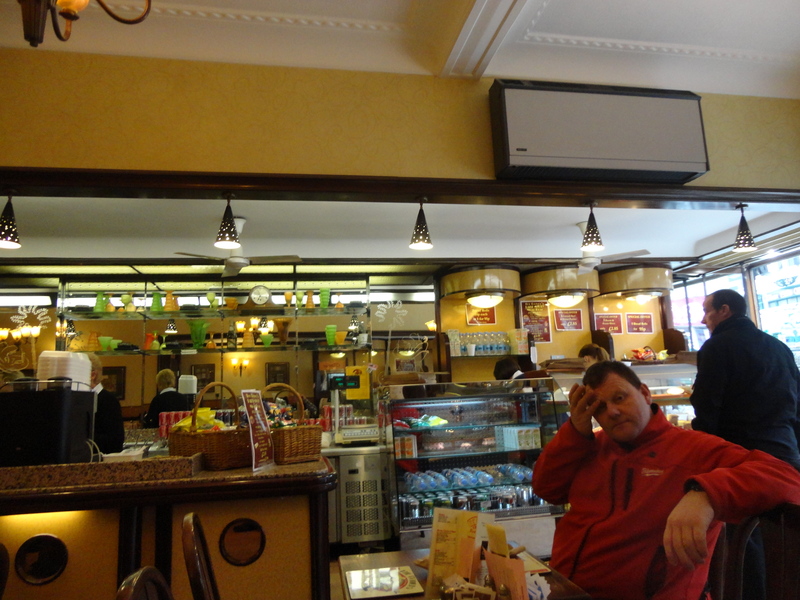 The teashop in the museum was a great place to enjoy a cup of tea. 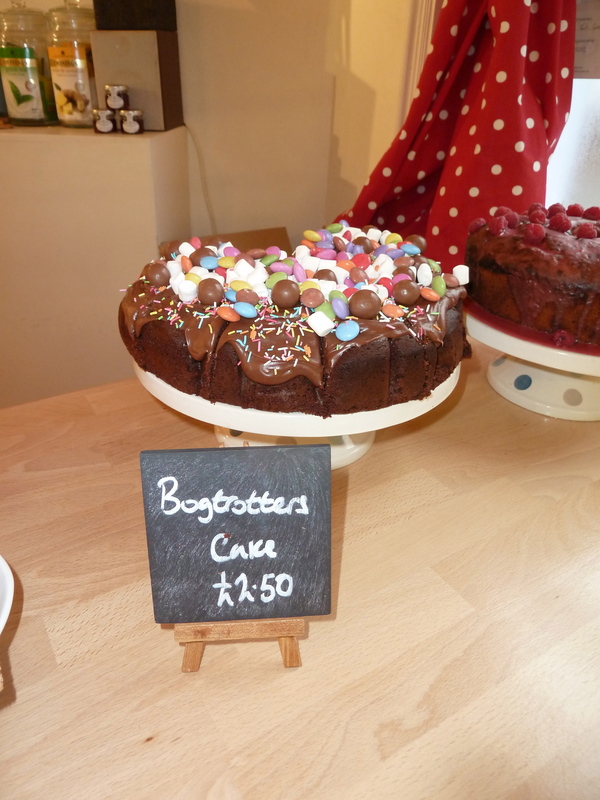 On the menu were BFG cookies, Miss Honey Scones and best of all Bruce Bogtrotter’s cake. Nothing would have prevented me from buying and tasting a piece of this. It was delicious, Matilda would have approved! 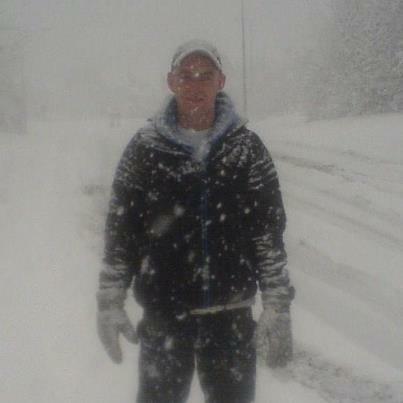 We needed to make our way home soon after. Before we went we drove across the village to see Dahl’s house. 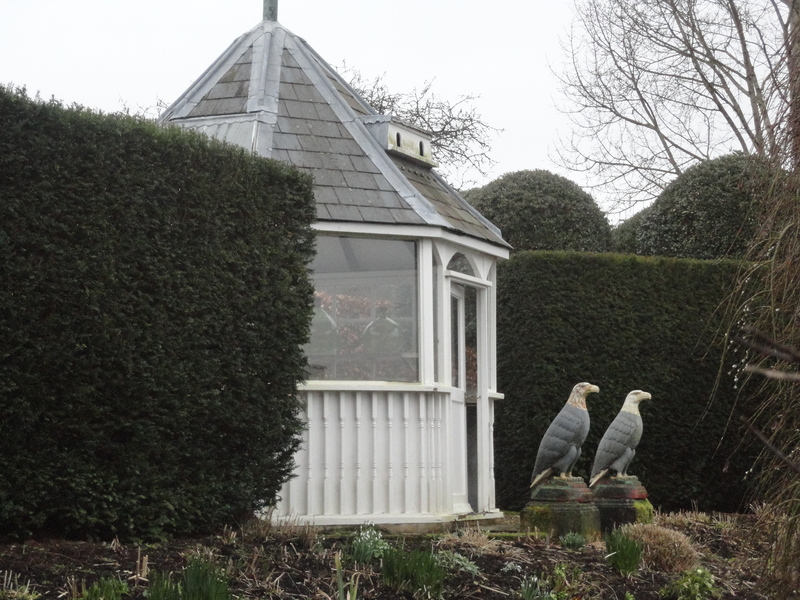 It is a private dwelling now, but I couldn’t resist a quick look…It was beautiful! 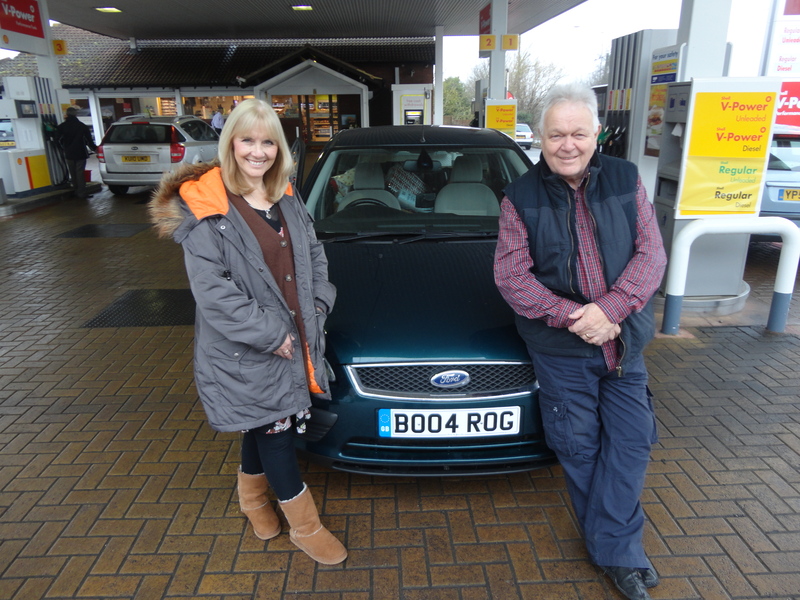 I decided to lead on the drive home and I suggested to Gaz and Keri that we could go up the M40 and branch off on to the A4 and go via Gloucester to avoid paying the toll charge on the bridge. We found the M40 easily enough but after some time, when we saw signs for Coventry, Birmingham and another saying ‘Welcome to Cadbury World’ I began to think either I had missed the A4 sign and turn off or someone had moved it! However we arrived home safely £6.20 better off having not paid the Severn Bridge toll charge, but calculated we had spent 45 minutes extra driving time and just over £7 in petrol. One thing we did get right though was the giving and receiving of a very special Christmas present. Thanks Mia and Millie, it was a truly wonderful gift; it’s one that I will never forget. Thanks to Gaz and Keri and the lady of the house for being such great company and Jas and Kate, for letting us take Alfie. The weather is bitterly cold today and because of that we had planned to spend the day visiting friends rather than spending too much time out in temperatures hovering around zero! 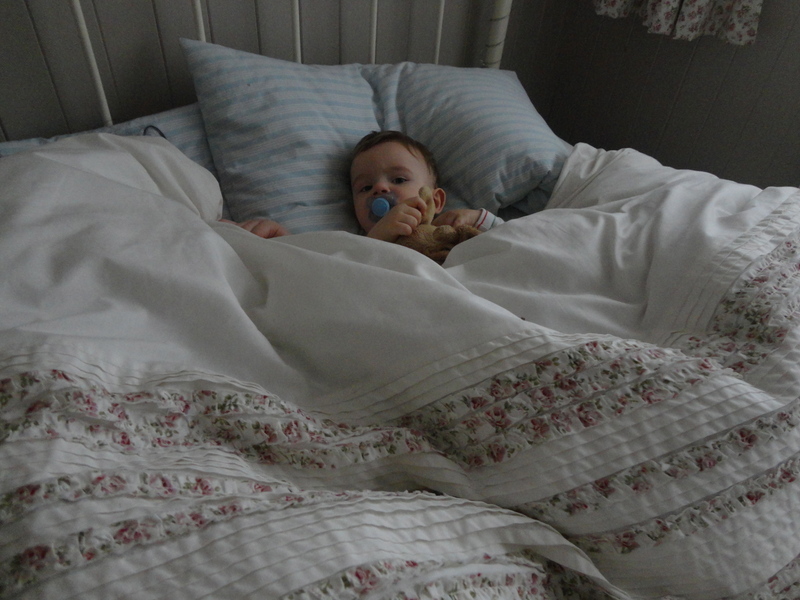 Alfie had spent the night with us and slept in great Aunt Bes’s bed. He didn’t seem to be in all that much of a rush to get up and was happy snoozing and singing quietly. The lady of the house had got up and given him a drink, but despite the empty bottle Alfie was happy. The lady of the house had lined up Alfie’s clothes in order on the bed in the nursery, so when it came to dressing him I started at one end and by the time I reached the pillow end, he was looking very dapper and ready to enjoy the day ahead. After dressing the little lad I gave him his breakfast and we had our first giggle of the day. Alfie sneezed with a mouthful of Weetabix and it went everywhere. He burst out laughing and I joined him while trying to stop him spreading it all over the high chair and my shirt! Aunt Bes had agreed to join us on today’s adventure. 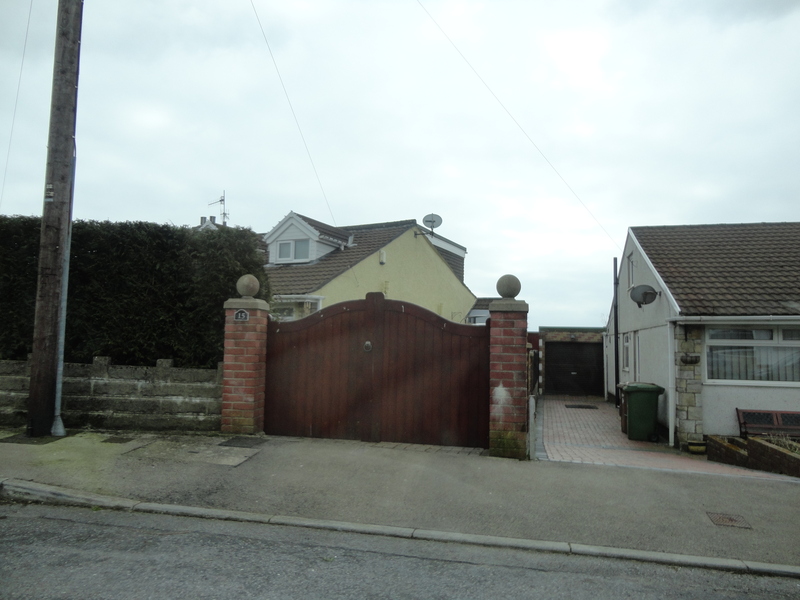 We had planned to visit some very special people called Arthur and Barbara Parker, friends of ours who live in Hengoed in the middle of the South Wales Valleys. 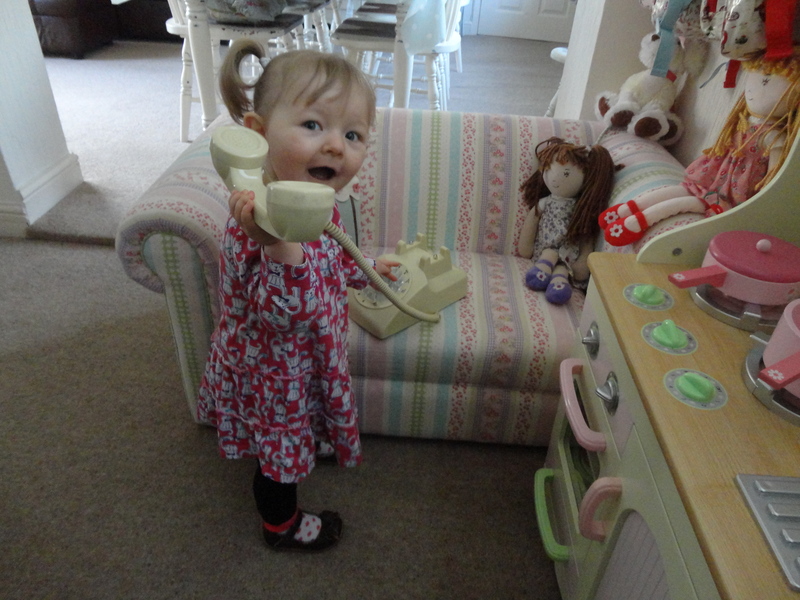 However, when I rang there was no answer and that threw our plans into disarray! I had also planned to show Alfie the house where his mum first lived way back in 1977 and 1978. 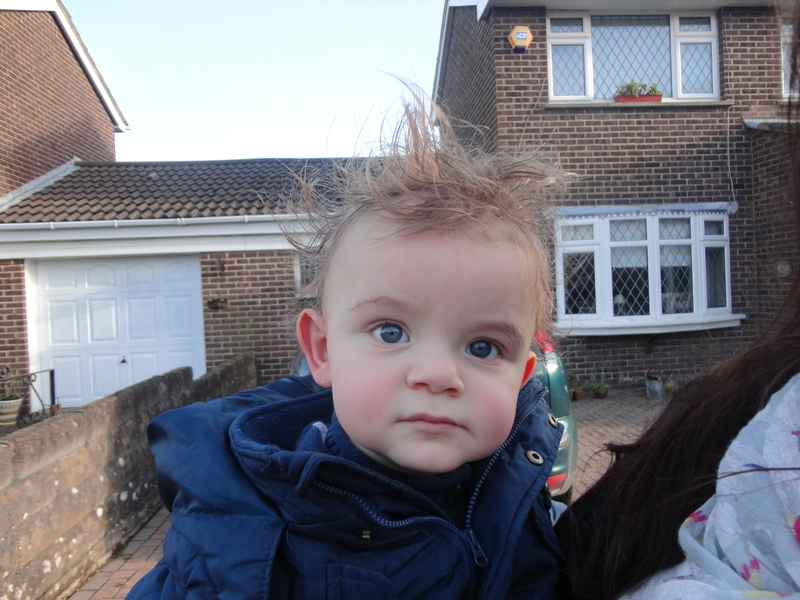 Despite no Parker visit it would be a good day…any day with Alfie is a good day! Arthur and Barbara Parker were friends of ours who lived in an idyllic house in Blackwood in Gwent and were the leaders of a little chapel in Blackwood, which we attended when we first got married. They were wonderful to us a – such a godly couple who taught us so much. It would have been good to see them today. 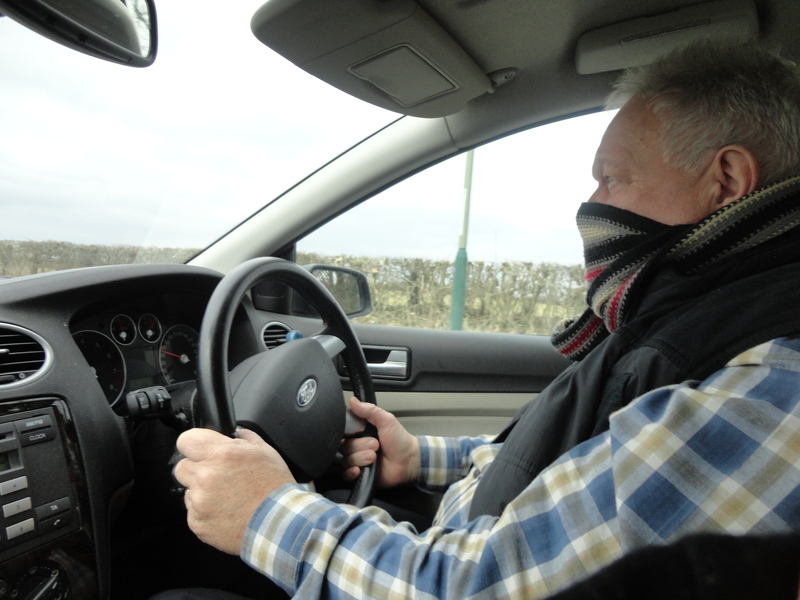 We set off not long after ten, it was freezing and we were glad of the heater in the car. It soon became apparent that Bes had been eating garlic and this called for some evasive action – who has garlic pasta for breakfast? I live in a mad house! We made our way up the A470 before heading off through Caerphilly. We decided to go along the old road through Llanbradach; it was so different from when we used to drive through it years ago. There is a by-pass now and the old village was almost traffic free. We passed the remains of the old viaduct and I again thought of the mistakes of the previous generation, which meant they knocked down so many of these iconic treasures. It must have been a majestic sight crossing the valley. 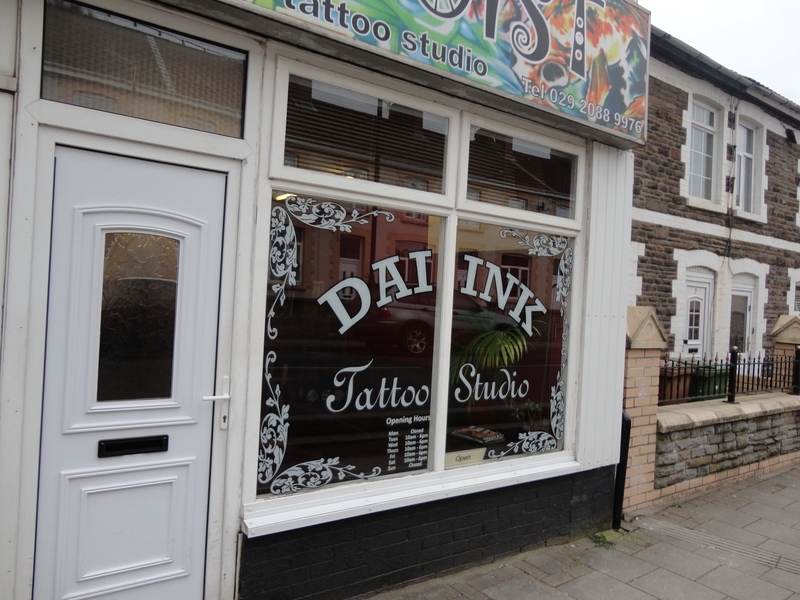 Both Bes and I laughed when we passed Dai Ink’s Tattoo Parlour and we knew we were in the valleys! 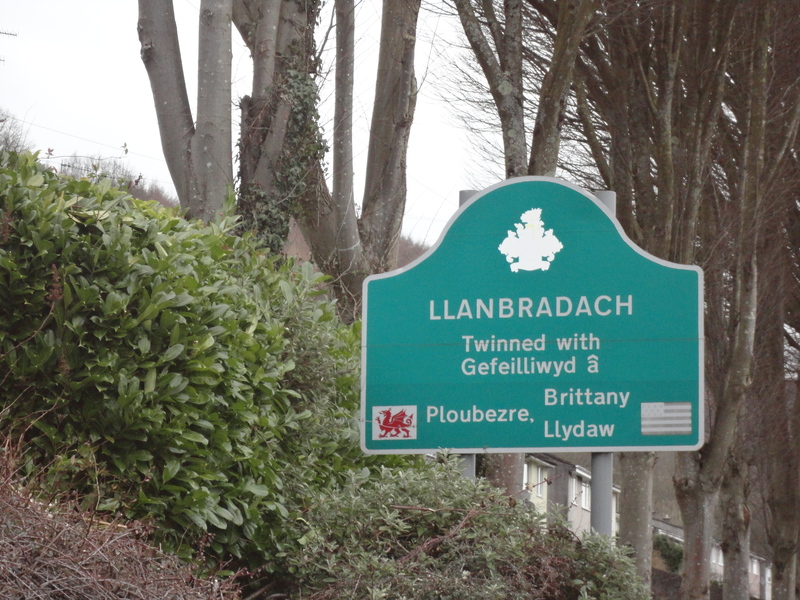 From Llanbradach we drove through to Ystrad Mynach, once our local town. Gone is the old hospital where the lady of the house used to have her medical checks when she was pregnant with Alfie’s mum. A new hospital across the road was evidence of the new life being breathed into these historic valleys. Our journey took us on up the hill towards the village that was our first home Gelligaer. 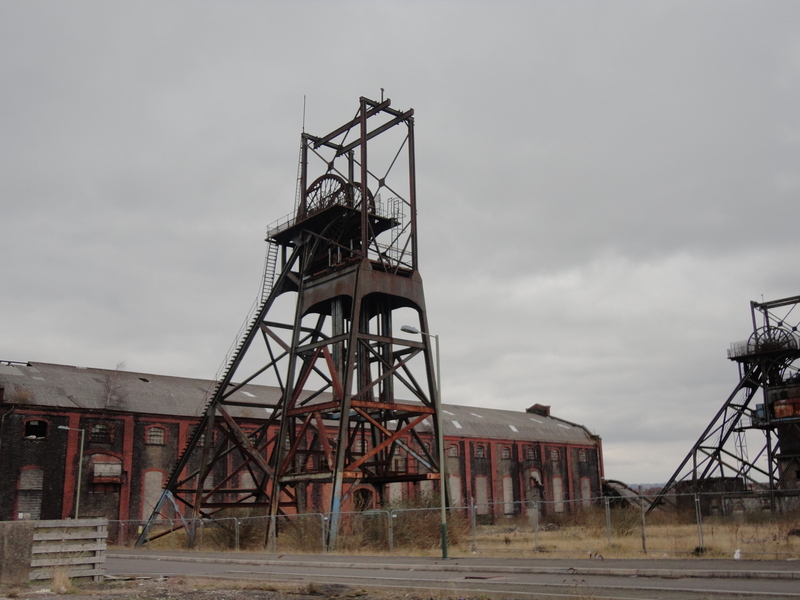 As we passed the old Penallta Colliery, I was thrilled that the old the winding gear and mine buildings were still in place. They were cold and silent now, but still there for us to look at and reminisce about. Across the road the old tip has been converted into a beautiful country park. It was not good when we lived there in the early seventies but now things are looking so much better, it was good to see things improving so much. 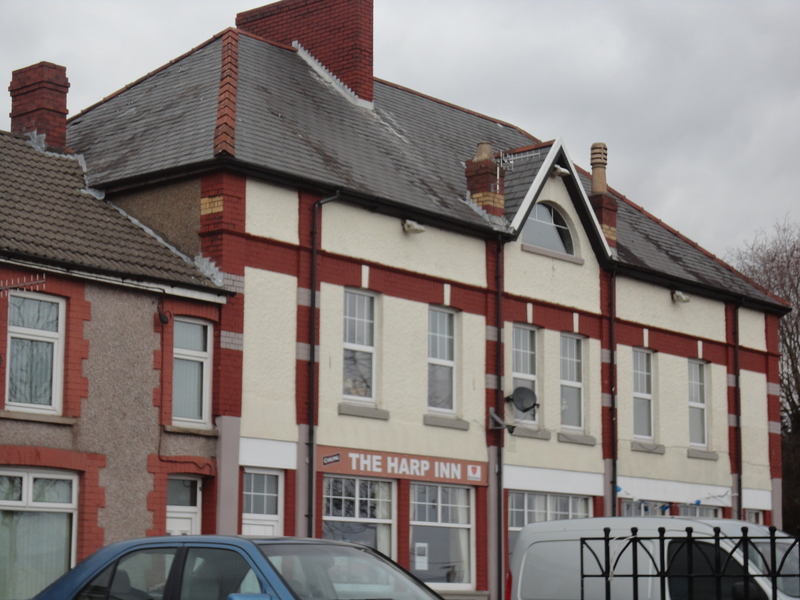 We drove into Gelligaer, passed the Harp Inn, a rough old spit and sawdust place when we lived there but looking much smarter now. Gelligaer is a town and parish in the County Borough of Caerphilly in the Rhymney Valley. 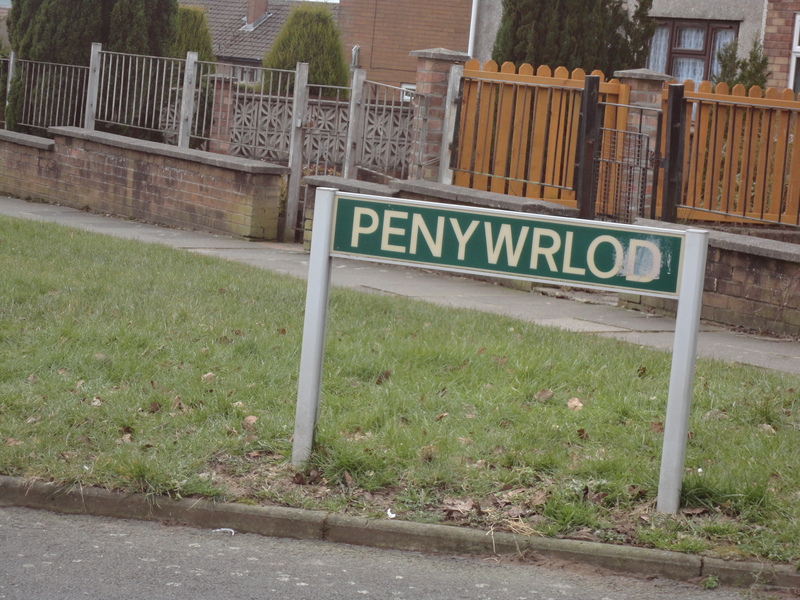 The parish also includes the villages of Cefn Hengoed and Hengoed to the south. Gelligaer is known for its stone Roman Fort, part of a network, believed to have been built between 103 and 111 A.D. and excavated in the early 20th century. We showed Alfie where his Uncle John and Aunty Chris used to live and where Aunty Lisa used to go to school. 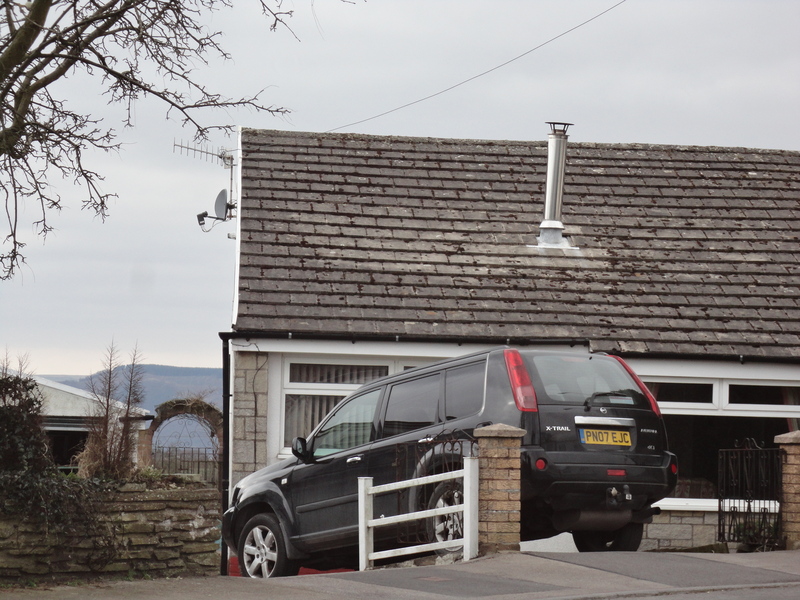 Then we stopped outside Alfie’s mum’s first home a little bungalow perched overlooking some beautiful open countryside just above Llancaiach Fawr an old Stuart country house. 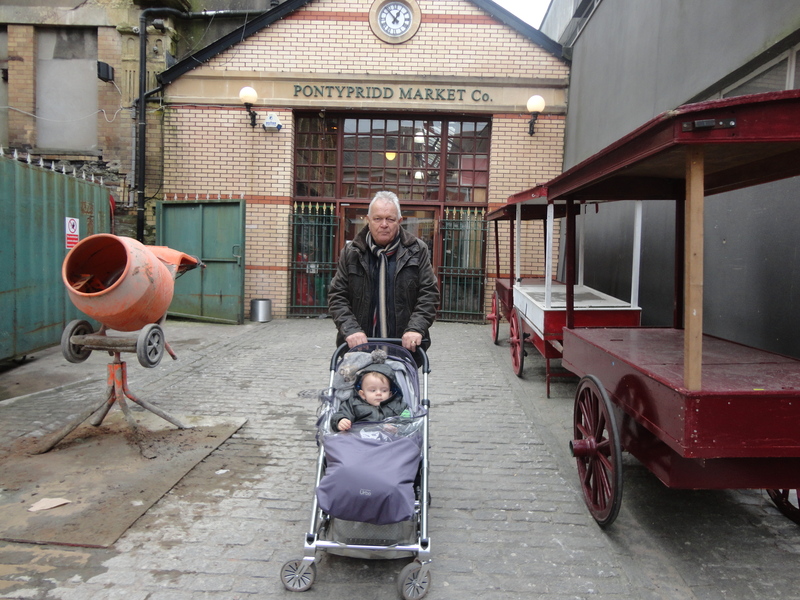 We then moved on to find a place for lunch and we headed towards Pontypridd; Alfie would like a look at this great old valley town, home of Tom Jones. The name Pontypridd is from “Pont-y-tŷ-pridd” the Welsh for “bridge by the earthen house”, a reference to a succession of wooden bridges that formerly spanned the River Taff at this point. The establishment of Pontypridd was assured with the building of the Glamorganshire Canal to serve the coalmines of the Rhondda Valley. 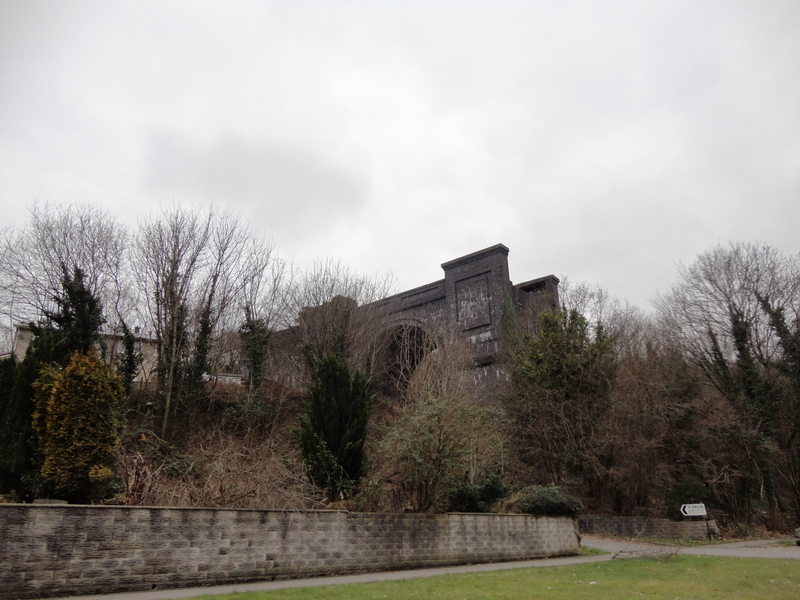 However, the volumes of coal extraction soon brought about the construction of the Taff Vale Railway which, at its peak, resulted in two trains calling at Pontypridd Railway Station every minute. The station is a long single island, at one point the world’s longest railway platform. We parked the car and strolled around the old town. Alfie enjoyed the warmth of his pushchair and liked looking out at the people who passed by. He was singing quietly. 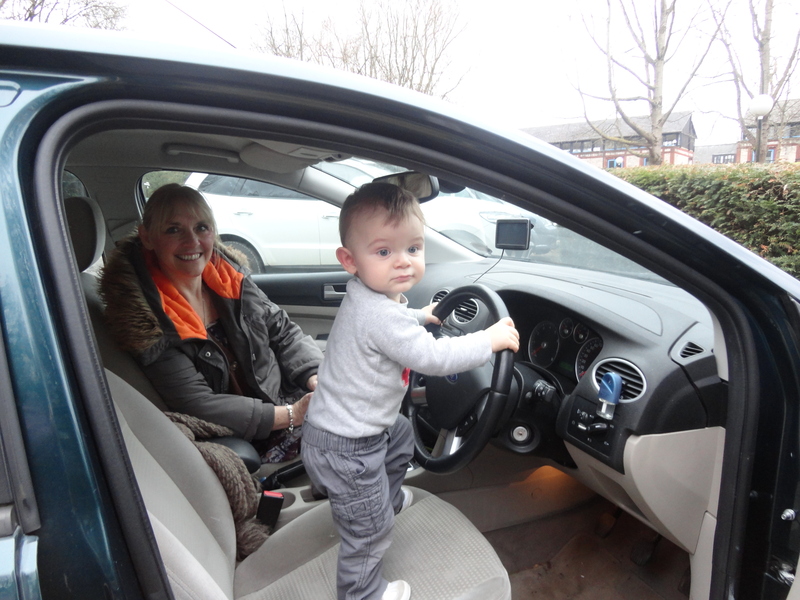 Alfie’s mum had allowed me to use his proper puschair and compared to other weeks I felt like I was driving a Rolls Royce. We looked around the old town for a while taking in the old market. 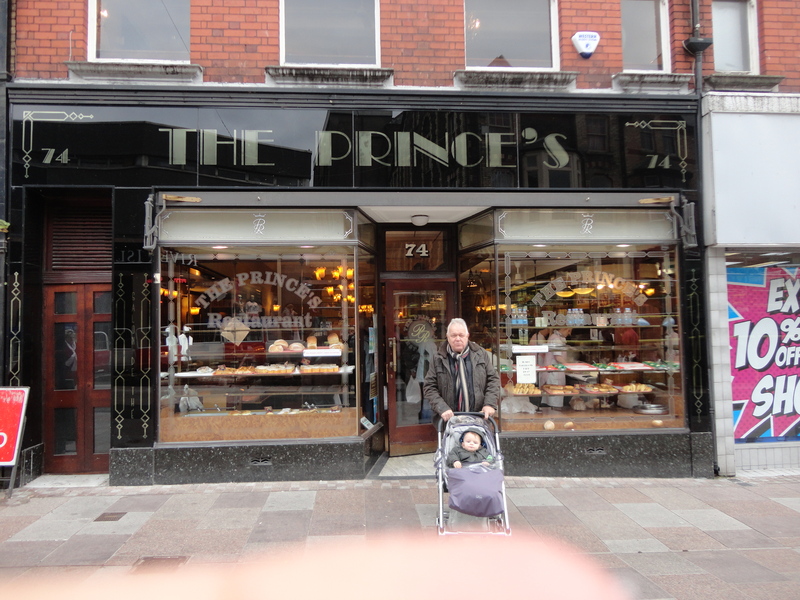 We took a chance on a rather funny looking café called The Prince’s. It turned out to be a real find! 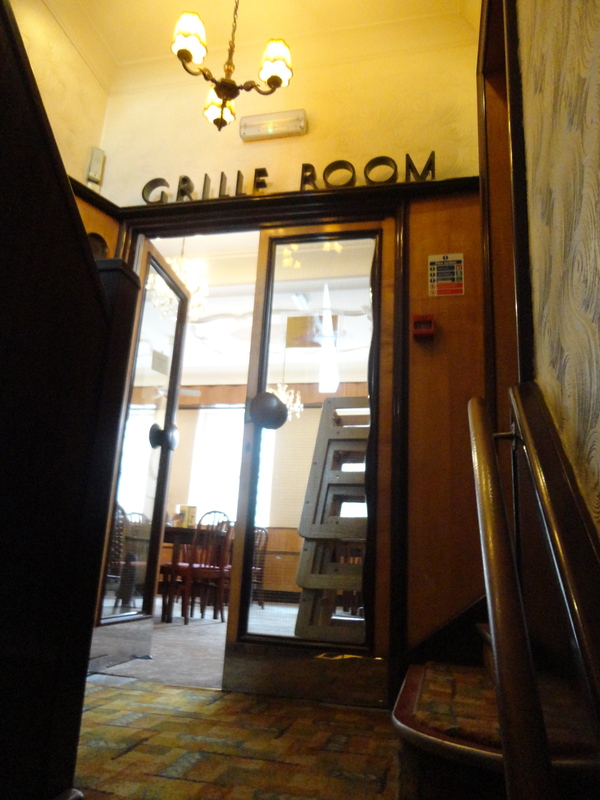 It was like stepping back into to a 1950s American diner, a bit like being in a cinema entrance hall. It was just brilliant. 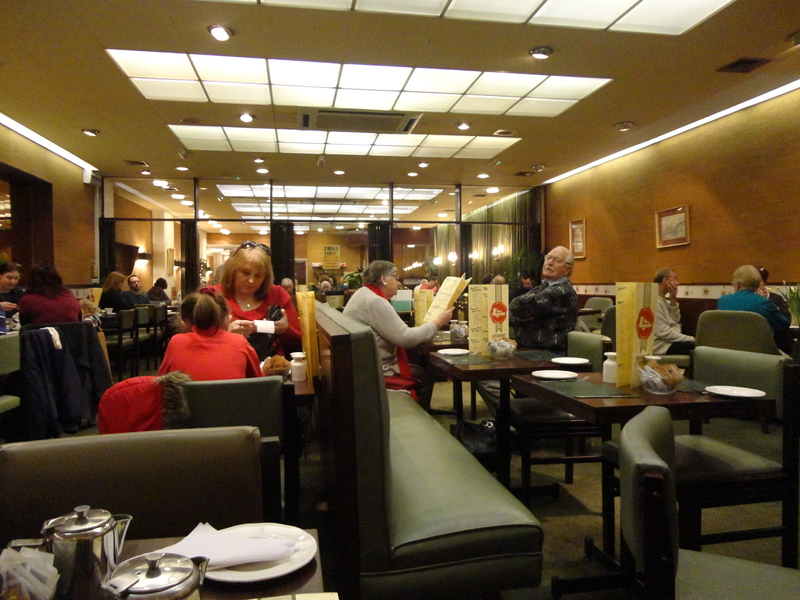 A rather eccentric looking young man found us looking for a seat and he treated us like royalty, putting us in a place he described as ‘my fathers’ table, a table that looked like all the others but it was near the bread slicer and the counter. A really friendly lady of middle age, but with a typical warm valleys personality served us at the table. She spoke to us as if we were old friends. I liked that! 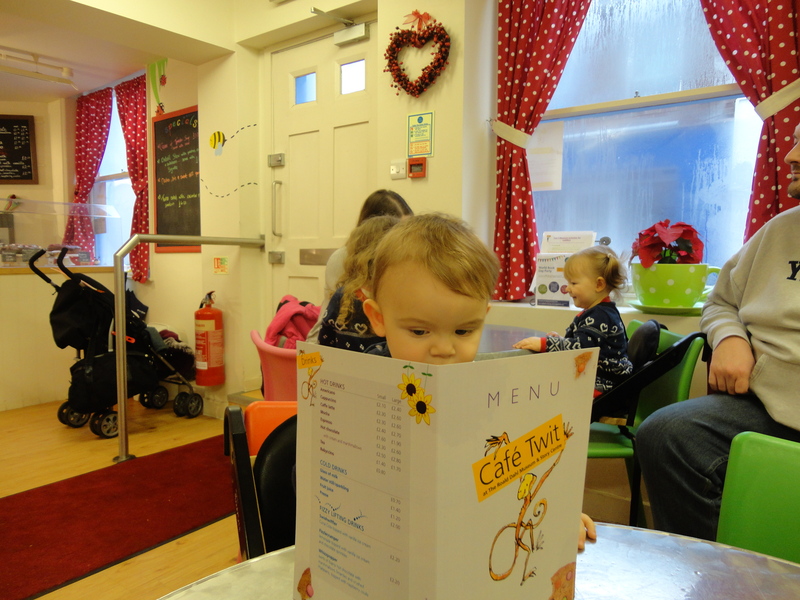 The owner brought us a high chair and did his best to make sure we felt at home and we did. We ordered fish and chips and a cheese sandwich for Alfie. When it came, the sandwich was delicious, home baked bread and full to bursting with tasty grated cheddar cheese. Alfie’s eyes lit up and he devoured it hungrily. Bes and I had fish and chips and it was gorgeous! I chatted with the owner, who fussed around every customer, as a hen would look after her chicks, being polite and friendly and chatty with each one. 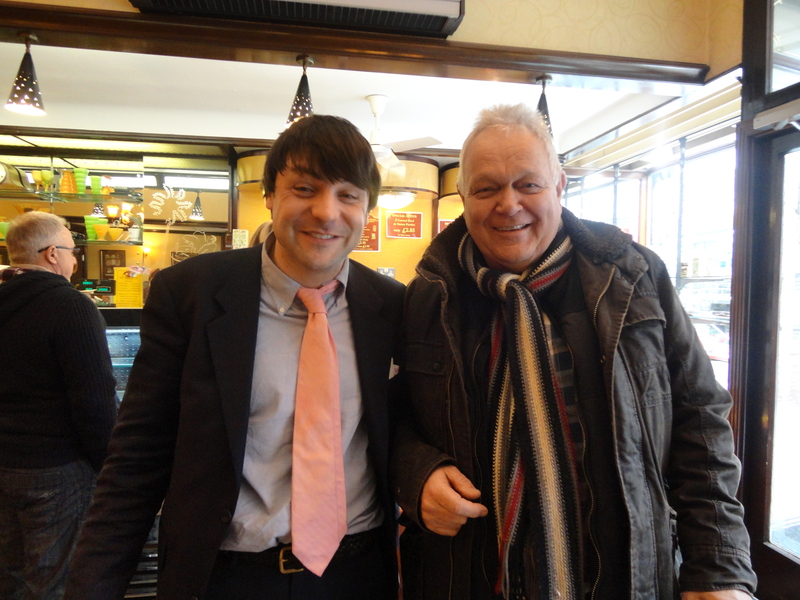 He told me that this had been his family business since 1948, first owned by his grandfather, then his father and now him. He said the place hasn’t changed all that much in the years since it opened. I must return one day! The lady of the house would love it! We made our way to the car park as ‘great’ Aunt Bes had agreed to pick Princess Mia up from school. When we got to the car park, I realised Pontypridd hadn’t quite joined the 21st century when the ticket machine only accepted cash, so Bes was dispatched back to town to find a bank to draw out a fiver. 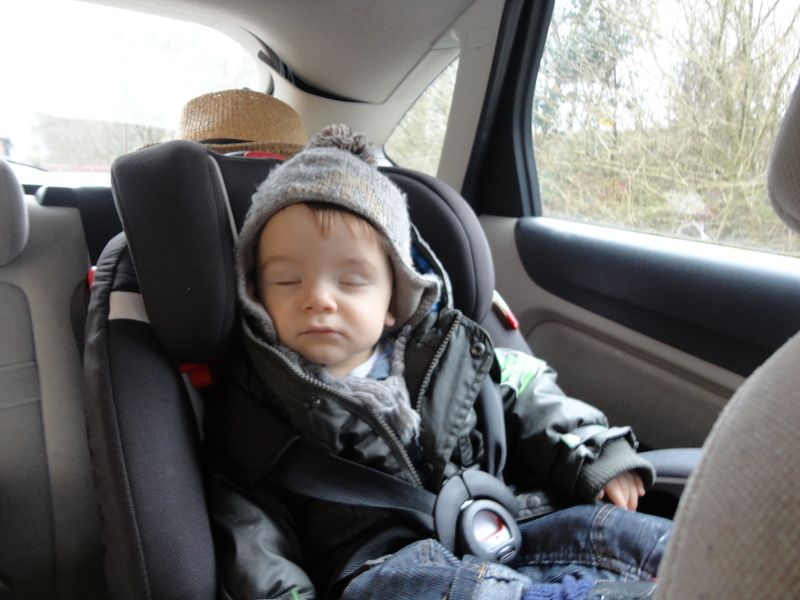 It didn’t take Alfie long to drop off to sleep on the way back home. He slept with a smile on his face. When we arrived home, we still had plenty of time to play together. We played in the kitchen, then on the farm and he loved it so much when the Princess Mia arrived from school. They love each other so much and shared a packet of buttons and played happily together until Mia’s mum arrived from school and took her home. Alfie’s dad arrived soon after and our house became quiet again. It was good to have our home quiet and ordered again….but not as good as when the sounds of our grandchildren fill it with fun and laughter. It had been another good day, reliving old memories and making new ones together, a little boy, his wonderful aunt and his old grampy. She is our third grandchild, our second granddaughter. She is loved. 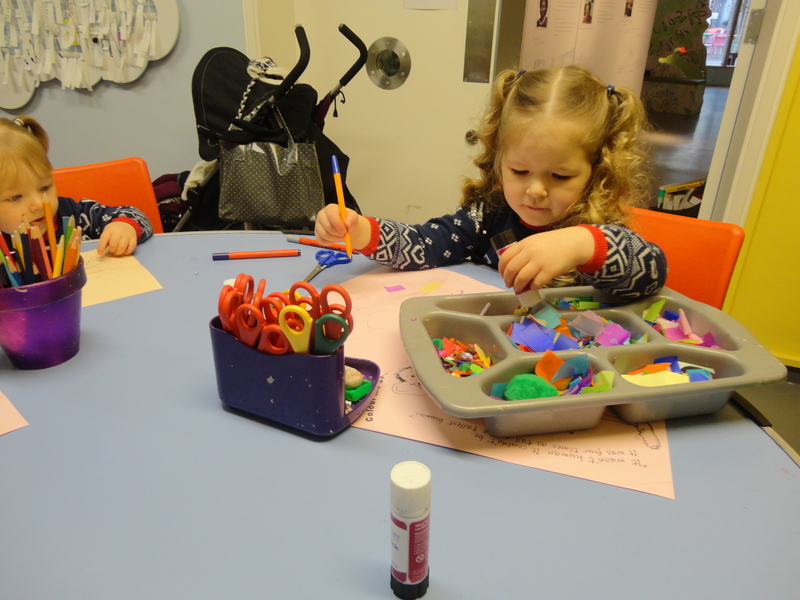 Millie has a fantastic cousin called Alfie and a beautiful big sister called Princess Mia… living with Mia is great fun…. living with a princess is even greater fun. I never knew until Millie was sent to live in our family that angels had blue eyes, but I know now. Millie is beautiful inside and out. Today I get to take Millie out on my own. Millie stayed in her own house overnight but woke up early to get ready to spend her day with me. Mia is off school this week, which means so are all the other dear little ones who will be crowding out the places I usually visit on a Friday. This called for some serious thought. Looking out of the window I saw the sky was clear blue, it reminded me of Millie’s eyes. Today would be good. The angel and I decided to make use of the fine spring like weather and go to Cosmeston Country Park, near to where we live. For over 80 years, most of what is now the country park was a limestone quarry, with four massive separate holes being dug to remove the stone. 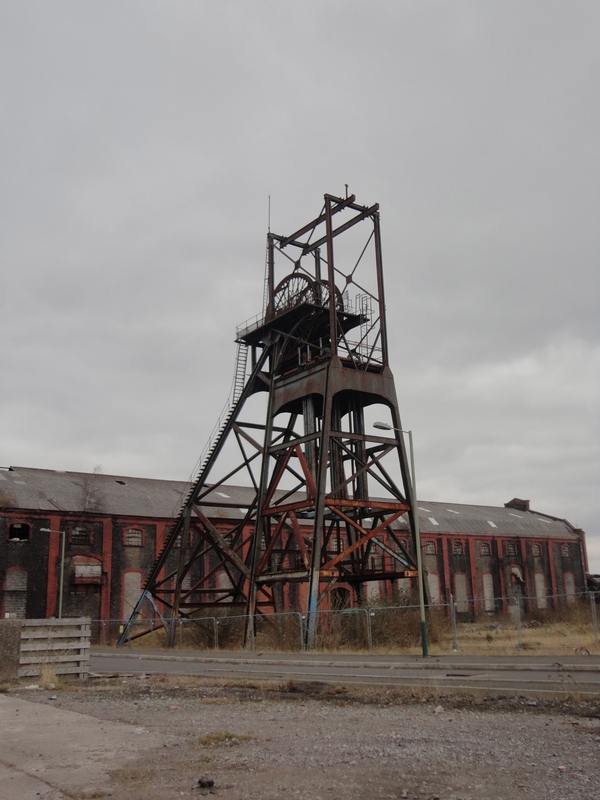 The quarry had its own railway to take the stone to the nearby cement works. 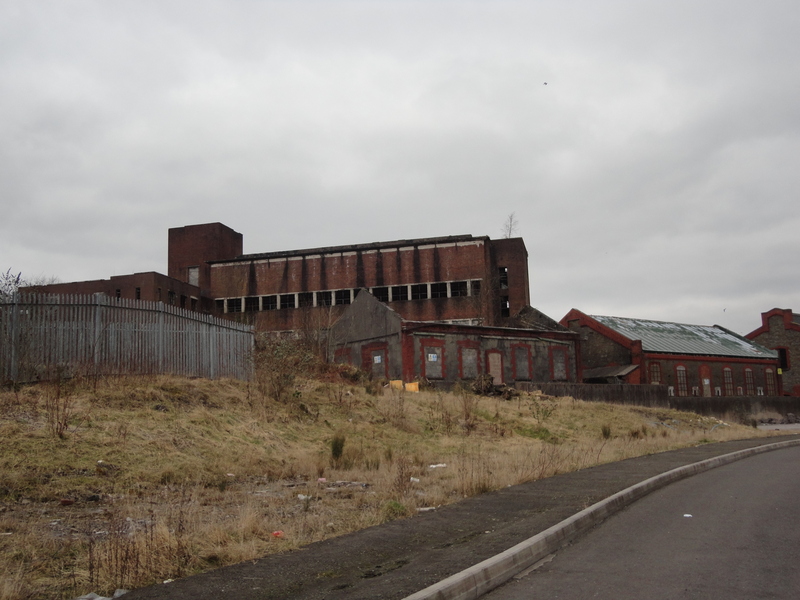 As a young boy I used to enjoy watching the trains running across the road to the cement works. When I was in the sixth form I had a holiday job working in the quarry, I used to work on the bottom of what is now the lake… believe me it is very, very deep. Today the cement works have gone, replaced by houses at Lavernock Park, and the railway is now just a path. 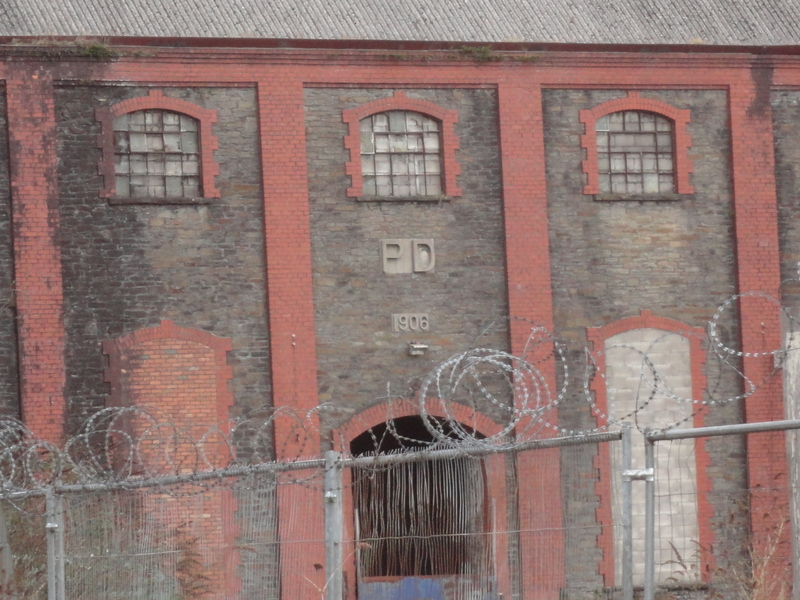 The factory office of the cement works is the only building that still remains, and it is the Harvester Restaurant on Lavernock Road. Even before quarrying finished, two of the holes were filled with rubbish from the houses and factories that the cement helped to build. In 1966, a government white paper recommended the establishment of publicly accessible country parks close to large towns and cities, and preferably on sites in need of improvement. 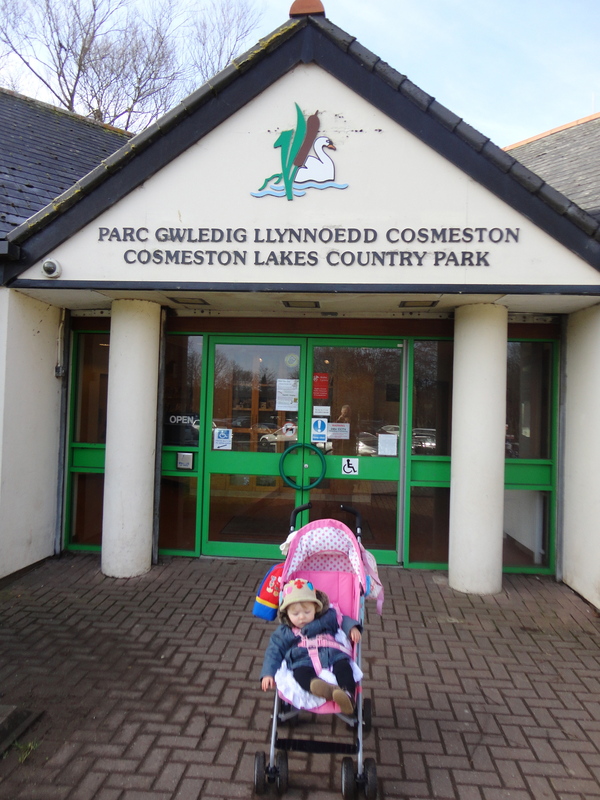 Cosmeston was ideally suited – despoiled land close to Penarth and Barry and not far from Cardiff, created countryside on the city dweller’s doorstep. 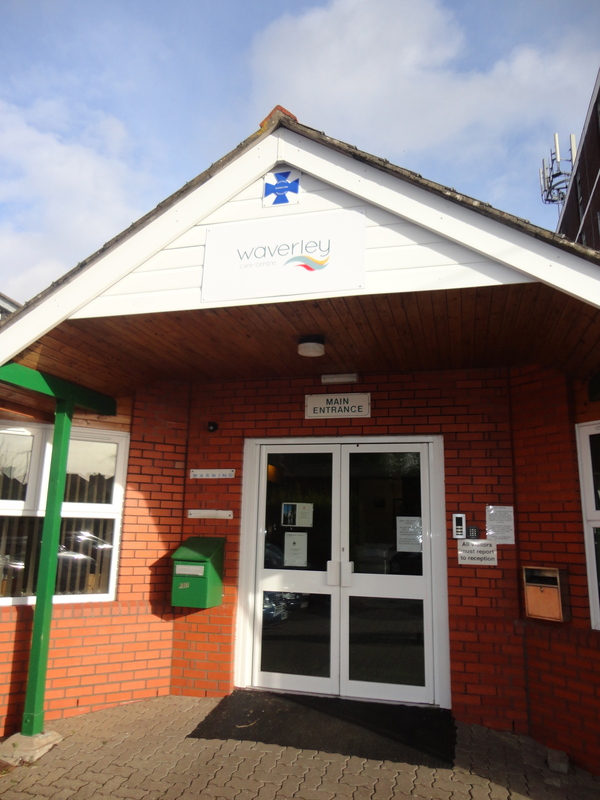 The then South Glamorgan County Council and the Vale of Glamorgan Borough Council together restored the land to provide an area of safe and accessible countryside. 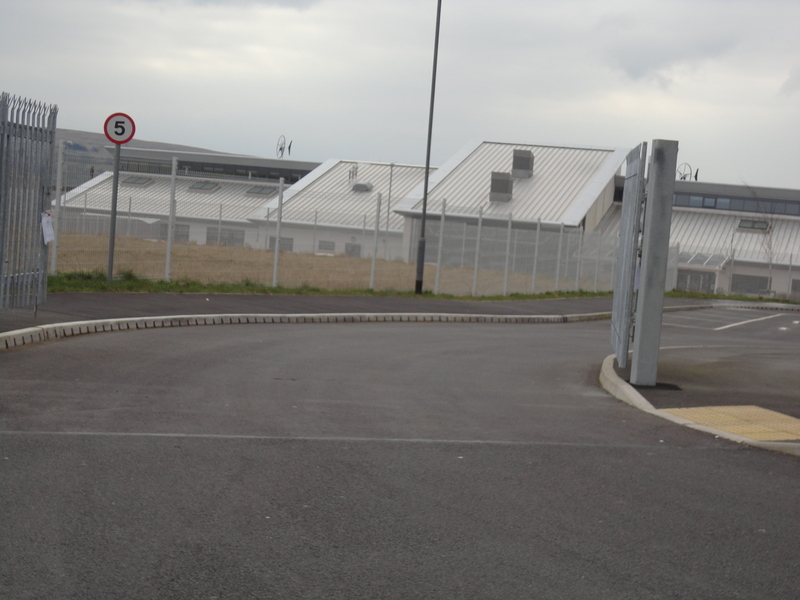 It was first opened in 1978 and the country park is still being developed and improved. 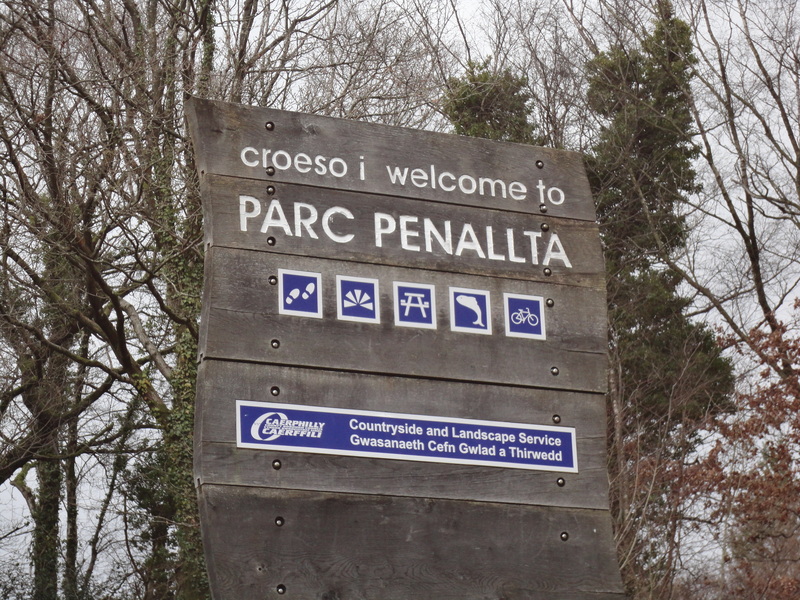 Unlike the town park in Penarth, with its formal gardens and cultivated flowers, the country park is sensitively managed countryside, which provides a balance between conservation and recreation. 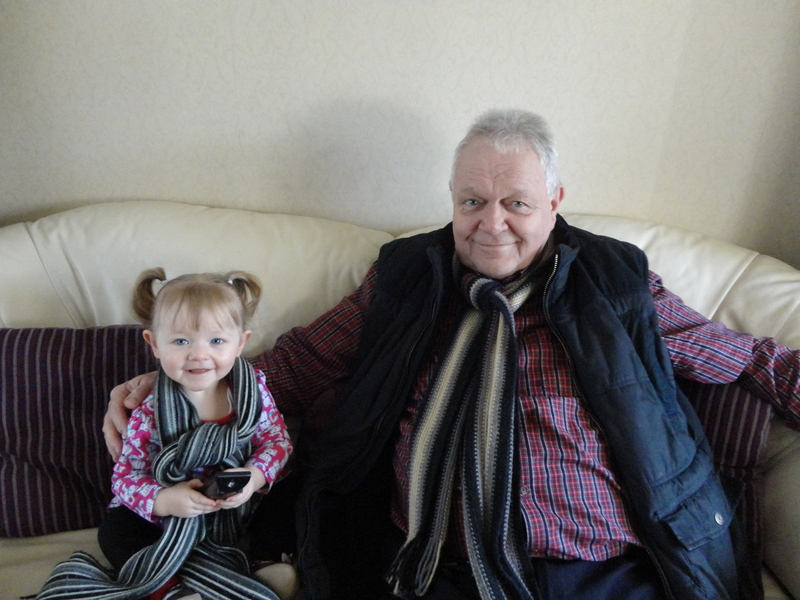 After Millie arrived, we set of as quickly as we could, because we both wanted to make the most of this precious time, alone together – a little angel and her grampy, who loves her to bits! 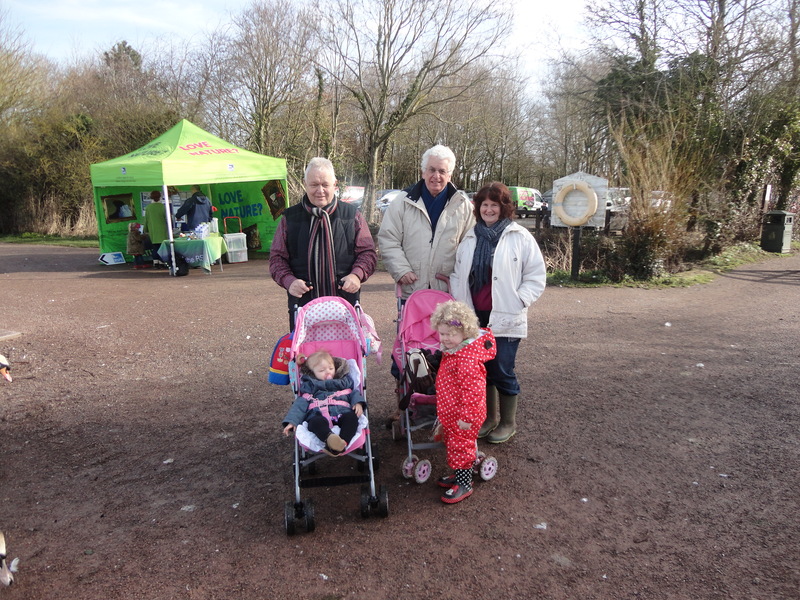 When we arrived who should we meet but old friends John and Thelma Foote with little Evie, their grand daughter. It was so good to see them. We all made our way to the lake. 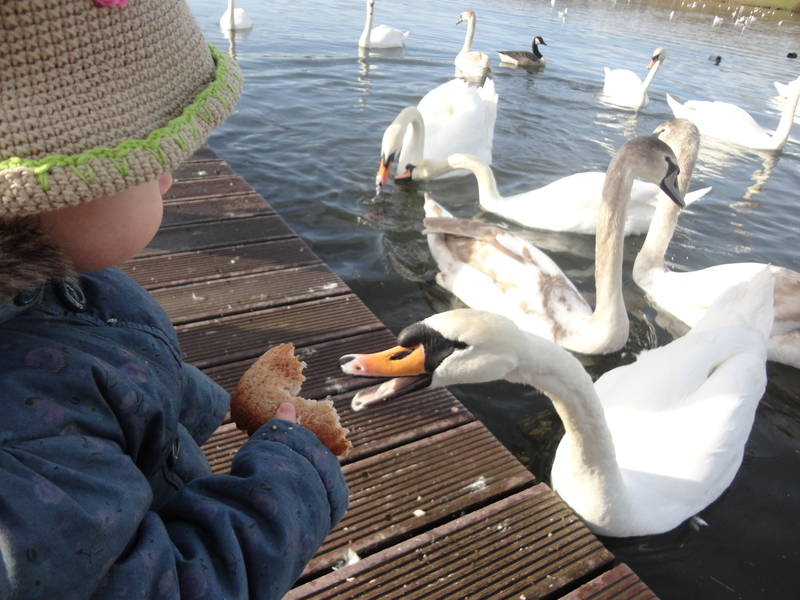 I smiled, both Evie and Millie had bread to feed the ducks and swans. 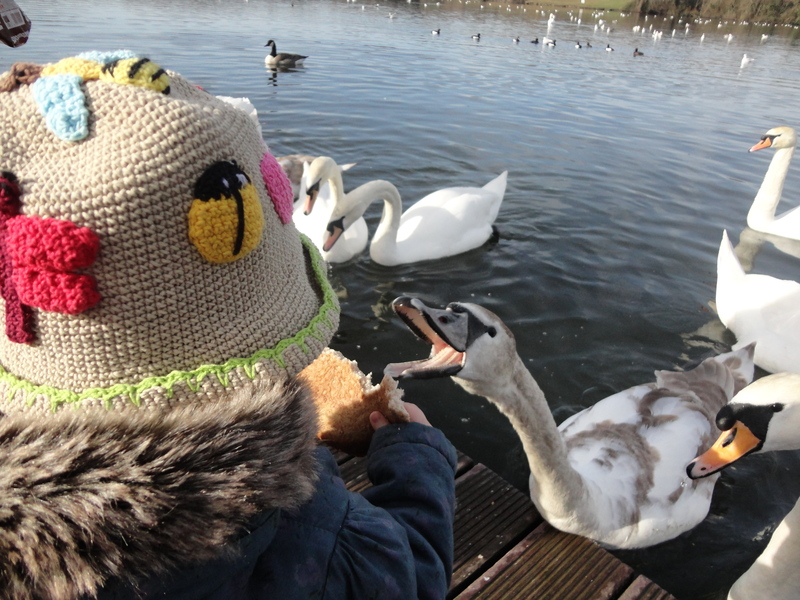 Millie thought Evie was a bit posh because she had pitta bread in her bag and it was still frozen, good job swans don’t have teeth that can be broken by eating frozen pitta bread. Millie had taken some wholemeal bread belonging to the lady of the house. 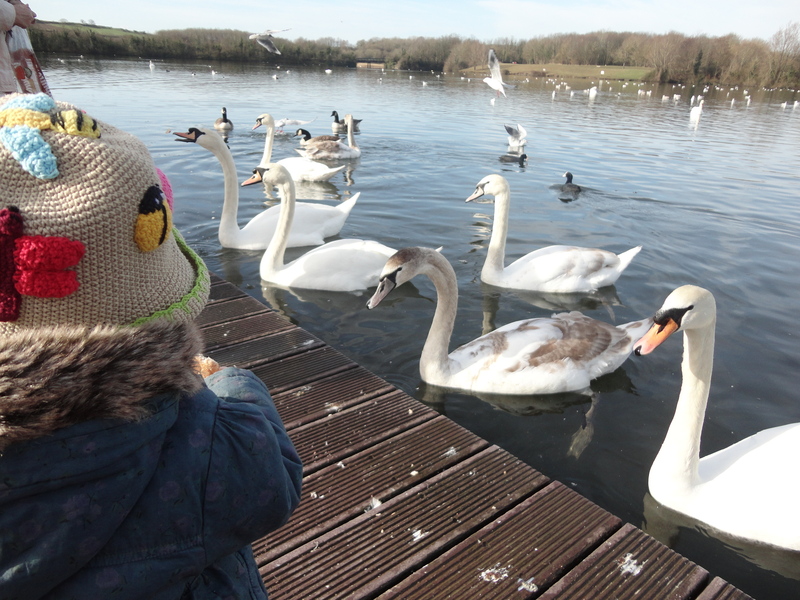 We had fun feeding the birds but I noticed Millie was a bit reluctant to throw the bread to the ducks and swans. 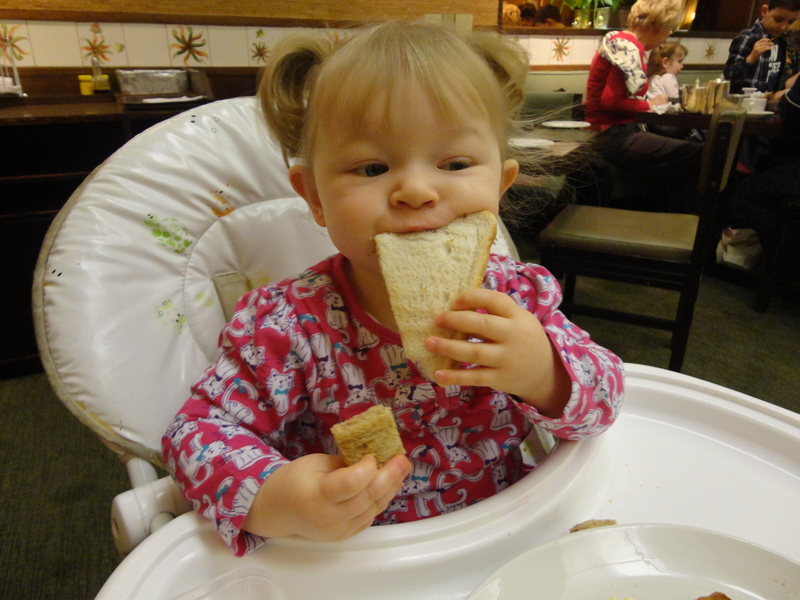 It was then I noticed that she was happily tucking into the bread. It made me smile and made the swans mad and they strained forward to reach the food, which they wanted so much. It was so much fun, out in the warm sunshine, being in such a beautiful place, with Millie and our friends. We decided to walk around the park slowly enjoying the fresh air and the birds singing. Recent heavy rain made the roadways and paths very muddy, but we battled through looking out for signs of spring. We said goodbye to The Foote Family as they wanted to take Evie onto the adventure playground and we strolled around this little haven of peace together. Spring being not too far away made everybody happy and we exchanged many ‘Good mornings…’ to everyone we passed and they all gave the little angel I was pushing around an extra big smile. 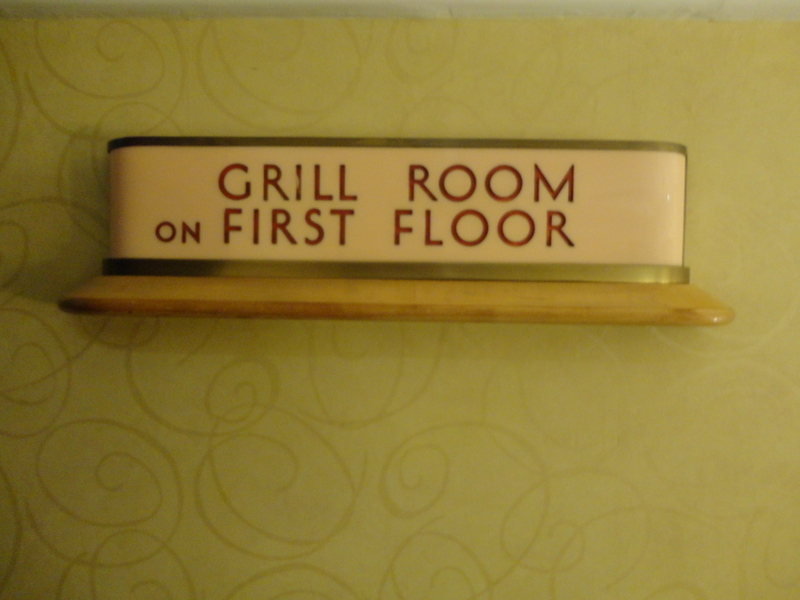 After we got back to the car, I wondered what to do. What would Millie want to do? The other ladies in my life, the lady of the house and the great Aunt Bes (‘great’ as in wonderful not age!!) 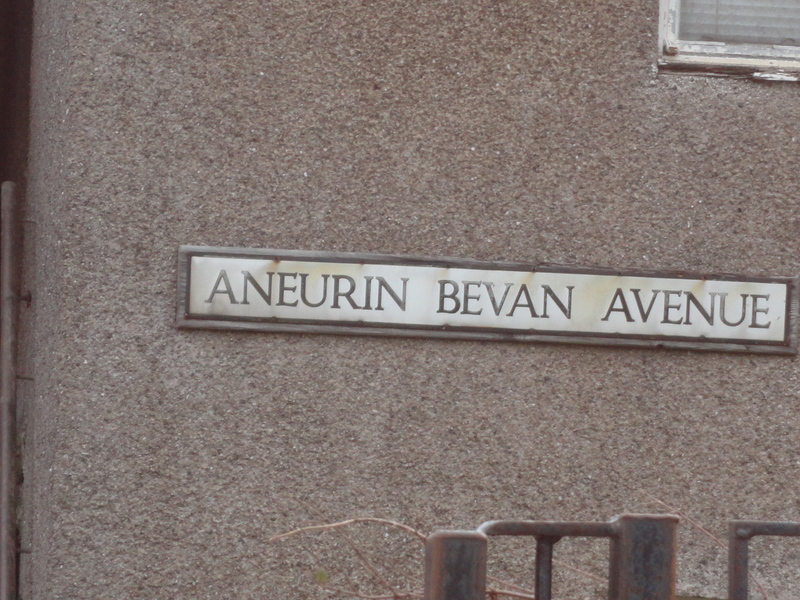 would have said immediately… ’Hit the shops!” so that’s what we did, made our way into Cardiff. By the time I got to the park entrance Millie was sleeping, something else I learnt…angels sleep with a little smile on their faces, maybe she was dreaming of the ducks and swans and her grandmothers tasty wholemeal bread! 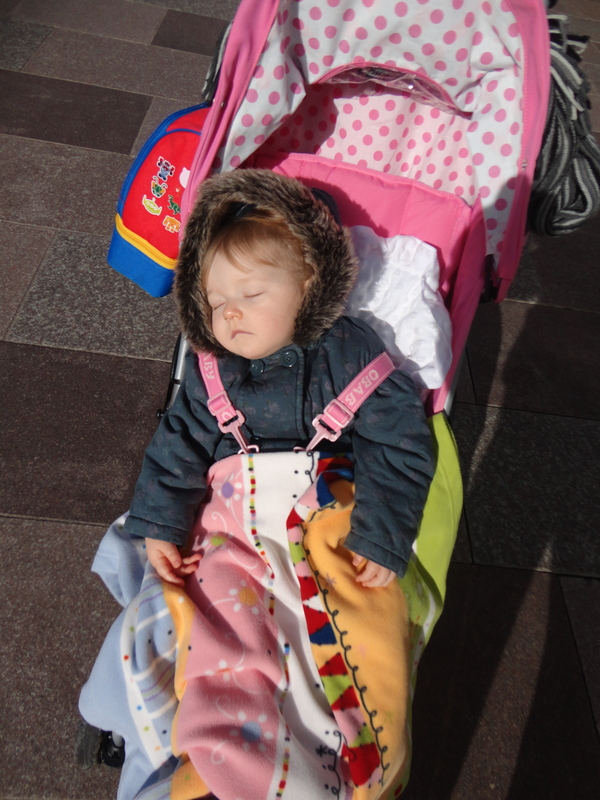 I parked the car, lifted Millie out, strapped her in her stroller and reached town and she still slept. 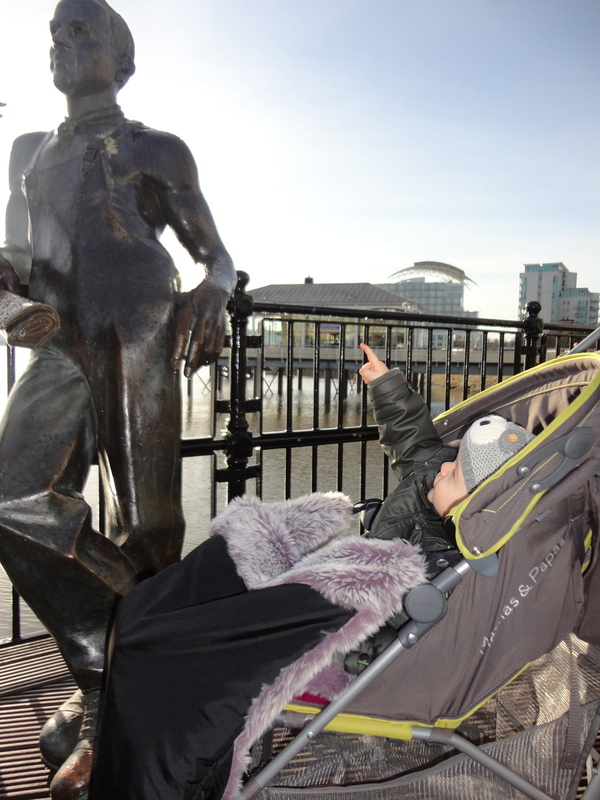 I had decided to do with Millie what I had already done with Alfie, teach her about the great place she lives – Cardiff the great capital city of Wales. 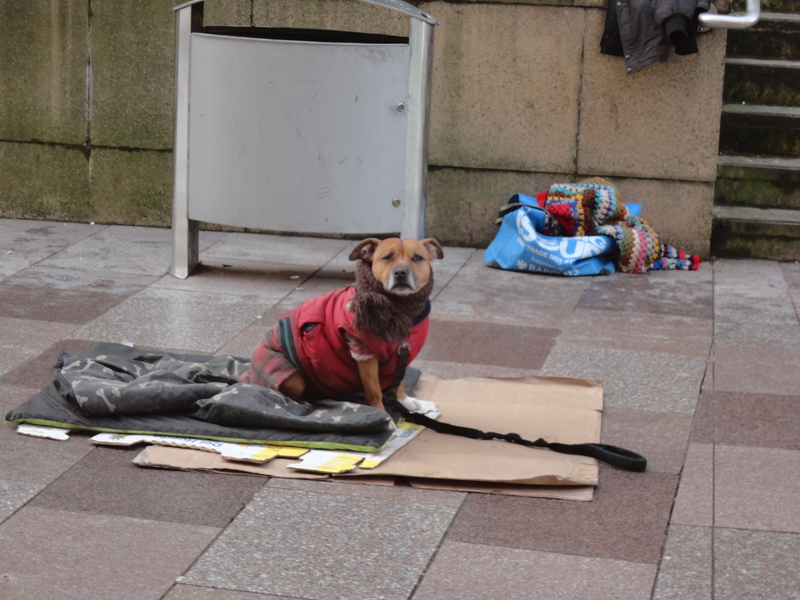 On the way into town we passed a Big Issue seller who had a great dog. He was dressed in a coat and scarf and looked really miserable, like a dog version of Victor Meldrew! I decided to have lunch first while the little angel was sleeping. 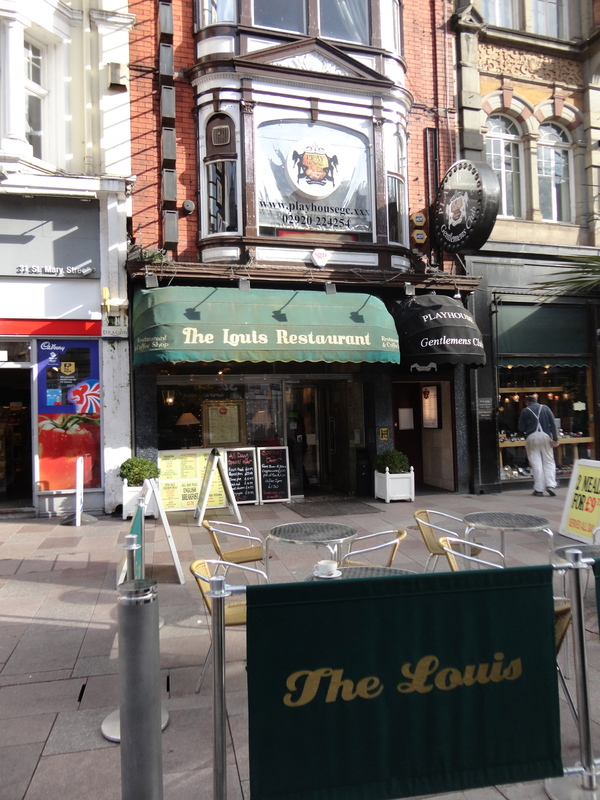 Lesson one for Millie was eating places in Cardiff and the number one place is The Louis on St Mary Street. 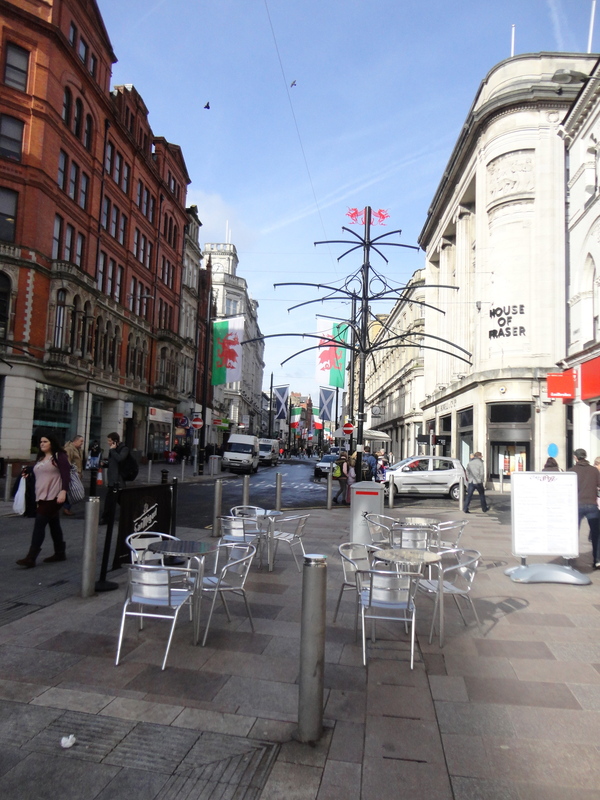 St Mary Street was looking good, all done up for the Six Nations. 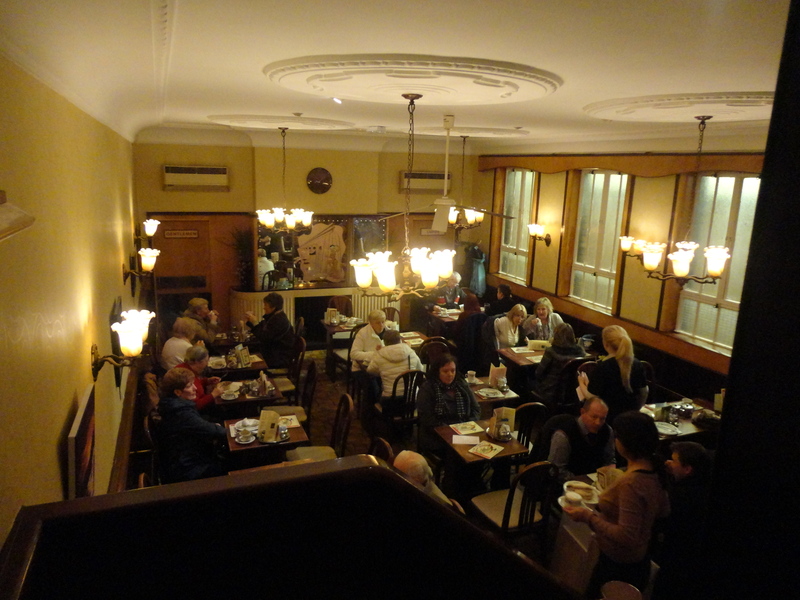 The Louis is the most wonderful place to eat, inexpensive and like something from a bygone age. Older ladies dressed in black wait on the tables and chat to you like long lost friends. 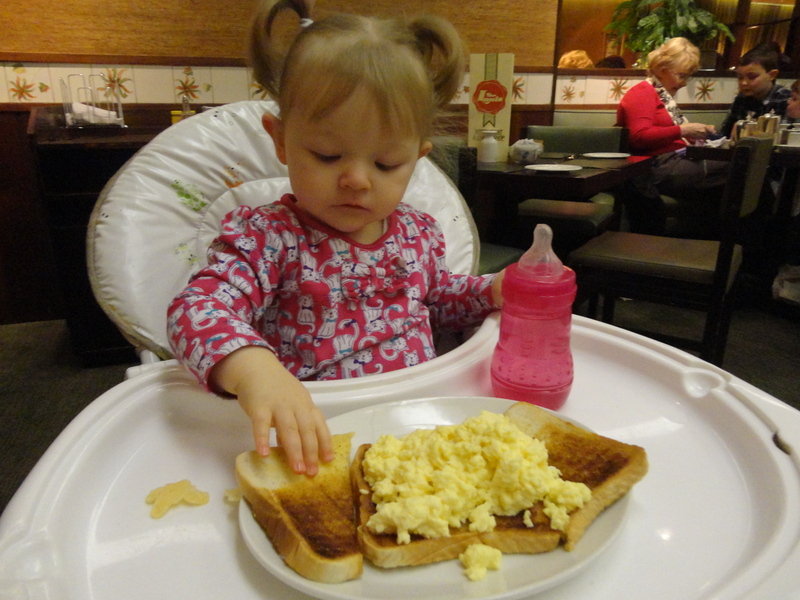 I ordered my all day breakfast and scrambled egg on toast for Millie. I asked her to hold on for the eggs until the little angel woke up. The old girl brought my tea, two pots, one with hot water and a little china jug for the milk. Her little greeting ‘There you are love, a nice cup of tea.’ was sweet music to my ears. I was halfway through my all day breakfast when Millie woke up and smiled. 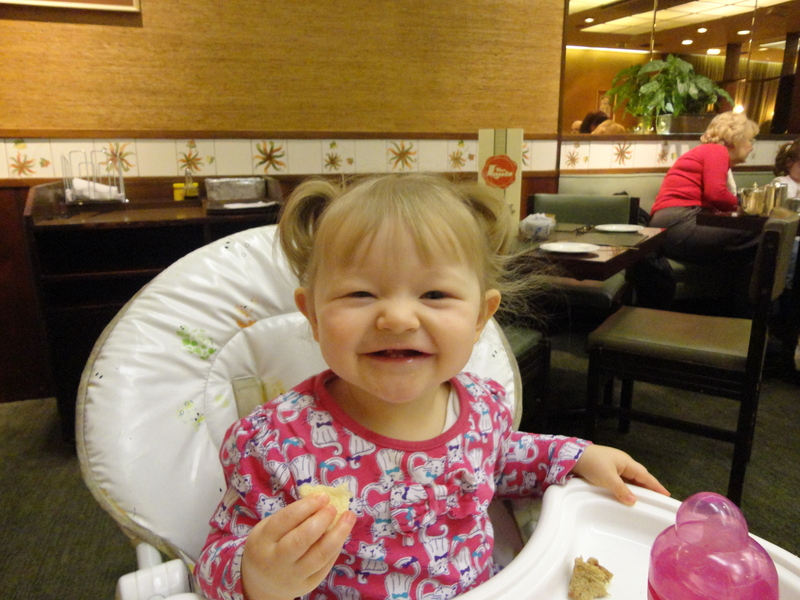 I dipped my last little piece of fried bread into my egg, and then lifted her into a high chair. I summoned the old girl back and the scrambled eggs were soon on their way. 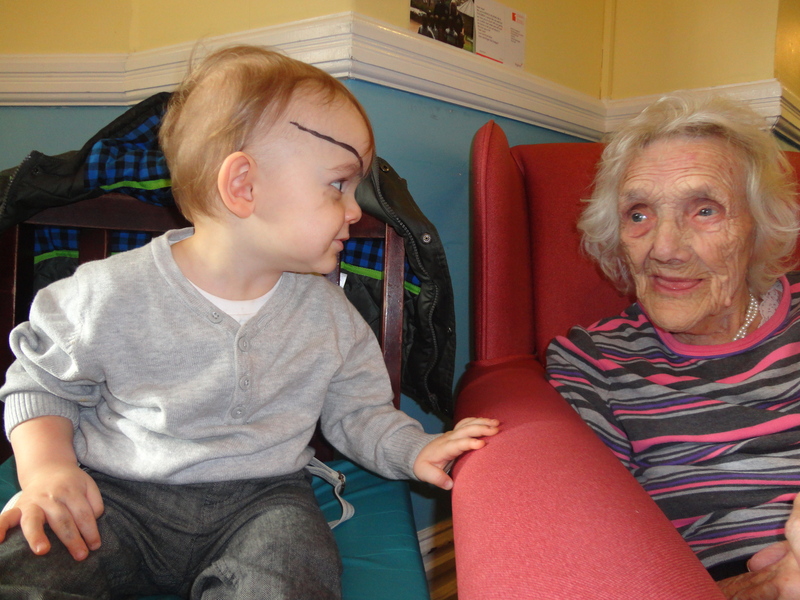 Just like her cousin, Millie charmed all who sat near with her smiles and garbled language. 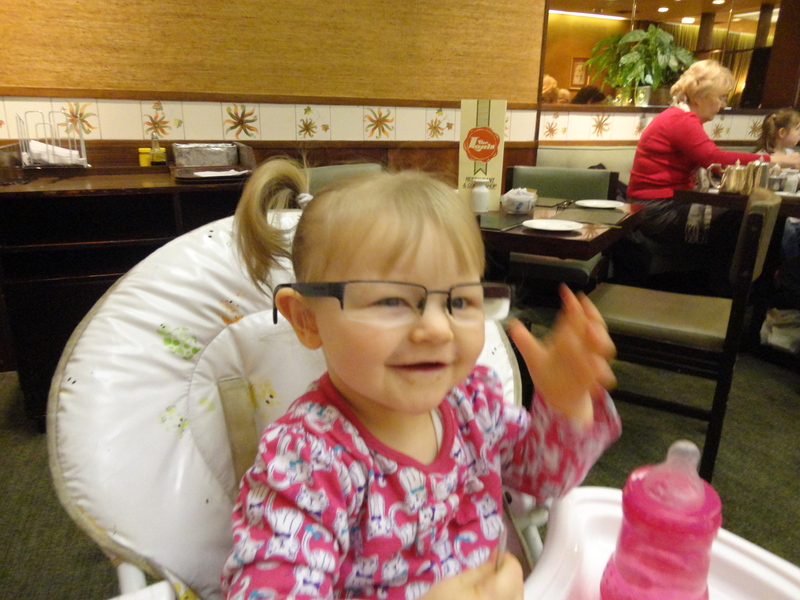 When I looked at Millie one time I am sure I thought she looked a bit like me…. the old girl serving me said so every time she came to our table! After a leisurely lunch, we put our coats back on and restarted our lessons for the day. 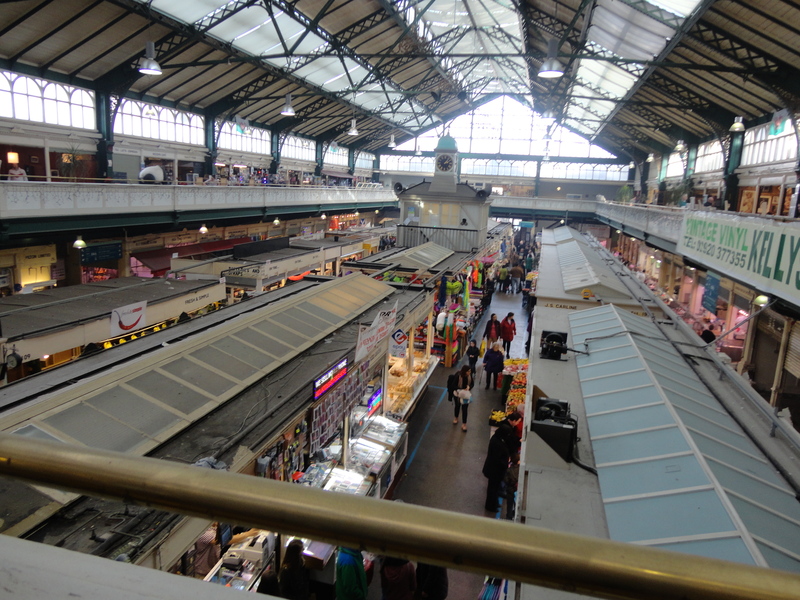 Next stop Cardiff Market another wonderful place full of character and interest. 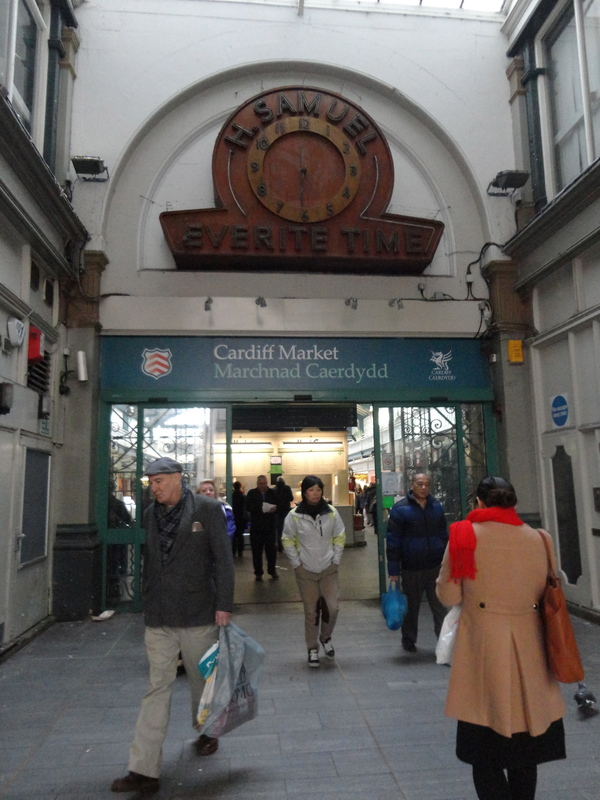 When I was growing up Cardiff Market meant three things, the pets, upstairs on the balcony, the Christian Bookshop and the butchers’ shops. 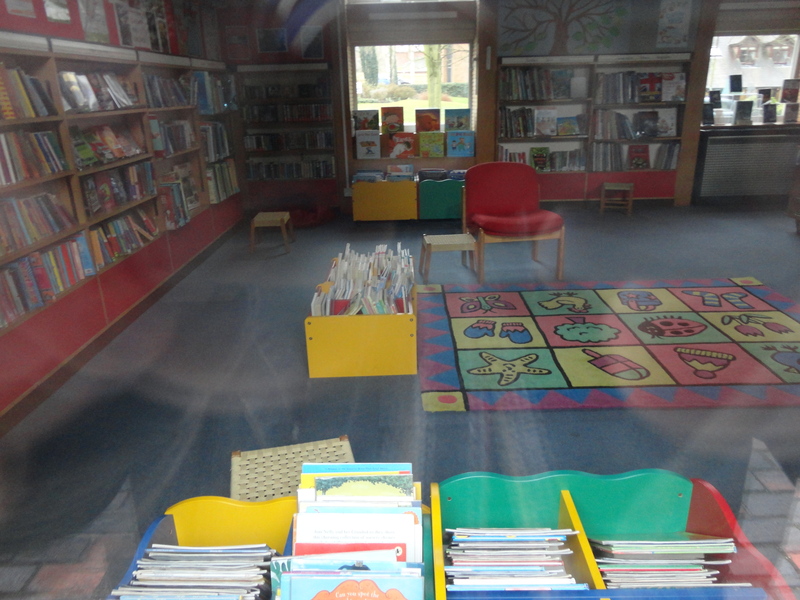 Sadly the bookshop is no more and the pets are almost non-existent. You can buy fish and birds but very little else…I am sure that the Health and Safety brigade are to blame!! 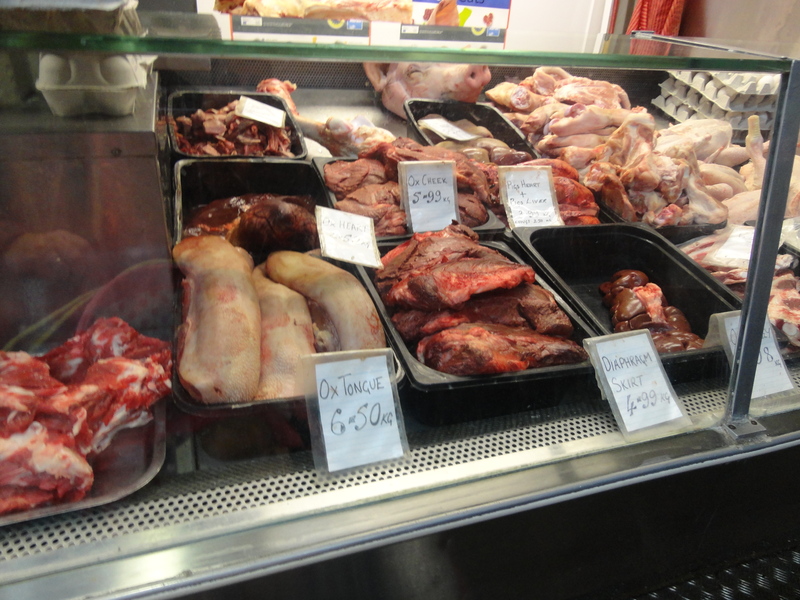 However, there is still plenty to see in the butchers’ shops. 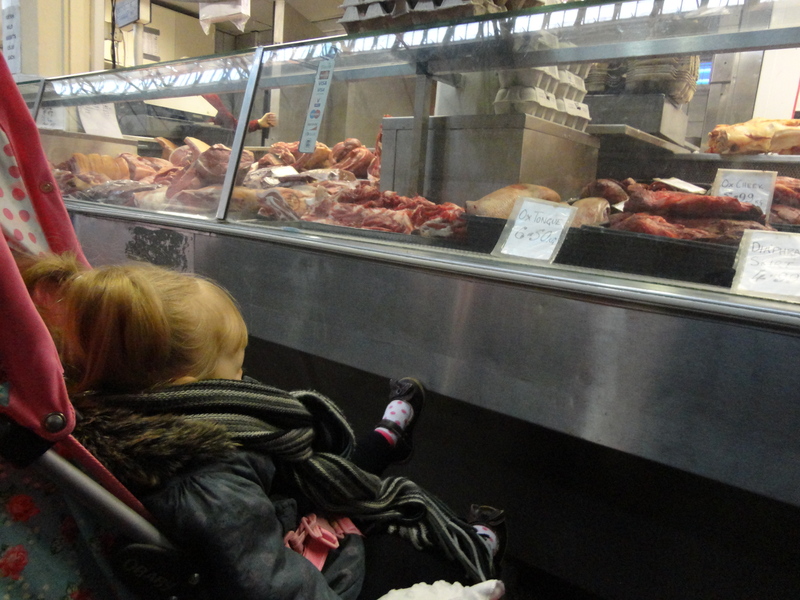 As a young lad I would stand for ages looking at the unusual cuts of meat. I showed Millie and wondered what I could buy for the lady of the house for tea, beef cheeks sounded different and so did the diaphragm skirt, but I guessed she would not fancy ox-tongue or pigs heart. My mum used to feed us with heart, liver and other bits of offal. I remember one time my dad eating brains, but only once!! 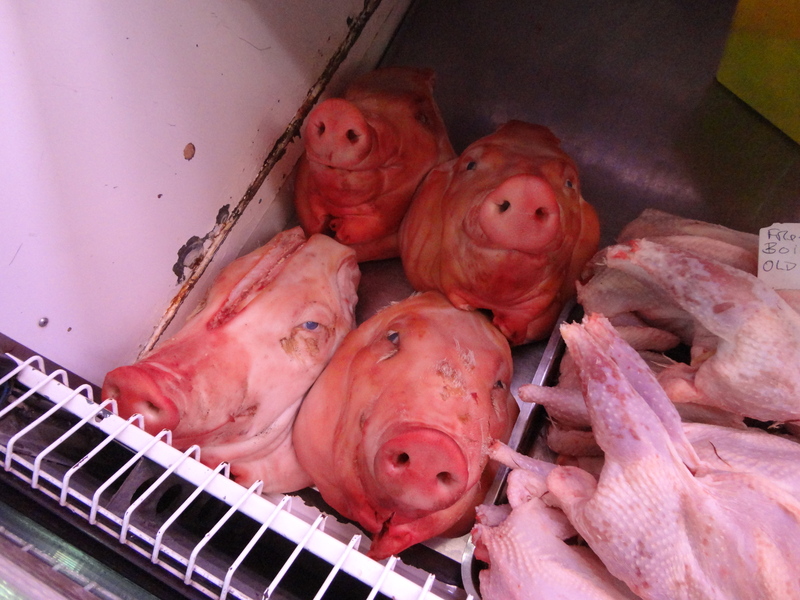 Millie had the giggles when we came across a little group of pigs’ heads. They reminded me of The Mona Lisa. Whichever way I looked at them they were looking straight at me…creepy! 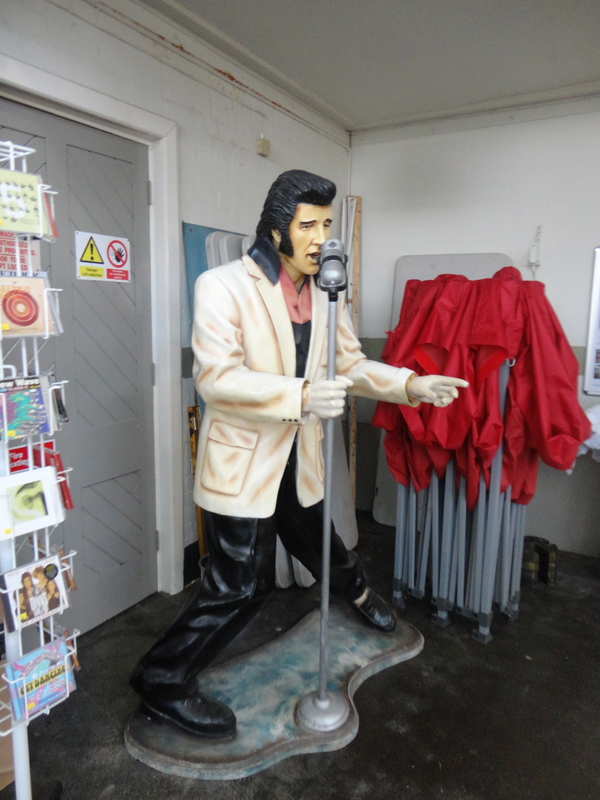 On the way out we noticed that Elvis had not left the building!! On the way back to the car we stopped off in Howells to check on the nappy situation. 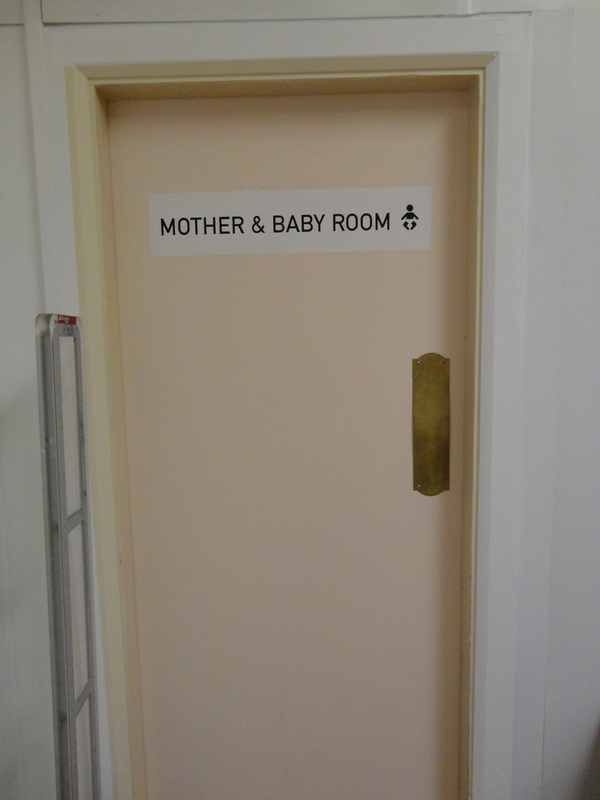 Revisiting the mother and baby room I checked and found all was well…no feeding mothers or offspring being changed… That is so last season calling it a mother and baby room, I want to fight for a Grampy and baby room. Equal rights for us male oldies!! 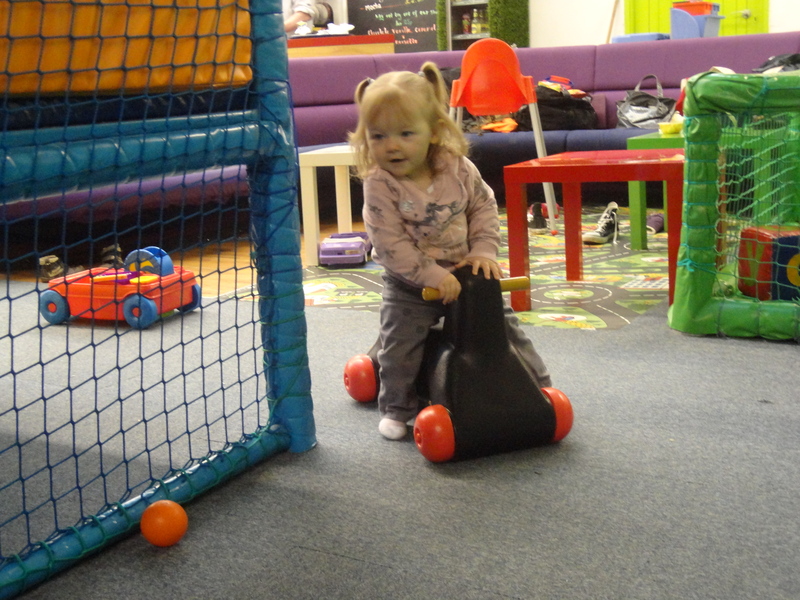 We reached home in good time for Millie to have a little play and we enjoyed being together. I looked at her playing quietly and I thought a gentler and more placid soul I have never seen. 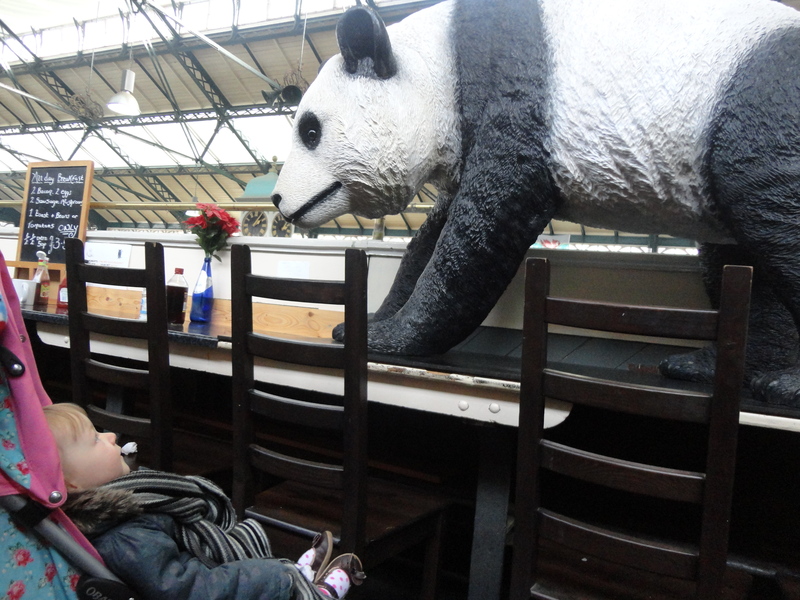 My little angel, thanks for a lovely day… You are loved! 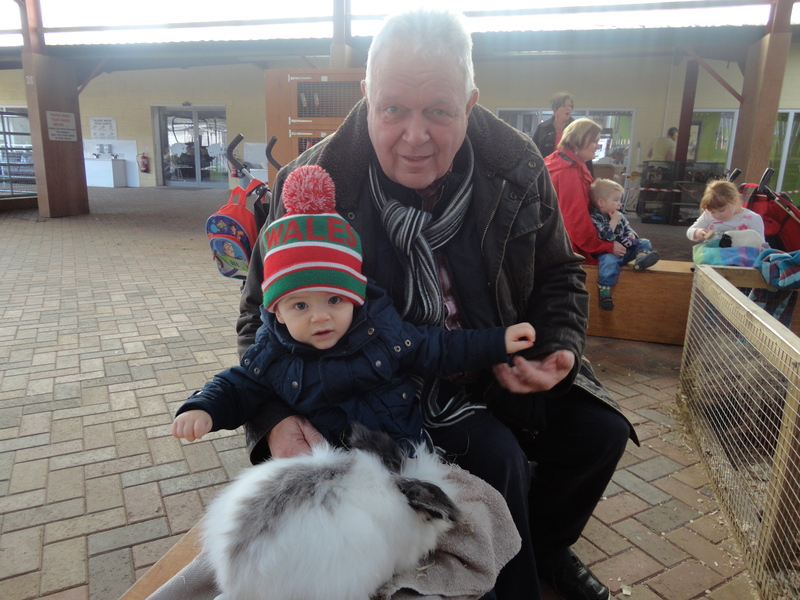 ‘A visit to Cefn Mably Farm Park provides an increasingly rare opportunity to meet and interact with a large variety of friendly farm animals in any weather and at any time if the year. 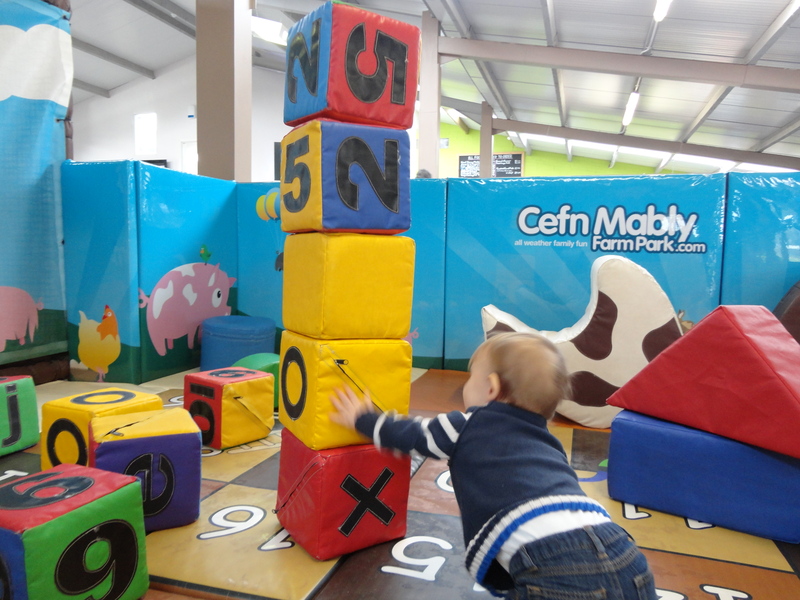 At Cefn Mably Farm Park we have lots of space for both children and adults alike, with plenty of things for the family to see and do both inside and outside. The girls had enjoyed it immensely and I had promised myself and Alfie that we would venture up there some time and check it out for ourselves. Today seemed the perfect day. Alfie had stayed overnight and after the lady of the house had prepared him for the day and I had made him a hearty bowl of porridge, Alfie set about playing with the farm set in the nursery, that little bit of paradise my dear lady had created for the grandchildren. I am sure I heard him say ‘Grampy’ as he picked up a rather large Gloucester Old Spot, but then it was early and my ears were still adjusting to the day. 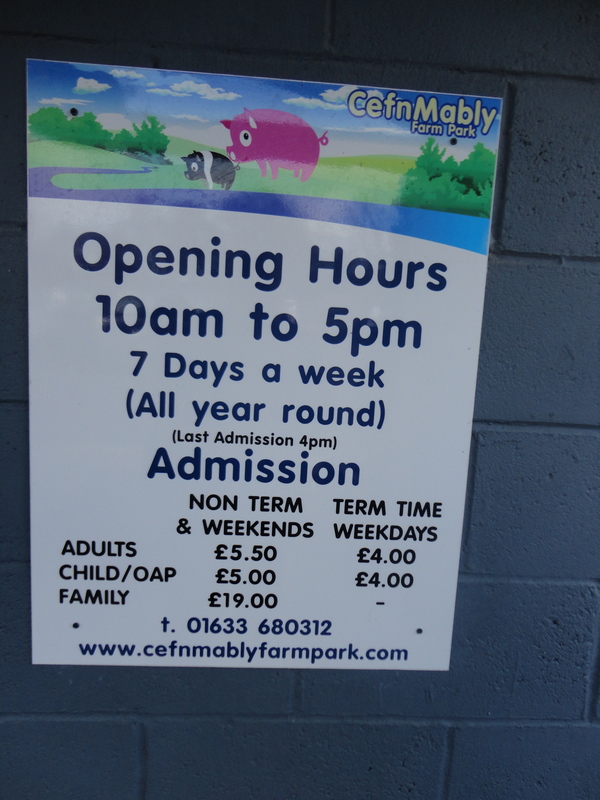 It seemed to be a sign that we should visit Cefn Mably. Aunt Bes was home on a week’s holiday so she was invited to tag along. We knew she would enjoy the day, I even felt she would enjoy it more than Alfie! Alfie wasn’t keen on his morning snooze…I am beginning to think the list of instructions handed to me last September when Alfie’s parents first asked me to be his co-adventurer last September is slightly out of date. As usual, just before we were due to leave on our latest expedition Alfie looked at me and smiled and some ‘farmyard’ smells reached my nostrils and I realised a change of nappy must take priority. Happy days. 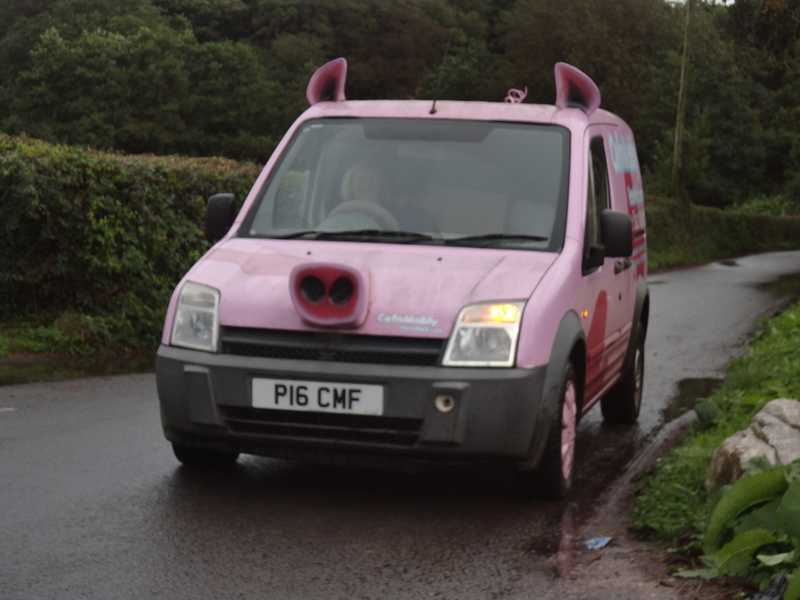 We reached the farm in good time and Alfie giggled out loud when we passed the farm van. Aunt Bes liked it as well. We paid our money and went in. The barn was warm and inviting and we found a table to set up as base camp. The log burning stove I the corner was well hidden by young mums and their offspring all crowding round and chatting happily. Still, it gave the barn a nice warm homely feeling. 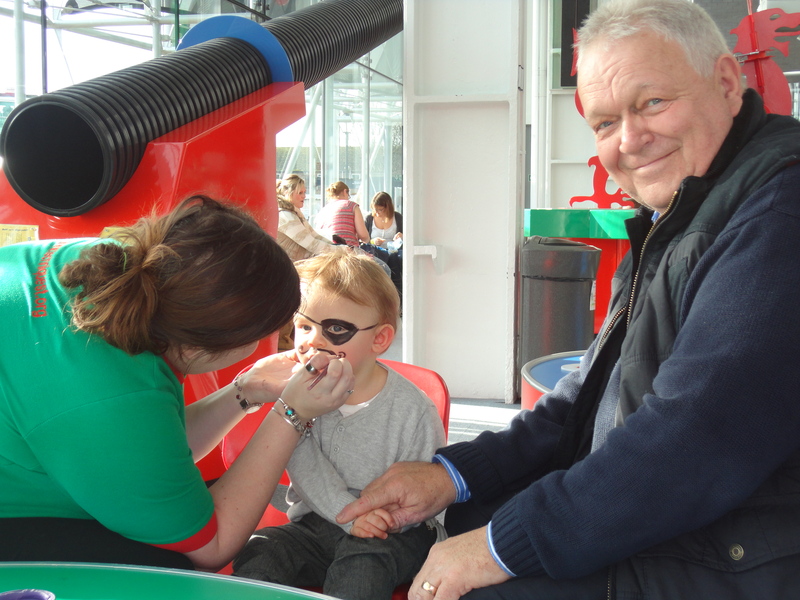 With the words of captain Oates on my lips – ‘I’m going out and I may be some time!’ – we ventured out into a little wonderland for kids. Alfie loved it! 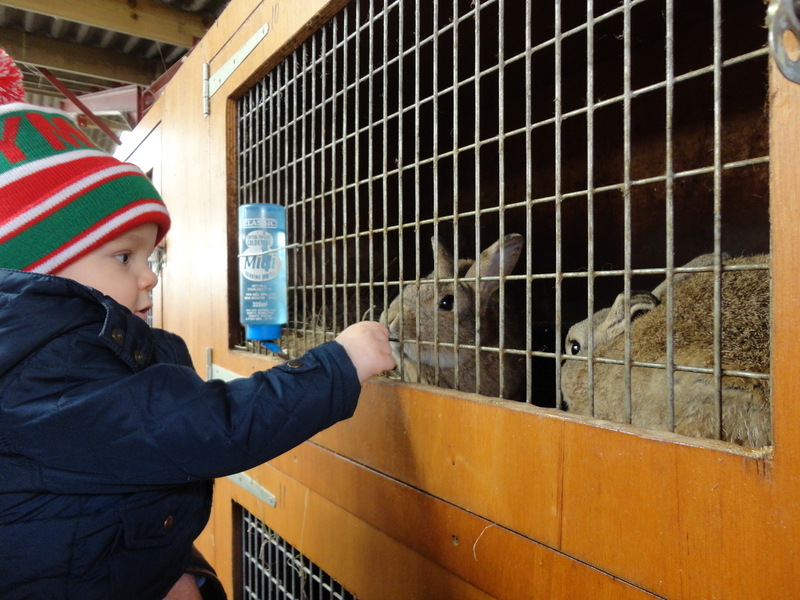 We started in the touch and hold area and Alfie held a guinea pig and a rabbit and fed them with the food we had bought at the entrance and a carrot provided by the keeper. Alfie was a little unsure at first but was soon tucking into the carrot quite happily. We guided the vegetable towards the rabbit and he enjoyed it as well. 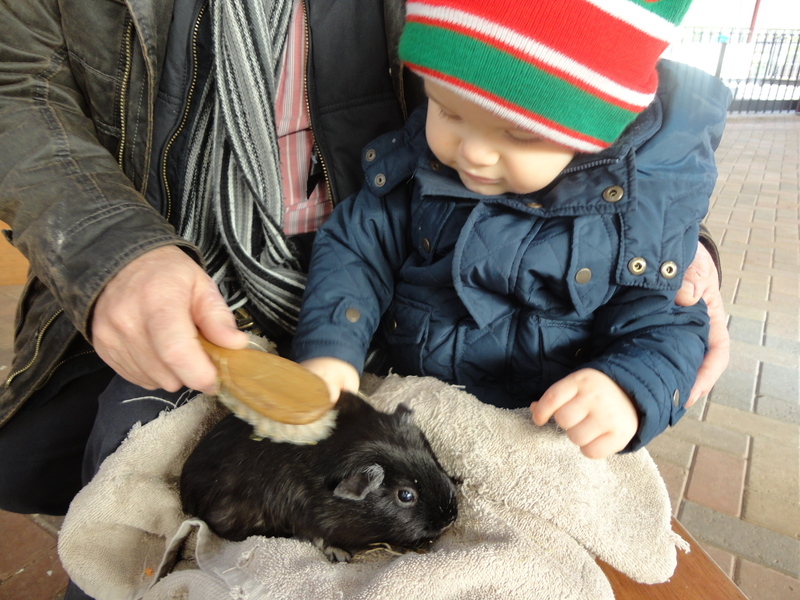 Alfie loved brushing the rabbit, maybe a little overenthusiastically at times, but the rabbit seemed happy enough. We moved onto the rabbit cages – a whole area of them, all abandoned, but brought here for safekeeping and a good home, and that is exactly what they get! They all looked in fantastic condition and were all tame and very child friendly. The boy loved feeding them with the little pellets of food we had bought. Aunt Bes enjoyed this bit too! 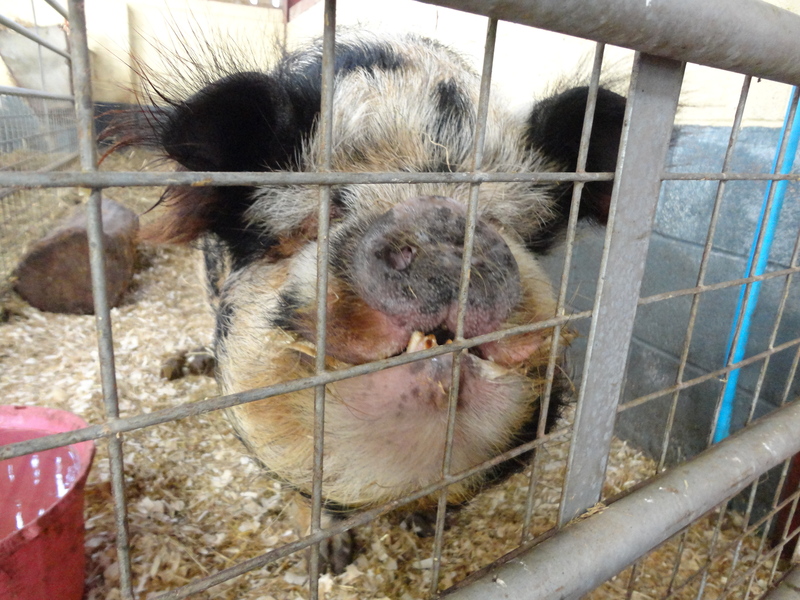 We moved on to the pigs and at one time I thought the lady of the house had made a surprise visit, but I quickly realised my mistake and was so glad she wasn’t around to notice this simple but understandable mistake, the similarity was quite striking. 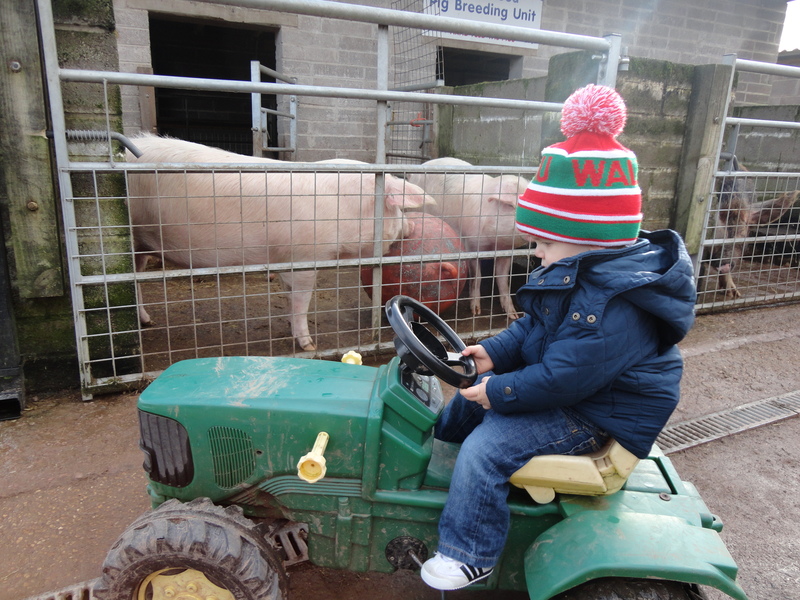 Alfie LOVED the pigs…and so did Aunt Bes! 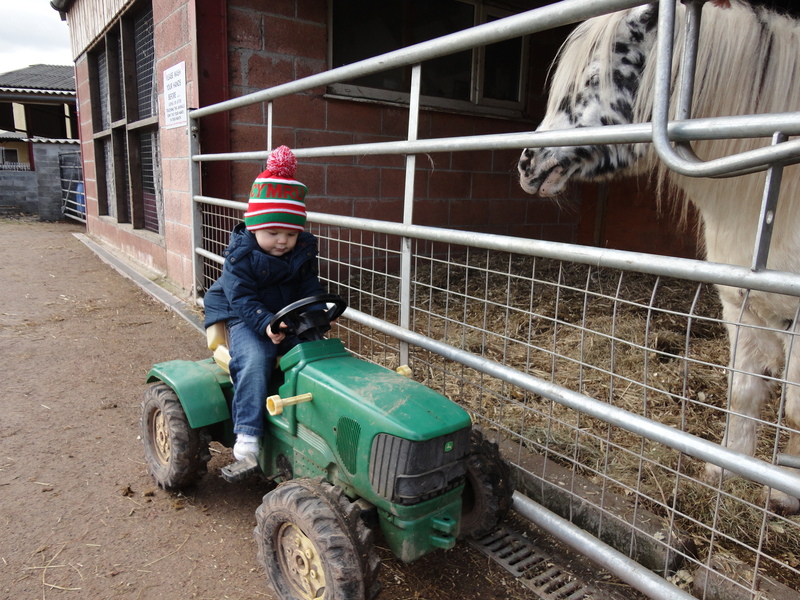 From the pigs we went to the horses, Alfie was wide eyed at such big animals, he giggled as he smoothed a large white one. 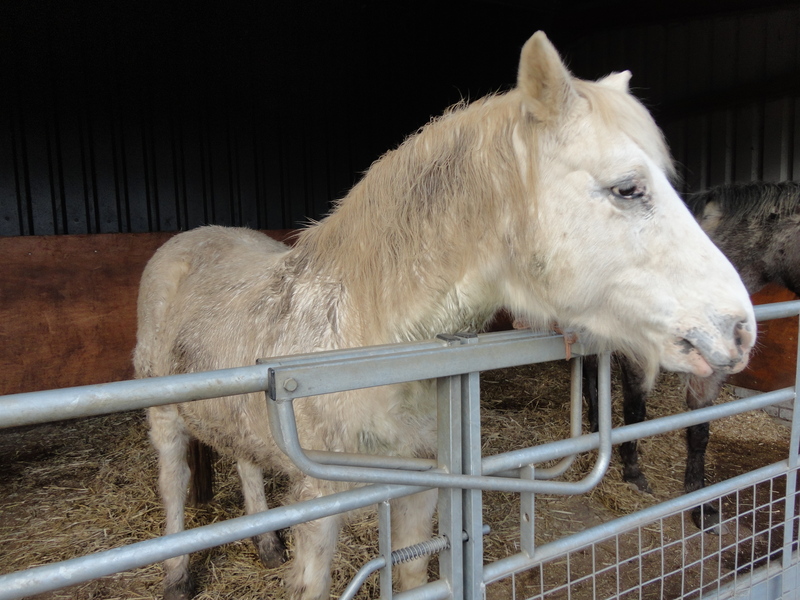 Alfie tried to feed this one, the trouble was though he had no food to give him and when I turned round to see Alfie’s hand completely inside the horse’s mouth, I took a sudden sharp intake of breath. I pulled his hand out and quickly counted his fingers and thumbs. Thankfully there was the correct number of each and we carried on. Aunt Bes loved the horses! 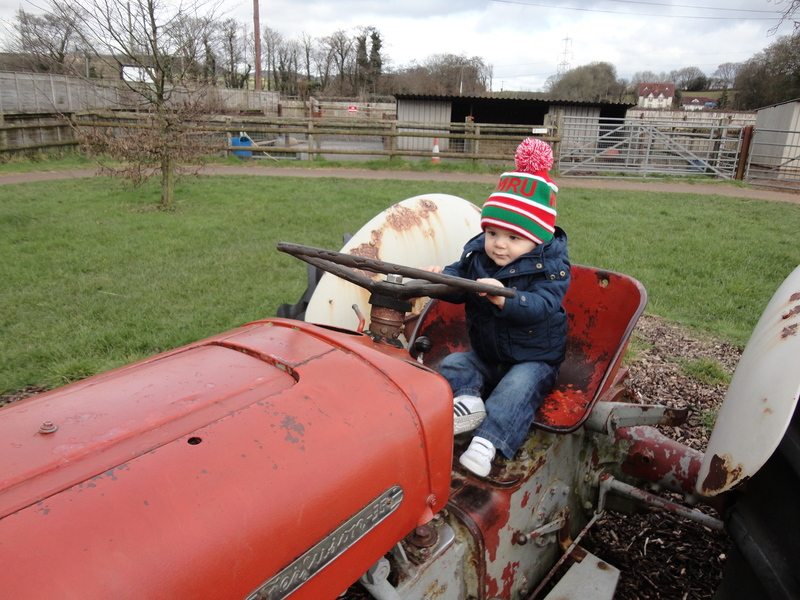 Alfie had spotted a large old abandoned Massey Ferguson tractor and he sat on it and had fun. He looked a bit like Farmer Hogget, who knows where his future career lies, maybe one day he will be running his own farm. Aunt Bes enjoyed going on the tractor as well. 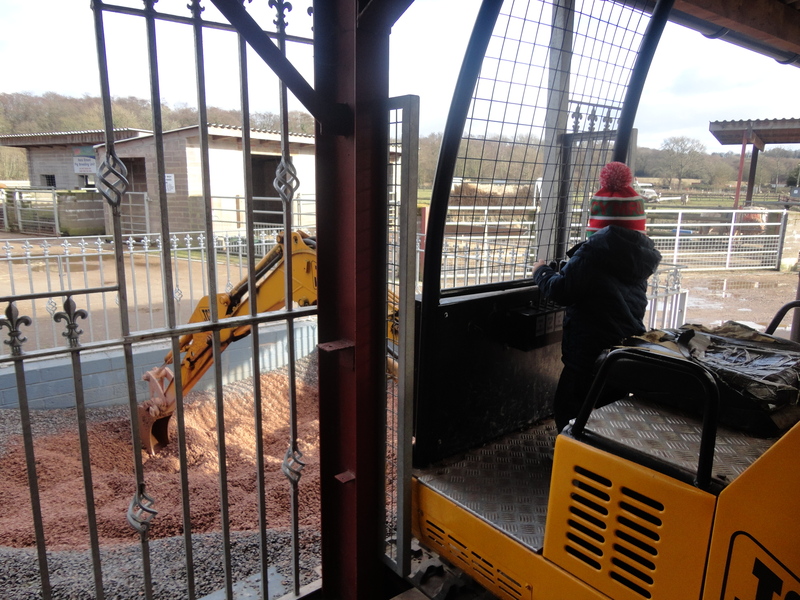 After the tractor we noticed some child sized JCBs. This was too good an opportunity to miss. We made our way back to the barn to have our lunch – all that time with the horses had made me feel quite hungry. I was wondering what the lady of the house had packed me for lunch, probably a tasty Findus Lasagna or a nice well-done Tesco value burger. I had noticed on the way to the farm that in Aldi the prices on the Findus Lasagna had fallen from 7/1 down to 3/2. 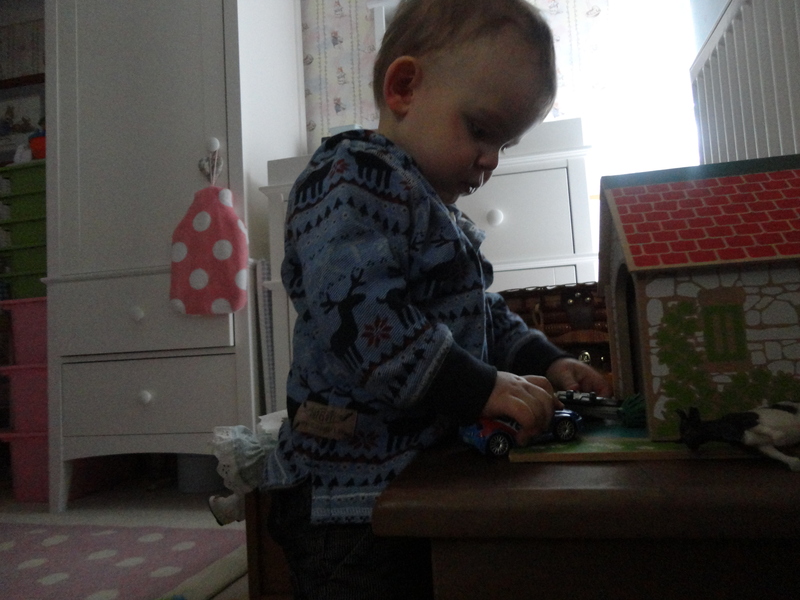 As we did so Alfie noticed some small toy ride on tractors, he was hooked. 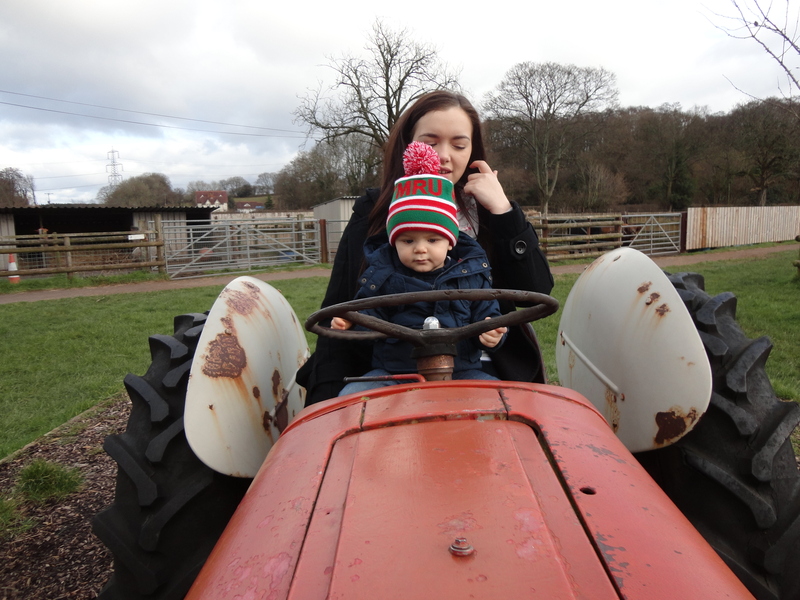 He loved driving around the farmyard with me pushing him, gasping for breath. Aunt Bes was eyeing them up, but realised thankfully that she was not small enough and I had no puff left. 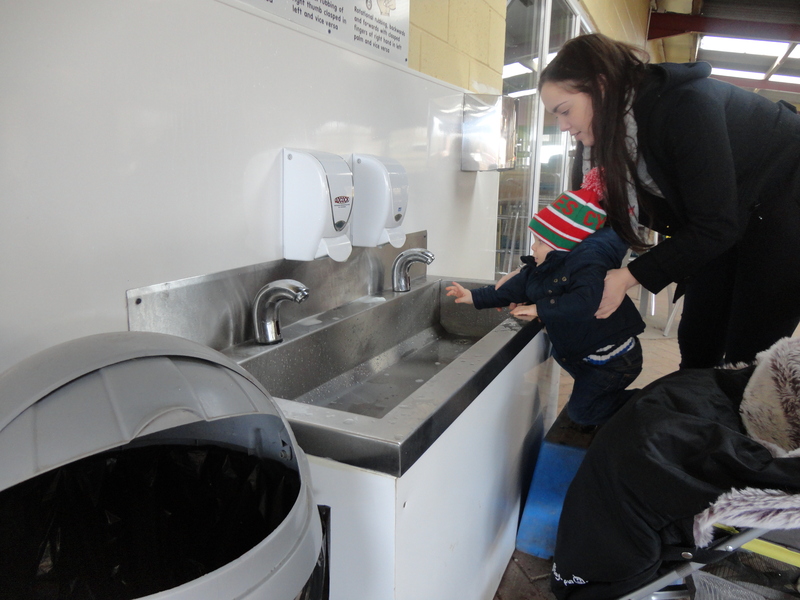 We made our way to the cleaning area and scrubbed our hands thoroughly before heading into the barn for our lunch. Thankfully none of the products contained horsemeat and we enjoyed a leisurely lunchtime together. 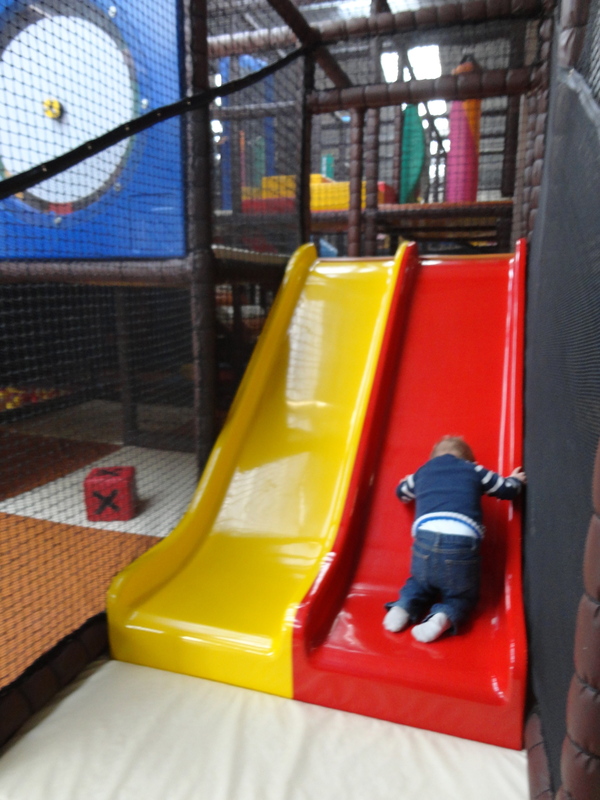 After lunch we headed for the indoor soft play area. When I took Alfie to Coconuts some months ago, he was not all that keen. That was the day we left the Cath Kidston bag in Barry…I still have nightmares and wake up screaming at what could have happened. This time after a minute or so of uncertainty Alfie had a great time. Aunt Bes being younger and more nimble than me accompanied Alfie. Aunt Bes loved this. They played happily together, aunty and nephew and friends. When she needed a break, I took Alfie into the ballpark. It must have seemed funny to the other visitors to see this shoeless, fat, little old man crawling in on all fours, but the struggle was worth it. 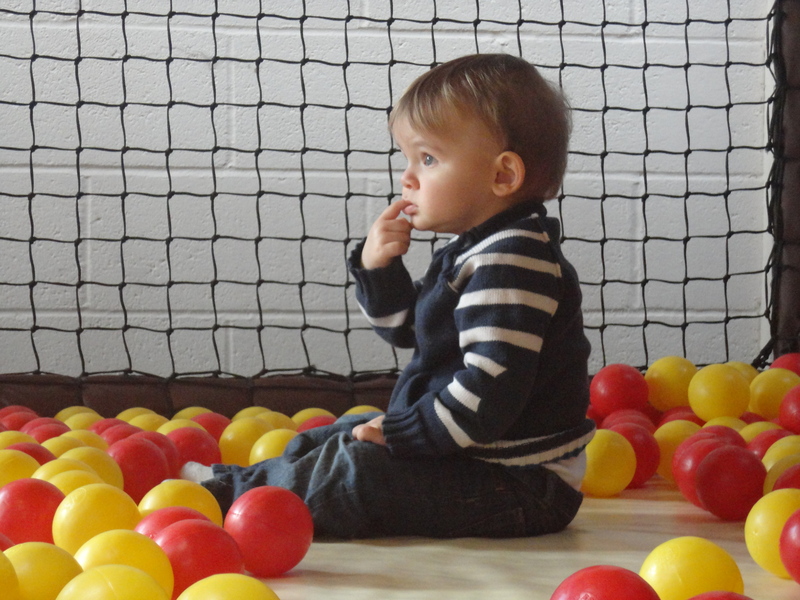 Alfie adored playing with the balls and with other children. 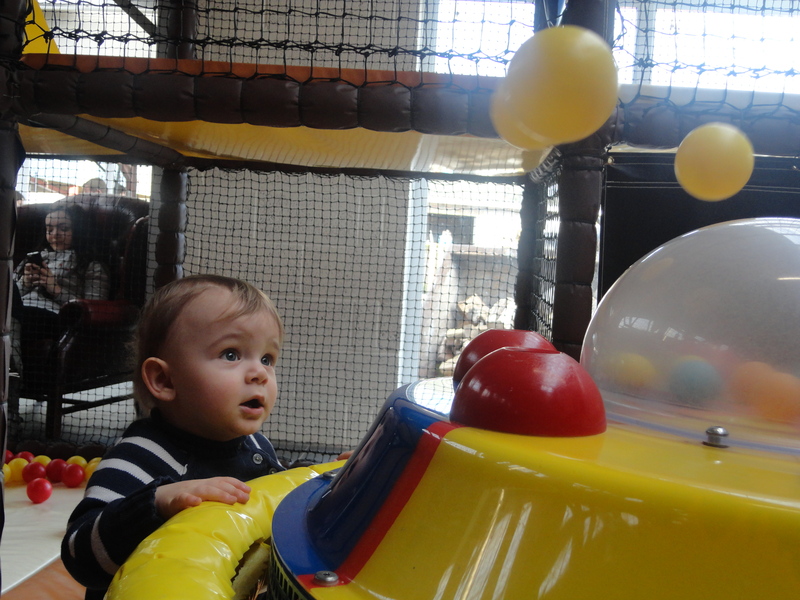 He especially liked this little wind machine, which kept the balls hovering in mid air and managed to throw one ball up make it hover…clever lad. All too soon, it was time to go home. We tidied up, went to see the fish and then left. To leave the farm now you have to walk through the new shop. 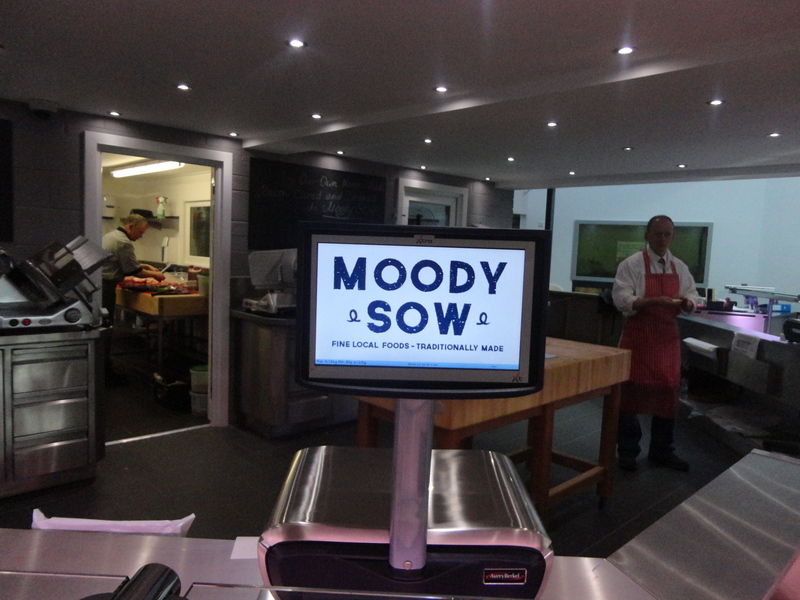 The shop is called The Moody Sow, quite a good name I thought. I suddenly thought of the lady of the house and what I should prepare for her tea. Alfie slept the entire way home Aunt Bes spoke about what a good time she had had. When we arrived home, I realised Alfie was a bit hot wearing his bobble hat, still …… we ended the day as we had begun…with a smile. 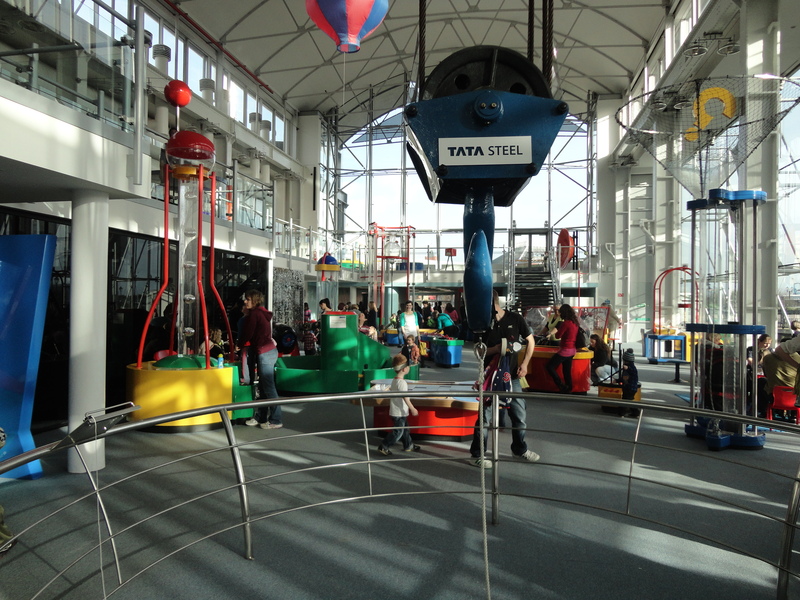 Are you going to Techniquest Toddler Day today? If you are please let me know. I would love to play with you. Alfie and I decided to write this message on Facebook to two very special friends who, having read Alfie’s Adventures made a date to go along. Techniquest Toddler Days are held on the first Friday of every month. Today was Pirates day… it sounded exciting! Alfie stayed over and didn’t wake until 8.00 a.m. just as the lady of the house was about to leave for work. She looked a bit envious, as we talked about what we might do today. Over breakfast Alfie showed me a new game. It’s called ‘Grab the Porridge’. 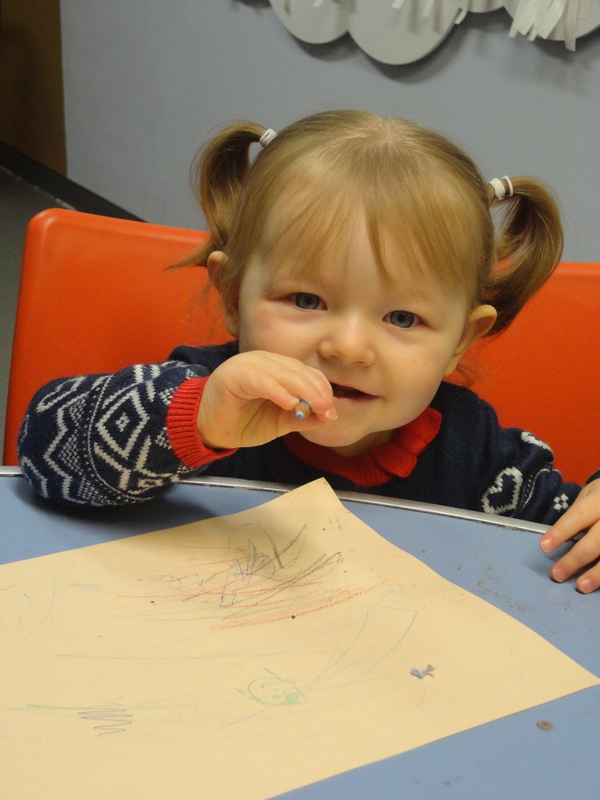 The rules are fairly simple; as your grampy is feeding you and looks away, you have to grab the spoon with the porridge on and hold as tight as you can… and when he turns away to collect a wet wipe you have to see how much of it you can spread over the tray of the high chair. It’s not all that enjoyable, I don’t think, but Alfie thought it was hilarious! I am sure he took too many goes as well. While dressing him he showed me another new game. This one was called ‘Pulling Socks’. What you do is this…when your grampy has put on one shoe and sock and has started on the second you have to try and remove the first one before he notices. You earn points for speed and distance the sock and shoe are thrown. Have you ever seen Grampy Newberry go red in the face? Alfie has! 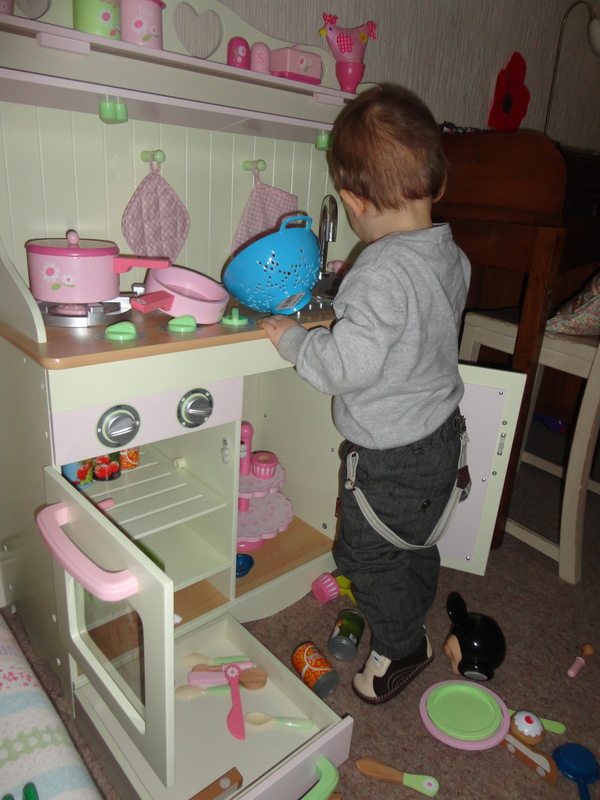 Before we left Alfie had a little session in the pink kitchen. He pretends he is Jamie Oliver and enjoys making me a cup of tea and some toast. We left home shortly before ten and made our way slowly down to the Bay. We parked near The Coal Exchange in our usual place. 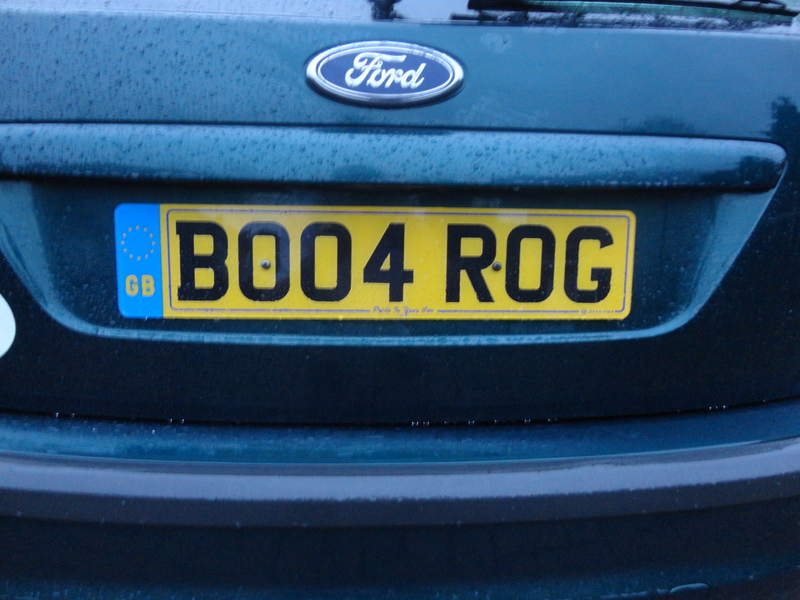 A traffic warden smiled at me as I parked the car. It was the kind of smile a shark would give an unexpecting little minnow before it makes a tasty snack from it. I had no cash on me so could only afford the one hour free option. I could see the warden note it in her book before giving me a ‘see you in 59 minutes’ kind of smile. 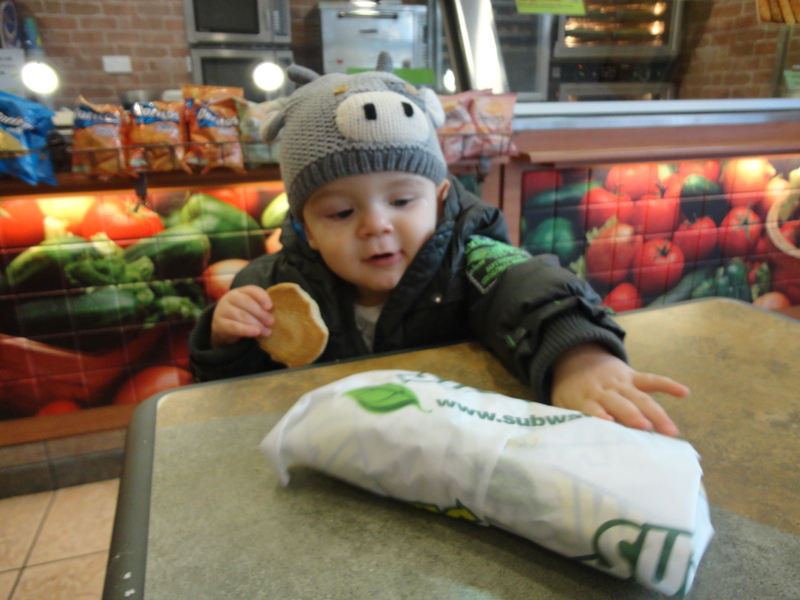 We made first of all for Subway where we had decided to have breakfast. When we got there the Bay was alive with yellow vested individuals, all checking doors and speaking into walkie-talkies. Subway was shut and one of the fluorescent clad workers told me to come back in fifteen minutes. I was worried, breakfast finished at eleven, time was running out. So we strolled around The Bay. It was beautiful. Today was the first day of February and the sky was blue and it was mild. Alfie was wrapped up warm in his stroller. For weeks the weather had been abysmal, but today felt just a little tiny bit like spring. I thought of my friends in school and smiled. 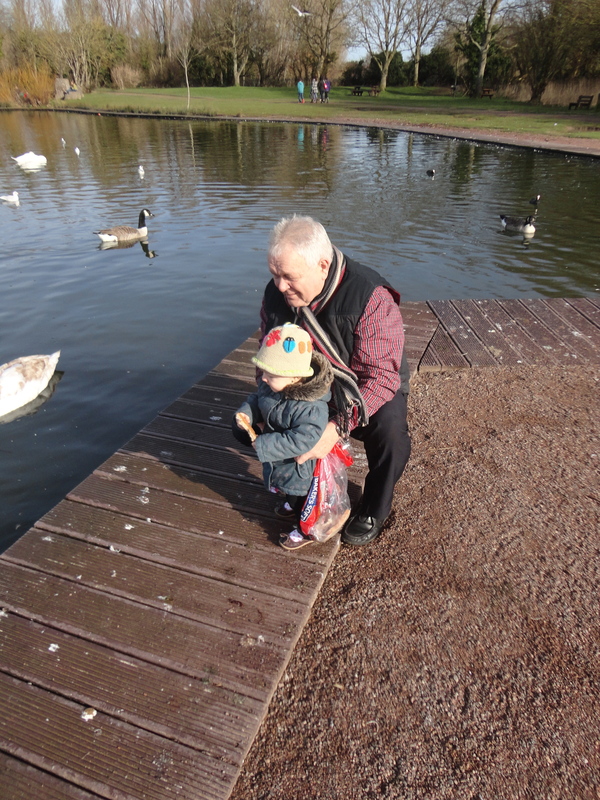 We had such a great time – a little boy and his grandfather out walking in the winter sun. To all who looked on they were just two ordinary people, but we knew we were close friends, who went on adventures together and made ordinary days special. Alfie was singing. When we got back to Subway things were back to normal and the assistant told me there had been special emergency training for staff. I hope they all passed. 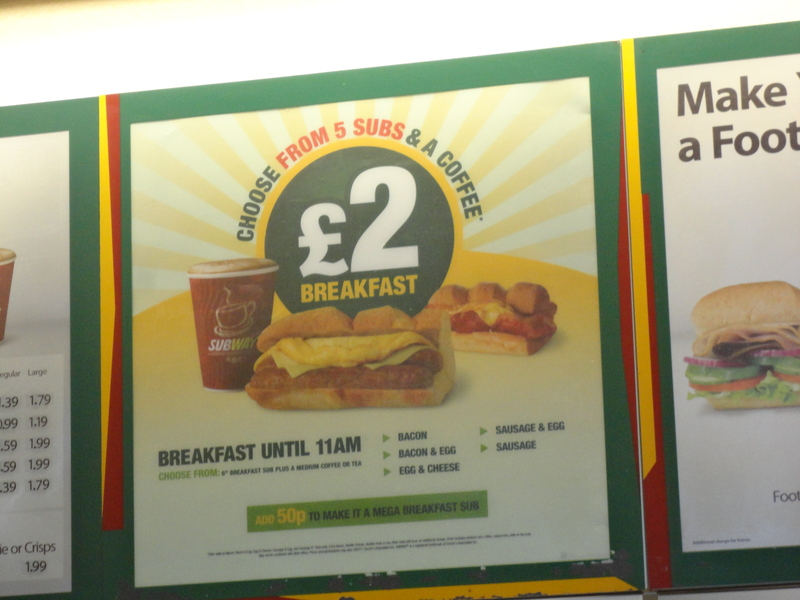 I ordered my bacon and egg Subway roll and a cup of coffee and paid just £2 for the privilege. That has got to be right. 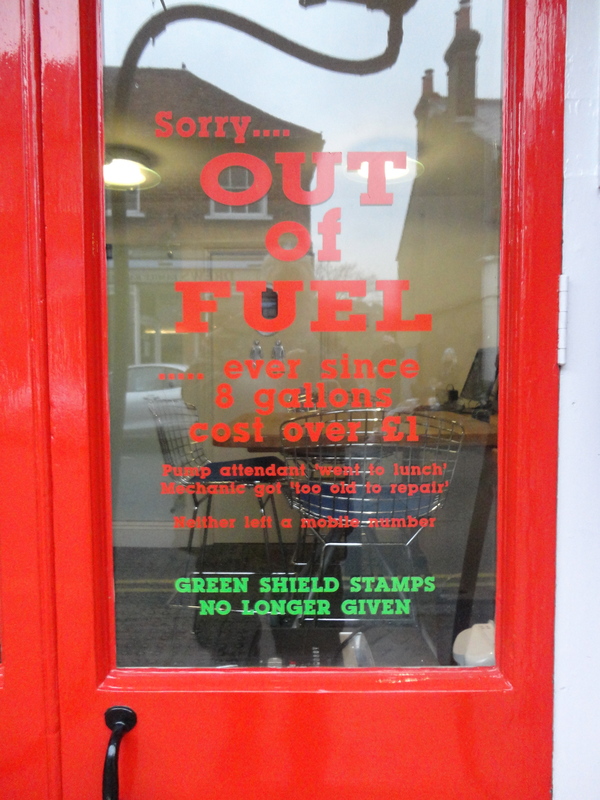 I normally pay more than £2 just for the coffee! 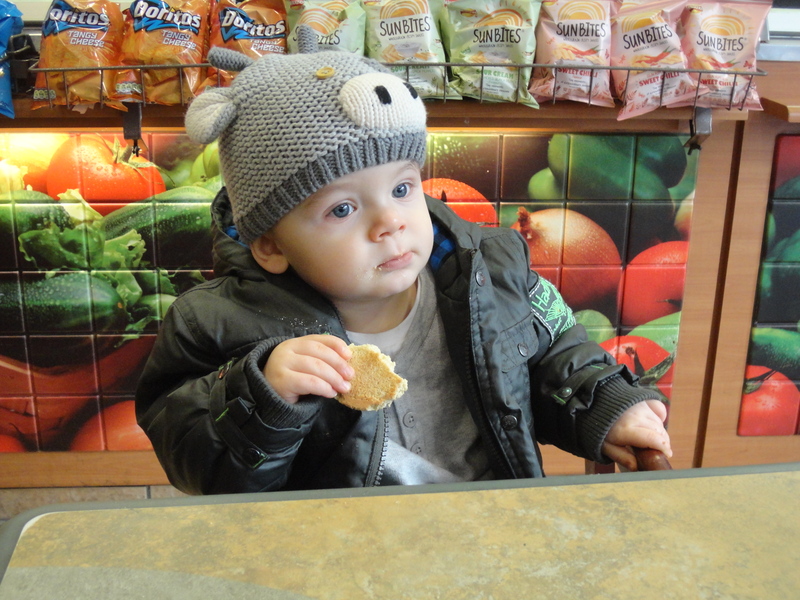 Alfie enjoyed a biscuit, as he had already had his breakfast at the proper time. As usual he took a huge interest in every other customer that came in, especially a group of schoolgirls who made such a fuss of him. The way he interacted with them made me feel so proud. After Breakfast we strolled around the Bay again, before making for Techniquest. 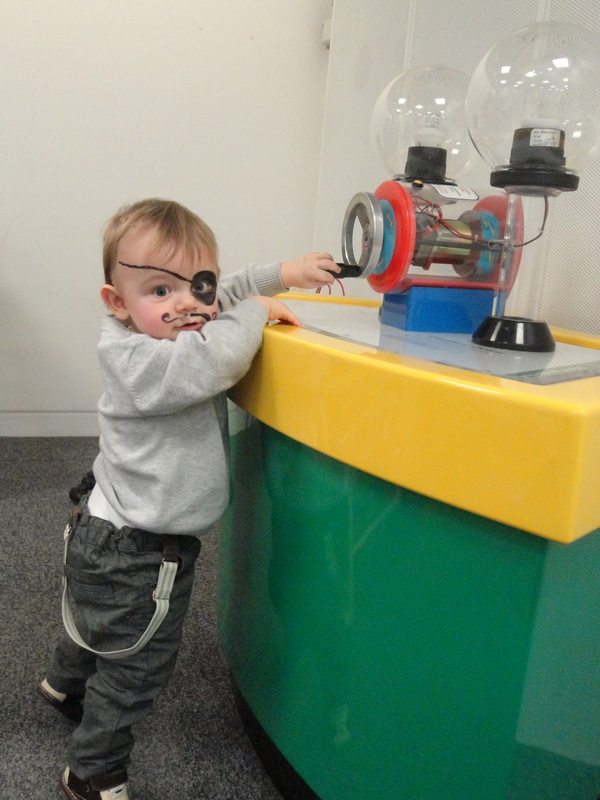 I paid my entrance fee and proceeded into the mayhem of Techniquest Toddlers’ Day. I looked for Emelia and Asa but guessed I was too early, but I was delighted to see five very familiar faces…my day was made. It was Keri, Princess Mia and Angel Millie along with Krista and my lovely little friend Lily. I was made up – this was a totally unexpected surprise. On the way Alfie had fallen asleep, so I was able to play a little bit with the girlies. It was BRILLIANT. Eventually Alfie woke up and was excited about the day ahead. He just had time to play a while with his cousins before Keri left to take Mia to school. When we alone we set off looking for fun and we found it more or less straight away on the face-painting table. 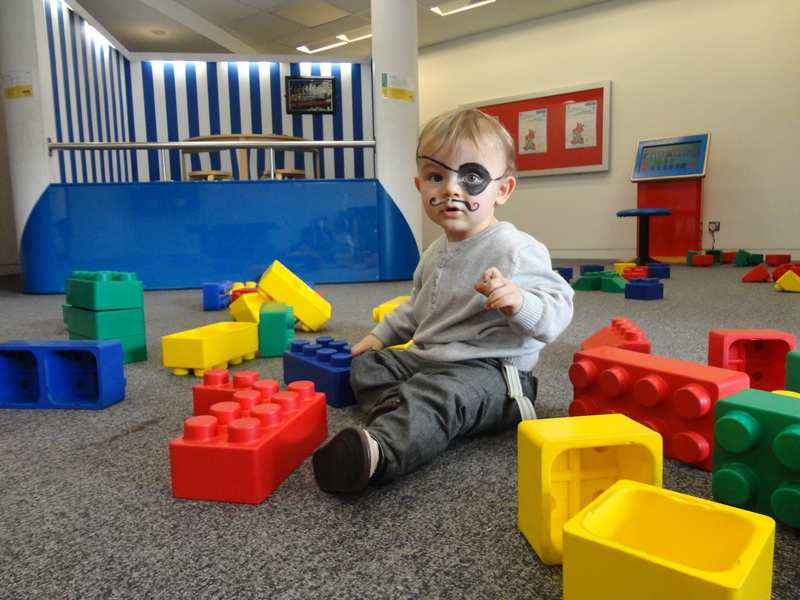 Alfie decided to be a pirate, the theme of today’s toddler day. 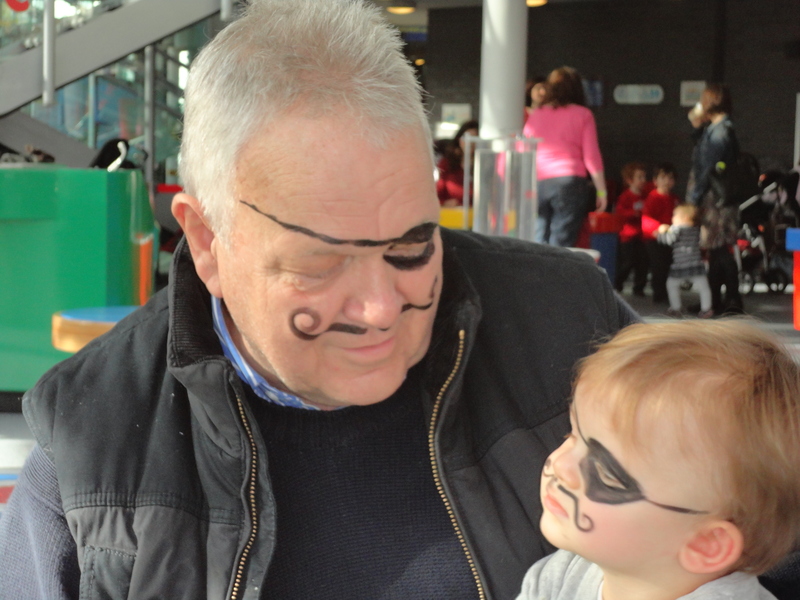 He sat brilliantly to be made into a real pirate…and then I asked to be done. The girl thought it was a real hoot and some of the young mums were laughing aloud. 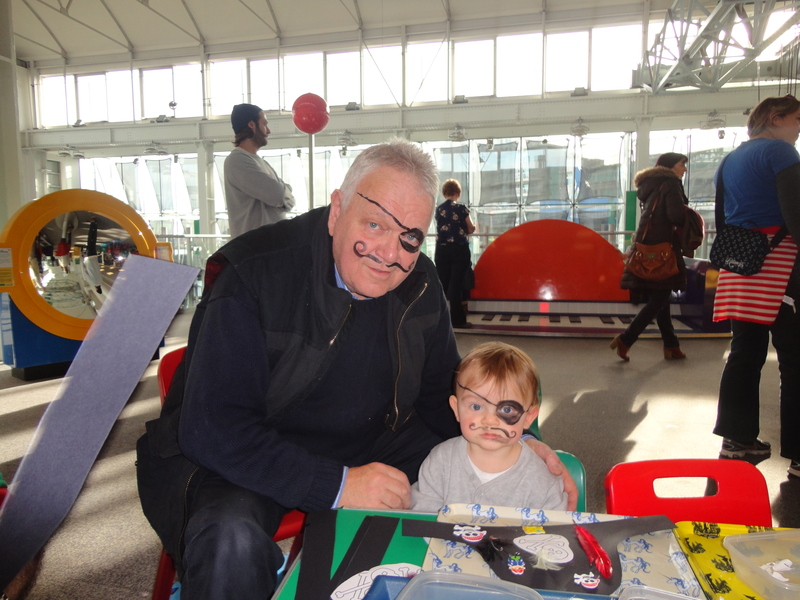 I enlisted the help of one to act as official photographer for Able Seaman Alfie and Jolly Roger. Avast Ye Landlubbers! 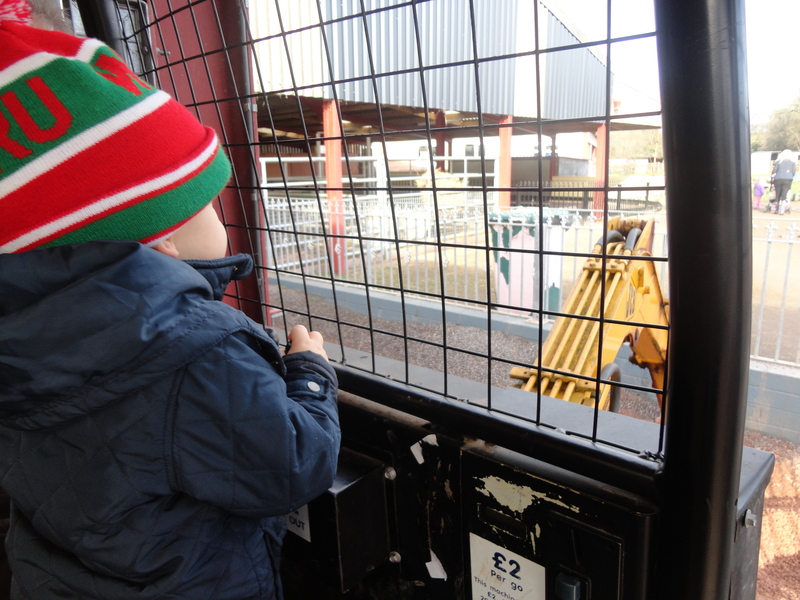 Alfie then had a go on several of the exhibits before playing with the giant Lego and having another go on the giant piano he had been on with Millie some weeks before. He kept making for one note in particular the C flat and I wondered if it was a sign that when he grows up he will be looking to live in a musicians apartment near the coast. 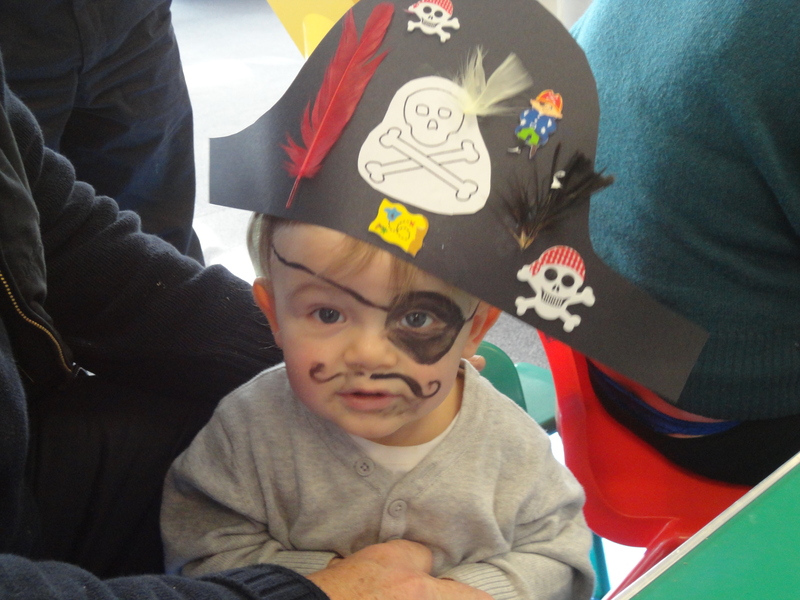 We then moved on to make a real pirates hat. Alfie’s was superb, but I lost the courage to ask if I could make a hat for myself. I was tempted but then I remembered I am sixty-two! It would have gone so well with my face too! Never mind!! 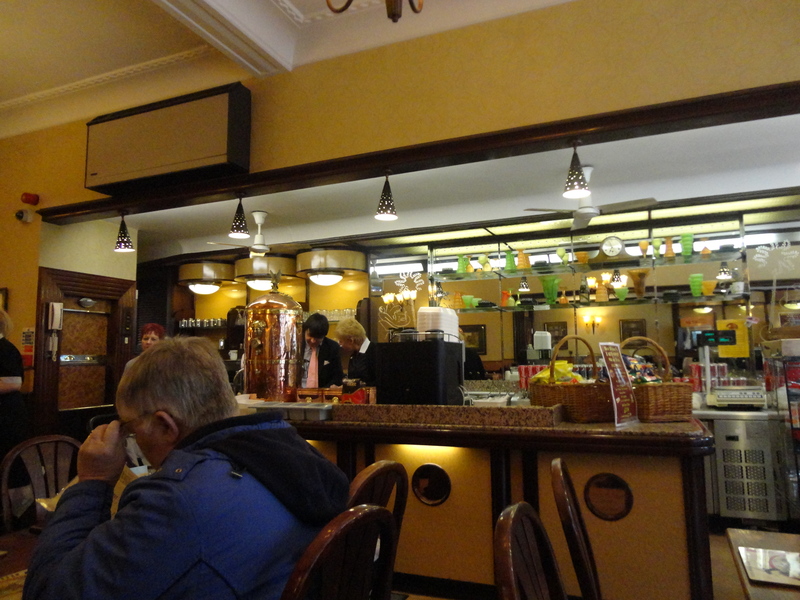 It was time or lunch by now so we made our way down to the café. The staff in Techniquest are just fantastic and as I walked up to the counter with Alfies food in my hand the assistant smiled and said… ”Thirty seconds?” even before I even asked, I like that! As we sat down to eat, I met an old Glyncoed family. I was so pleased to see them, even though I felt a little nervous as I struggled for words. This family has just gone through the most unimaginable tragedy with quiet dignity and I have enormous respect for them. They have just lost their son, a wonderful young man named Sam. I taught Sam some years ago now; he was the most fantastic pupil. Sam contracted Motor Neurone Disease despite being a very young man. He battled with it for two years before it took him. I cannot understand how the family have coped, but they have and in doing so have inspired many with their strength and courage. They were with their daughter, Sam’s sister, and their grand daughter a beautiful little girl called Poppy. I looked at her and could only think how having this precious new life would have helped them come to terms with the loss of Sam. We sat on the same table and fed the little ones and I was sad when they left us. Alfie finished his lunch and was ready to explore further. 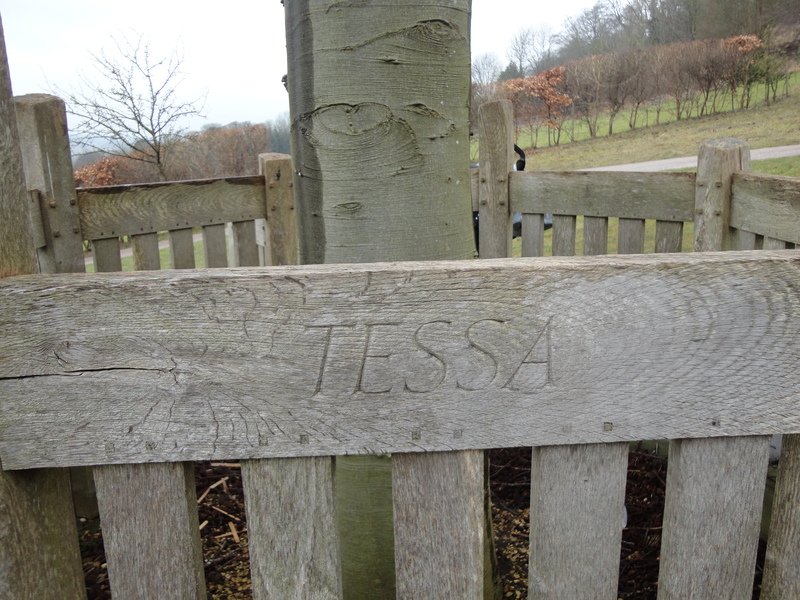 We had a little walk around but still could see no sign of Emelia and Asa. Eventually we left and as I was walking across the car park I realised I had forgotten to pick up my complimentary drink. We turned back and as we re-entered I was struggling to find the coloured band I was wearing which shows I had paid. The guy on the desk burst out laughing and told me that he didn’t need to see the band as looking at my face was proof enough! I remembered I was Jolly Roger! Silly me! We met Asa and Emelia outside as we were leaving. Asa had an appointment, which had gone on longer than expected. We promised to meet up again soon. I was sad we missed them, but I knew they would have fun, just as we had done. 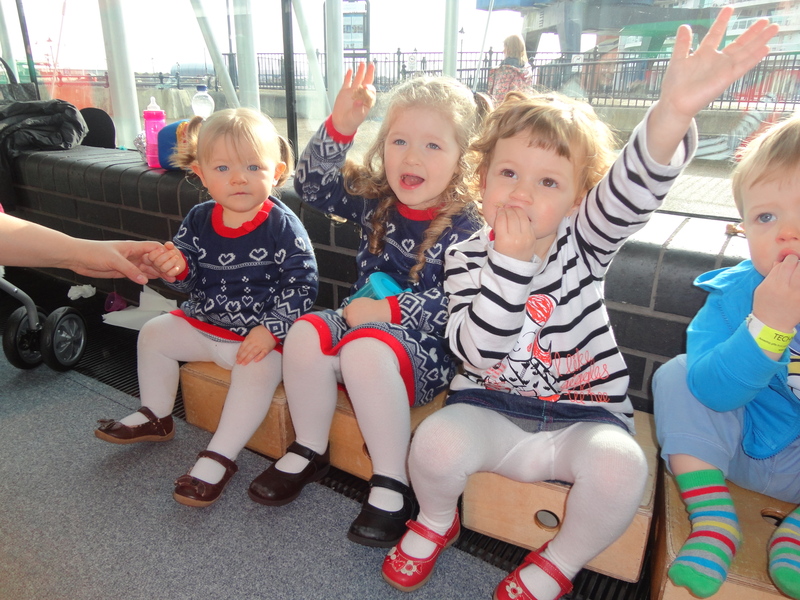 After Techniquest we headed for Penarth and a visit to Nana Muz. 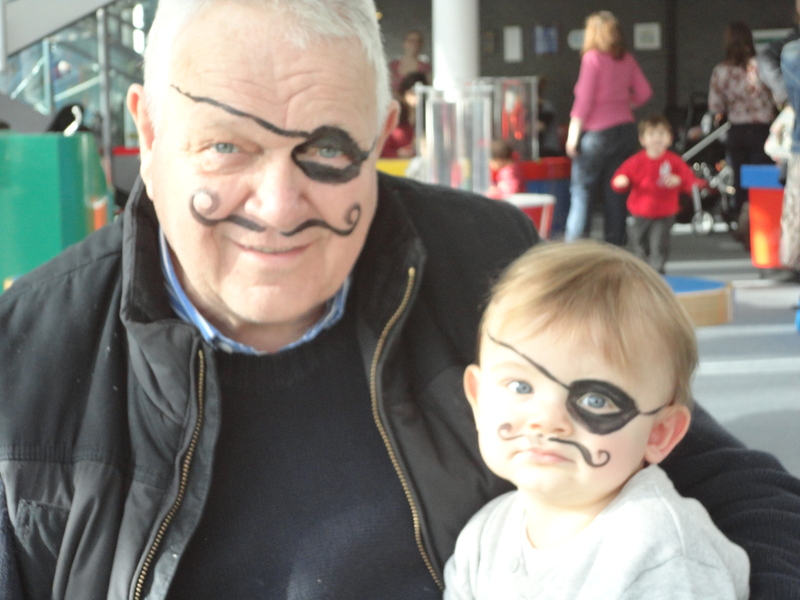 We caused a riot in the home; all the staff were popping in to see the fat, jolly pirate and his little pirate lad. Beat enjoyed our visit and loved the family calendar we took in. She is a great lady and would have loved Alfie had her mind not been cruelly taken from her. Still she appreciates seeing the little ones who are so good at going in to visit. We made our way home and greeted parents, Aunt Bes and finally the lady of the house as they came home and burst out laughing at the pirates! I am so glad my little friend and I can bring a little bit of happiness into the lives of those we meet each Friday. Adventures with Alfie Day 14 is dedicated to the memory of my old pupil Sam Hully and his remarkable family.